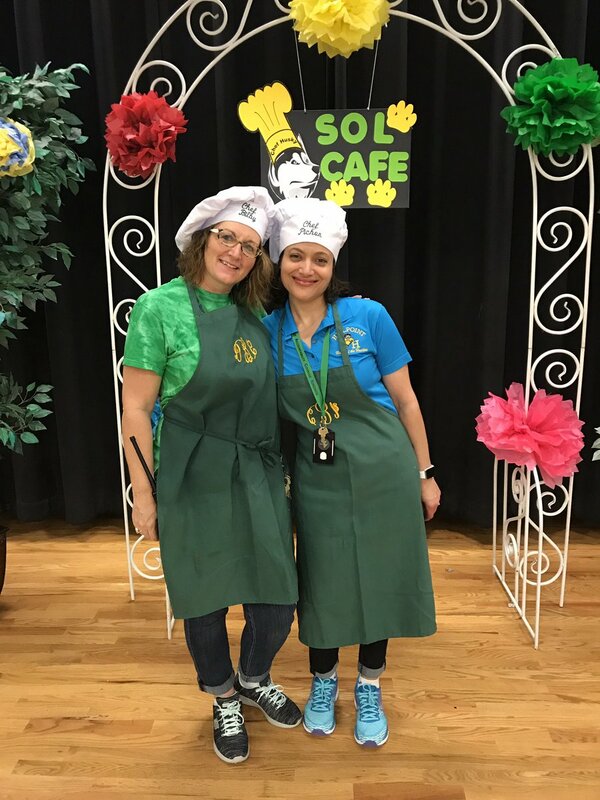 Thank you to all of our wonderful staff members for making last night’s SOL Cafe night a success! 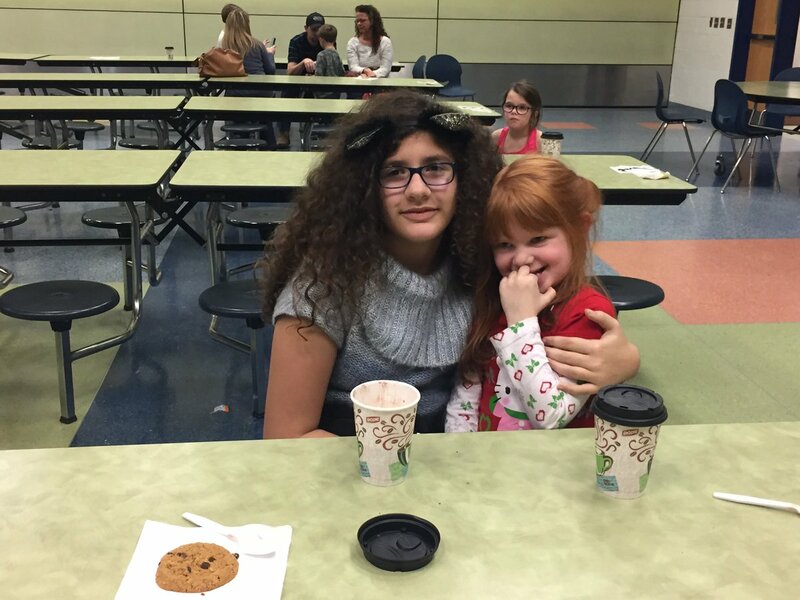 And thank you to our wonderful families to coming out to support our school! 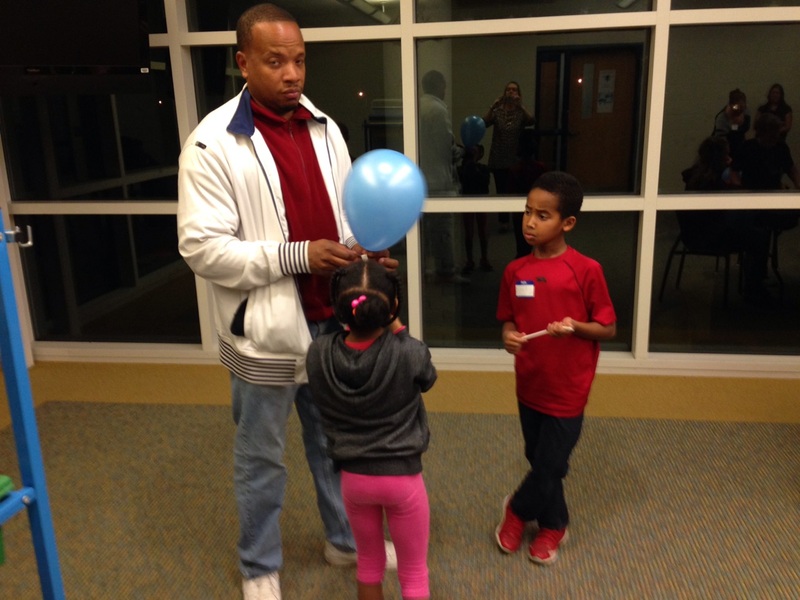 Please click the link below to see more pictures from our night! 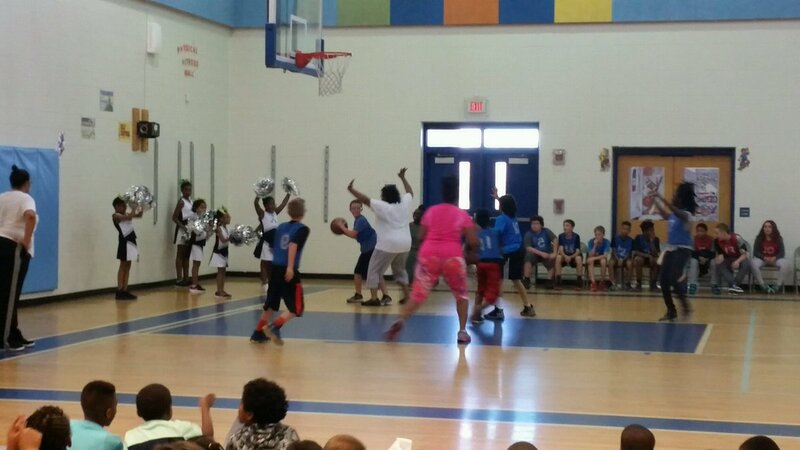 Students vs. Teachers! 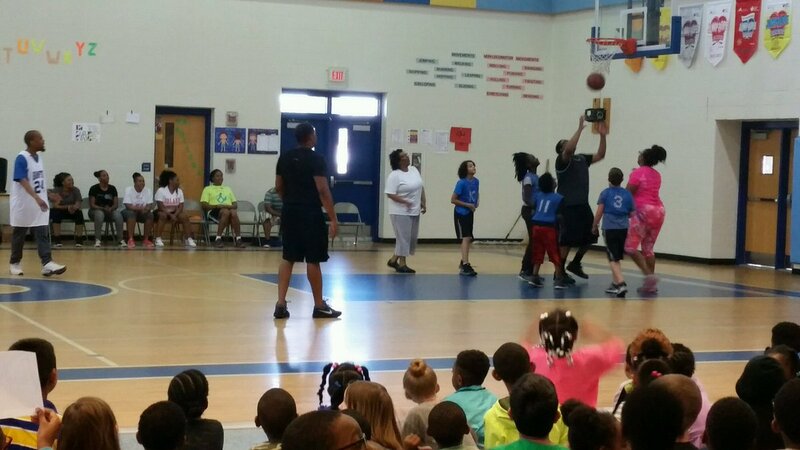 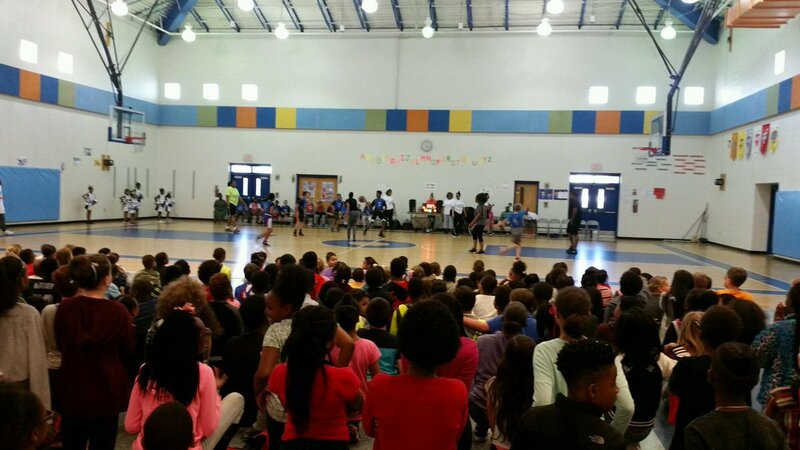 To raise money for Jump Rope for Heart students participated in a basketball game. 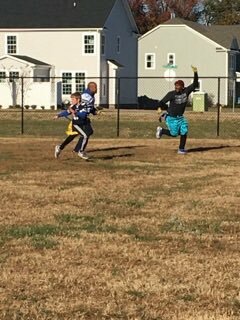 Old Dogs beat the Young Puppies by 4 points. 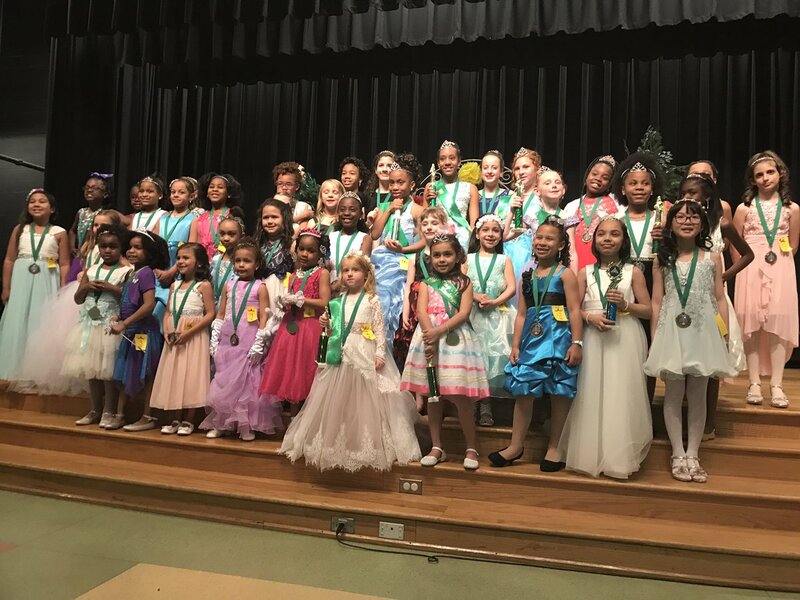 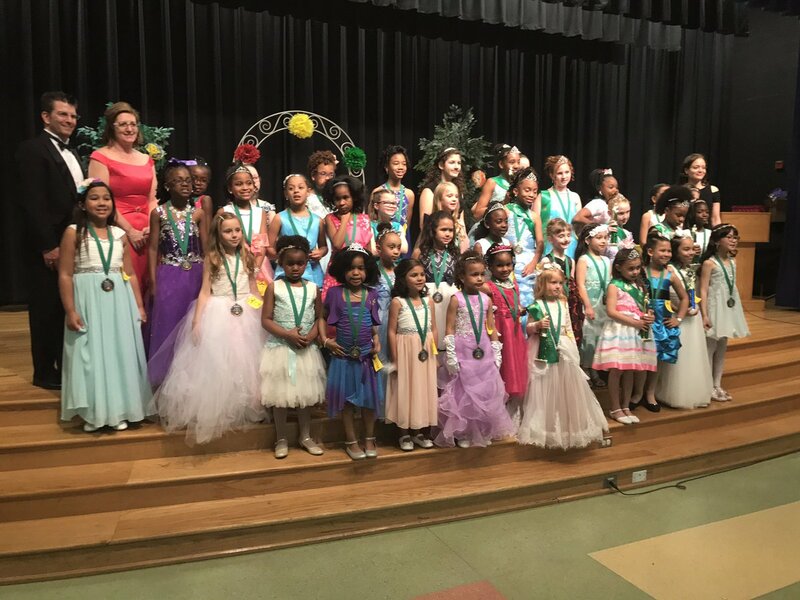 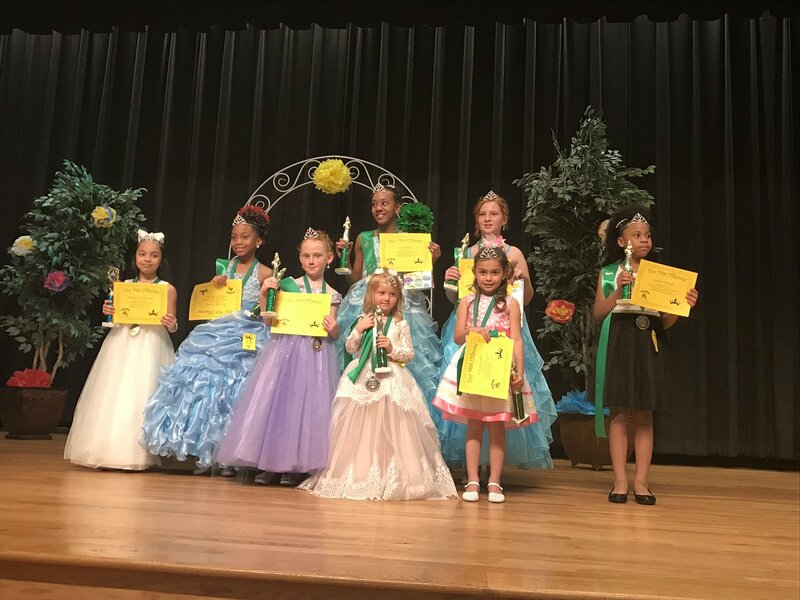 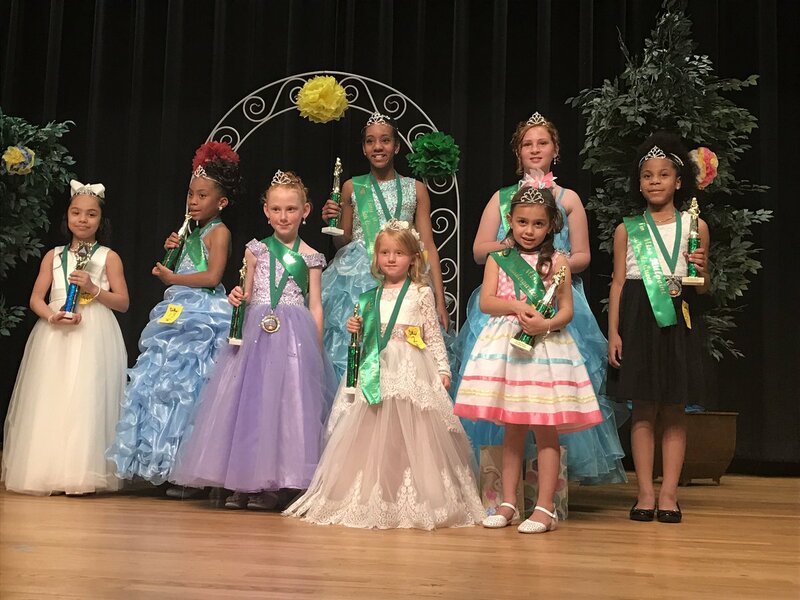 To raise money for March of Dimes, Hillpoint hosted its first Little Miss Hillpoint Pagent. 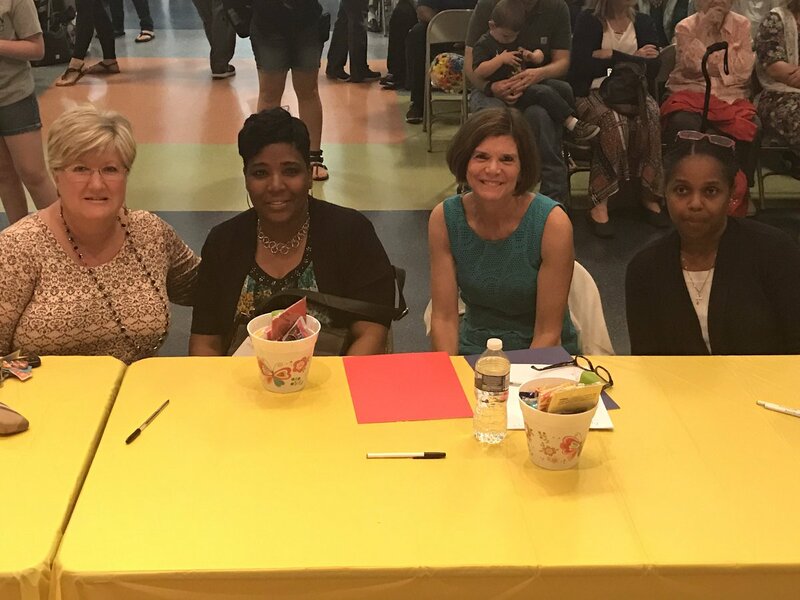 Thank you to all of our lovely participants, judges, and hardworking volunteers for making this night a success. 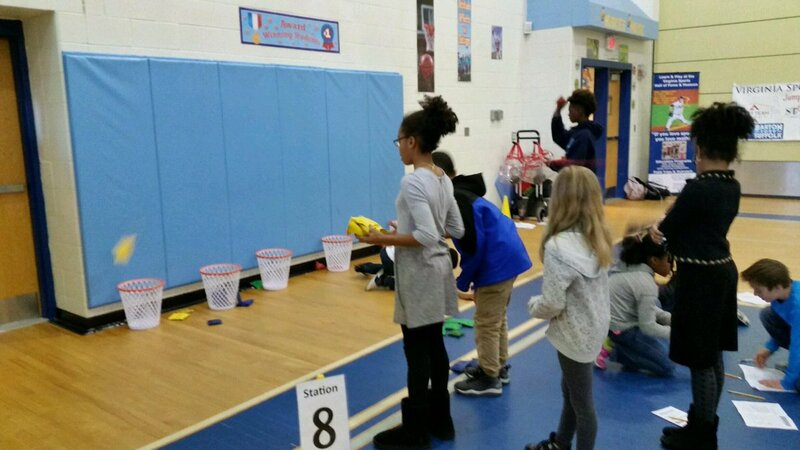 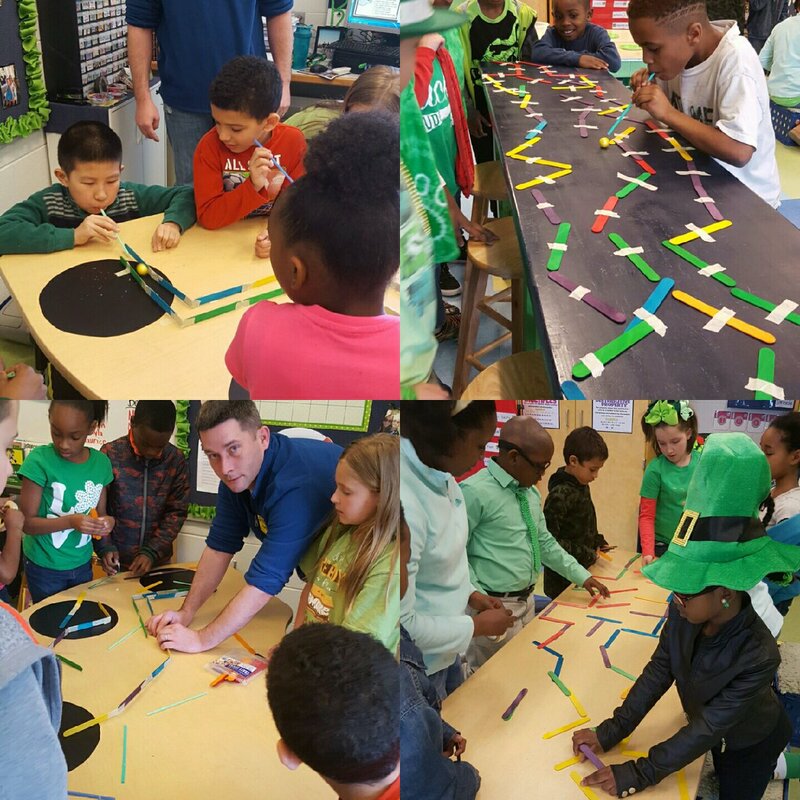 3rd grade students created and participated in STEM challenges to celebrate March Madness. 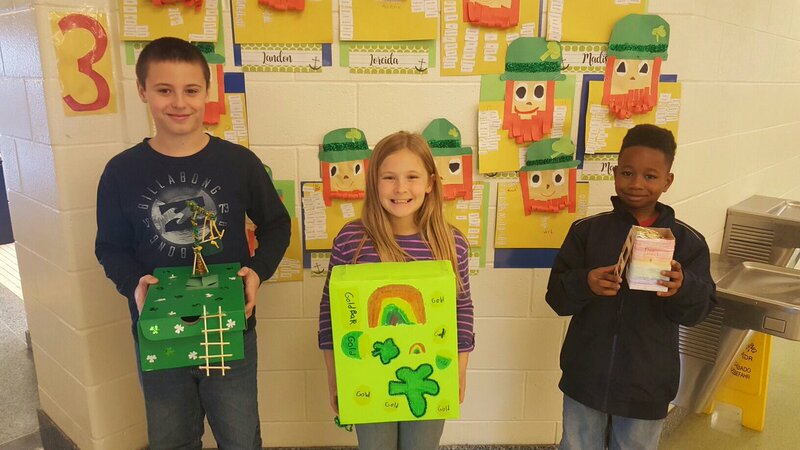 Go Teams Rainbow, Shamrock, and Leprechaun! 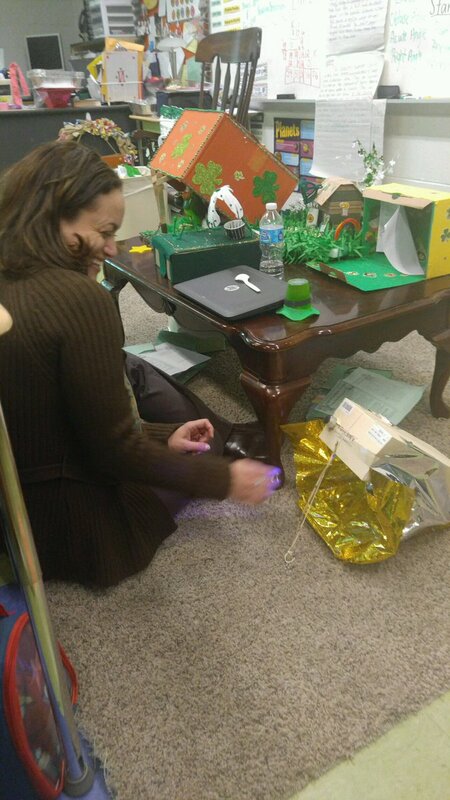 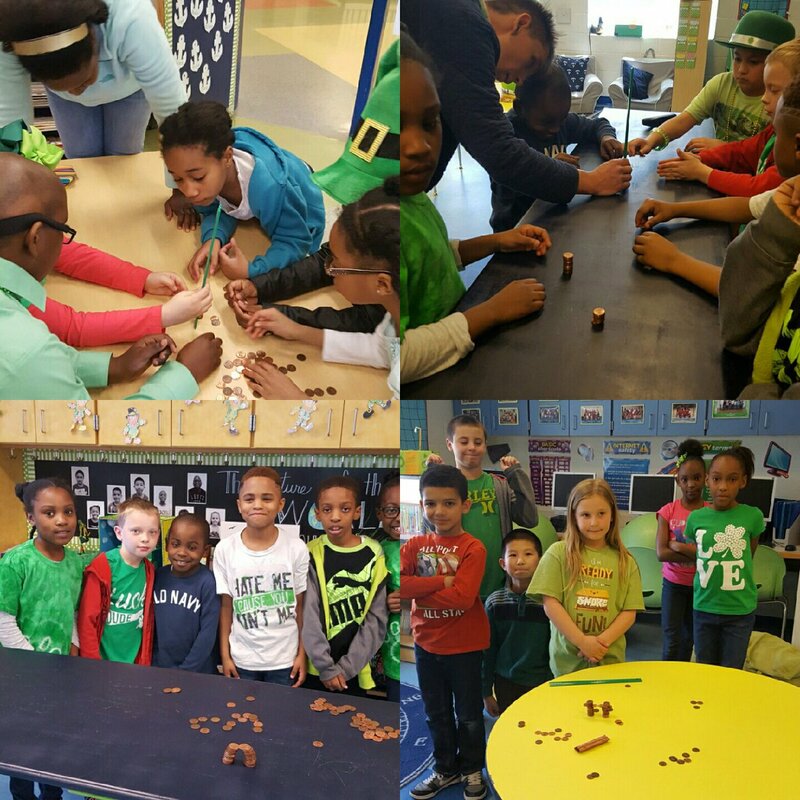 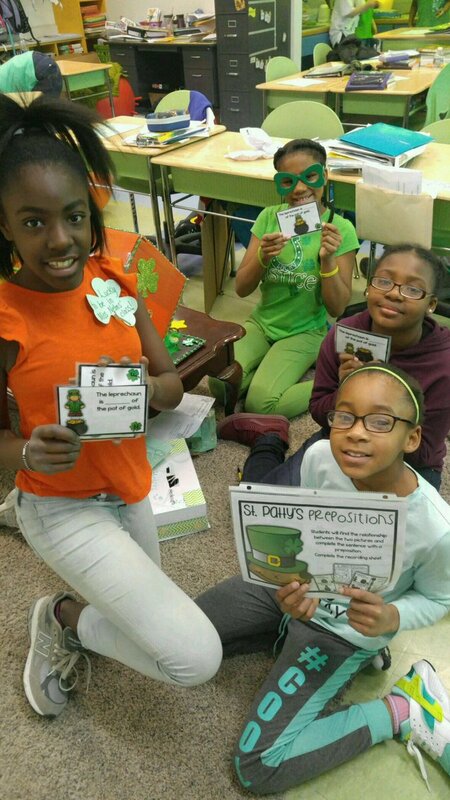 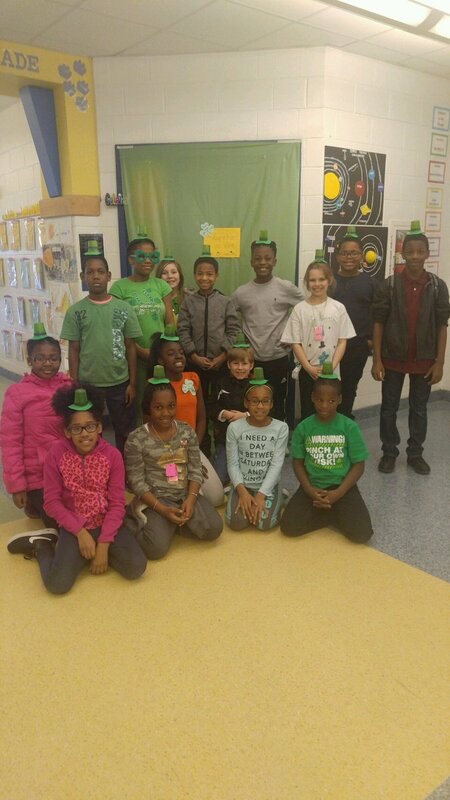 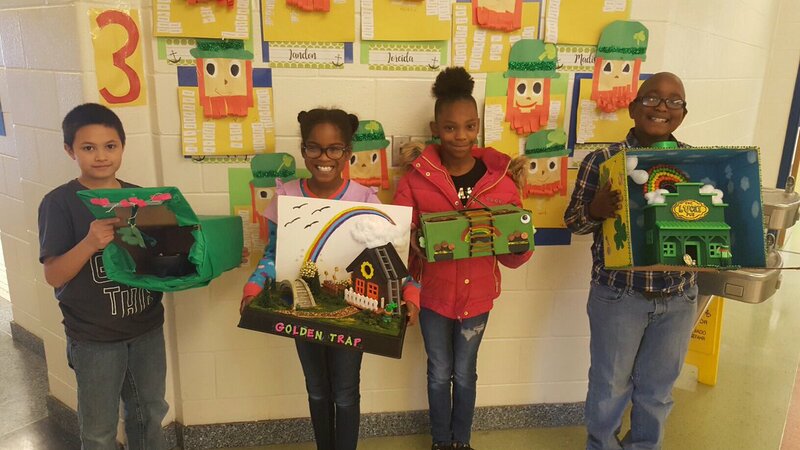 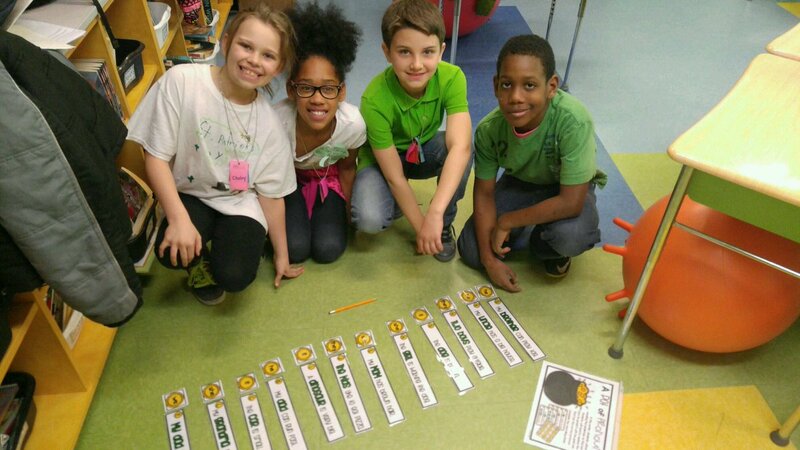 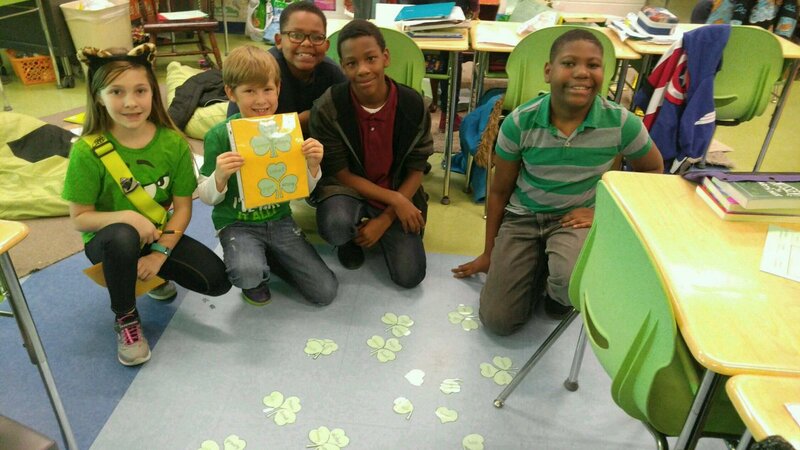 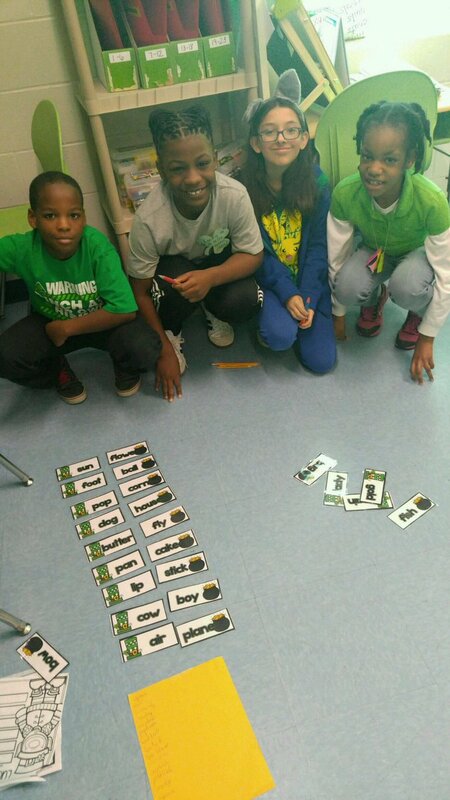 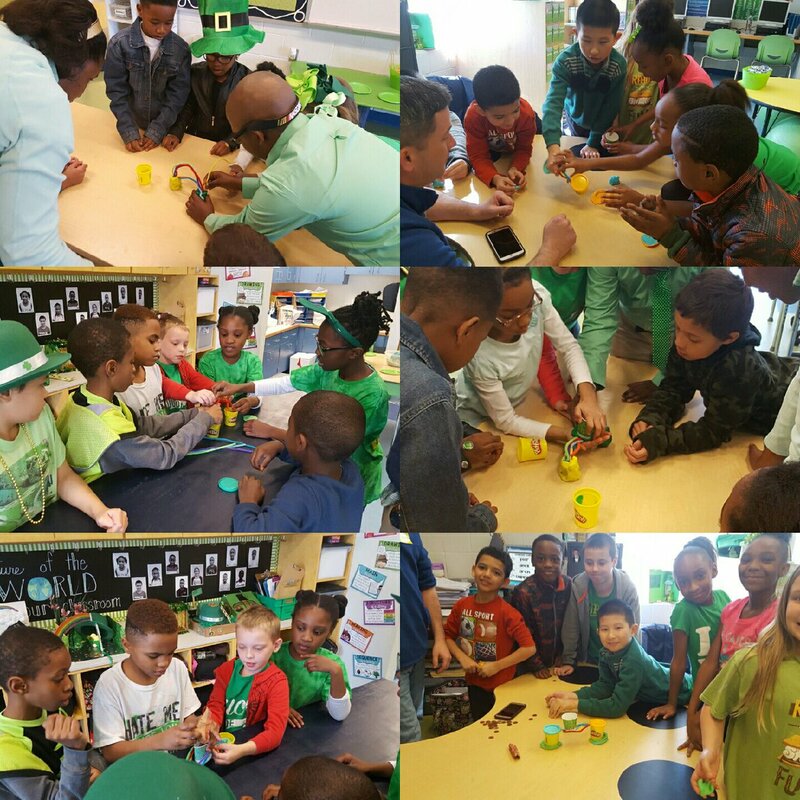 Students and teachers took advantage of Saint Patrick’s Day to fill their day with green learning fun! 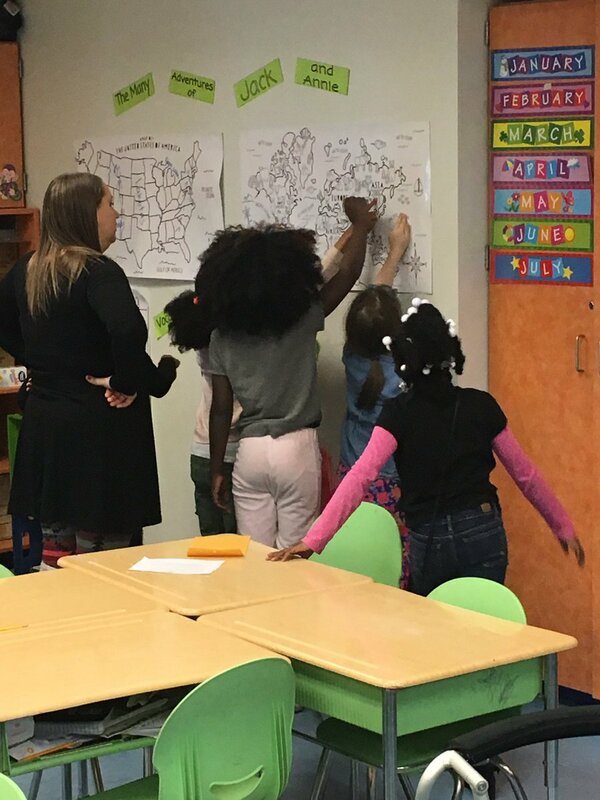 2nd grade students explored concepts of Egypt and China as a culminating activity for their unit on Ancient Egypt and Ancient China. 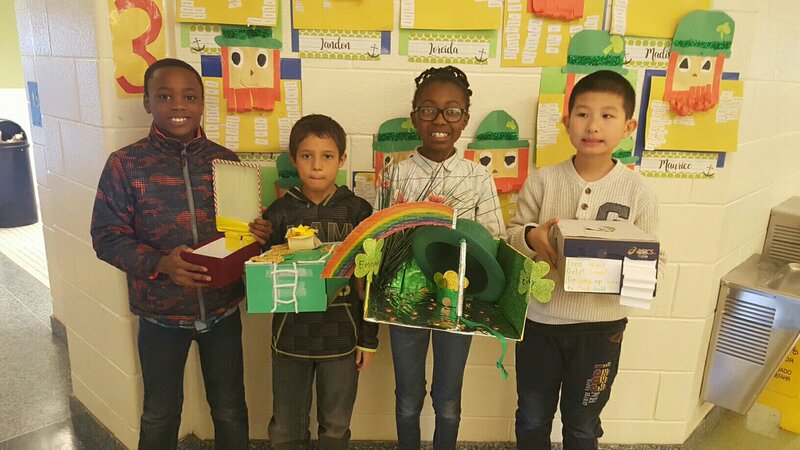 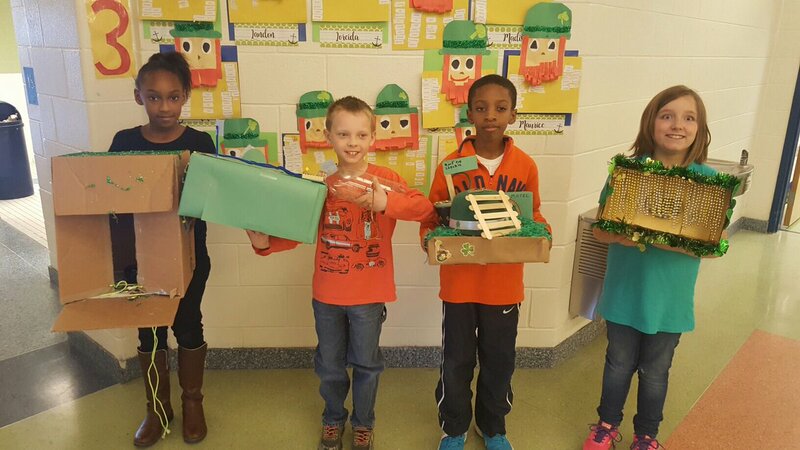 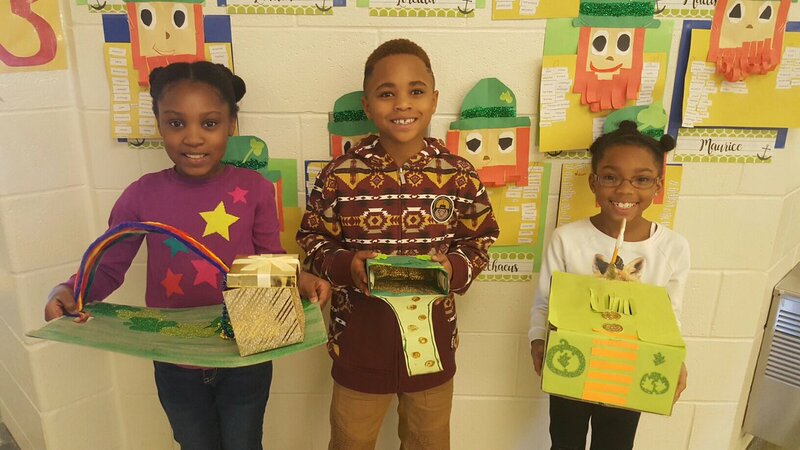 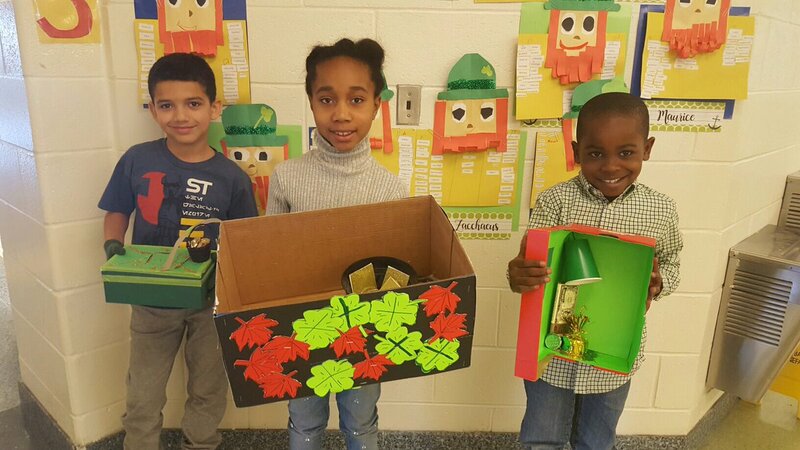 3rd grade students constructed and tested working leprechaun traps! 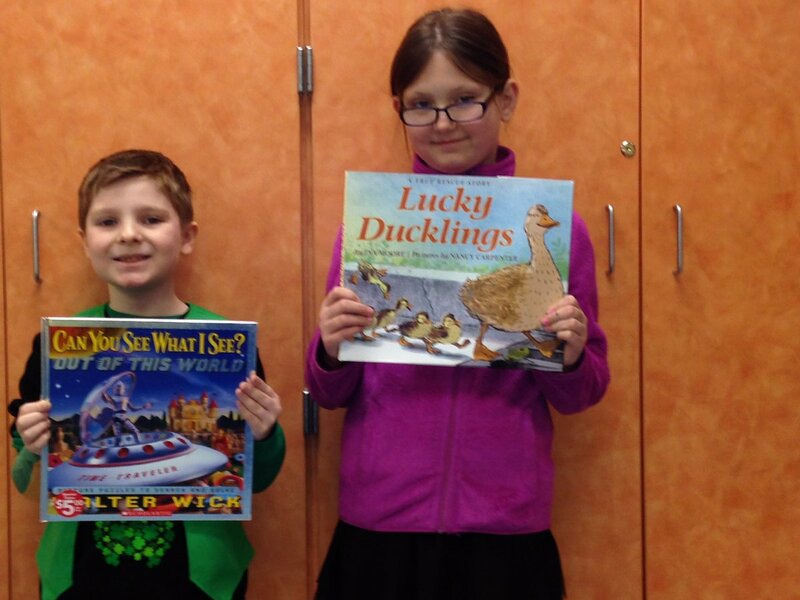 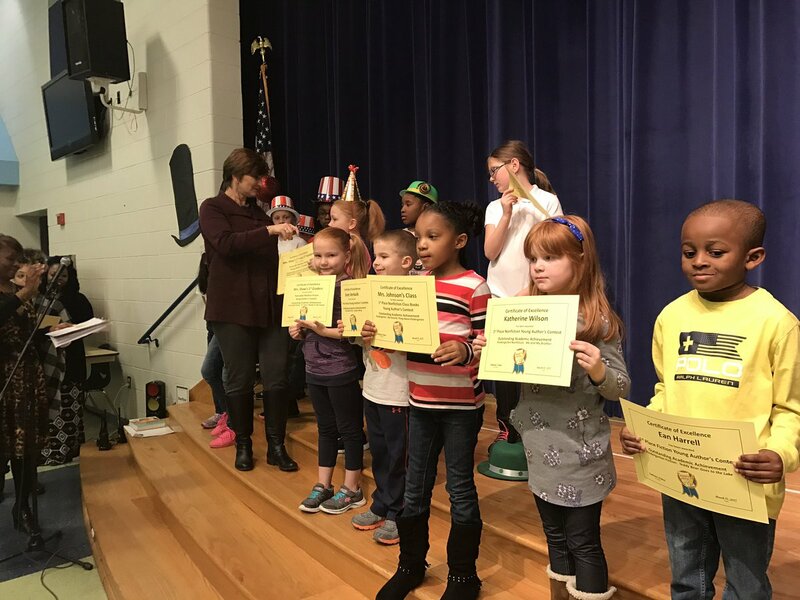 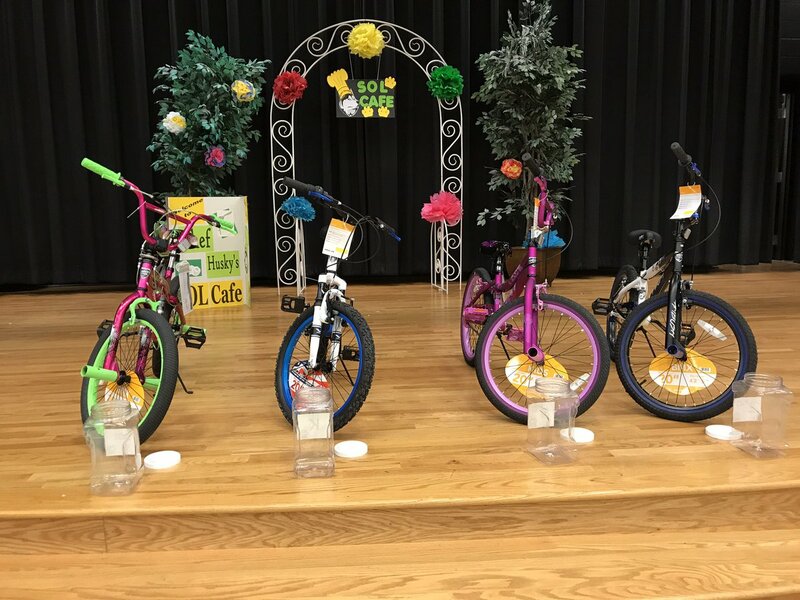 Winners of the Young Authors contest were celebrated at our March PTA. 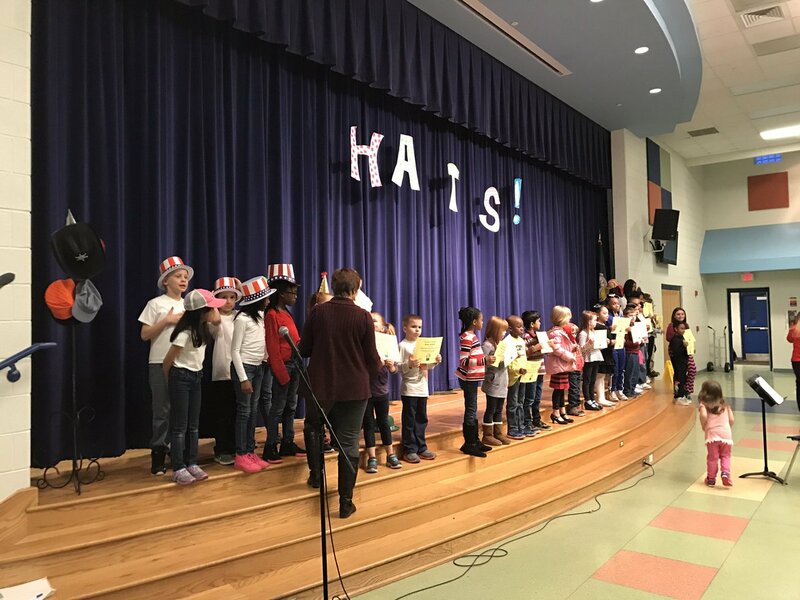 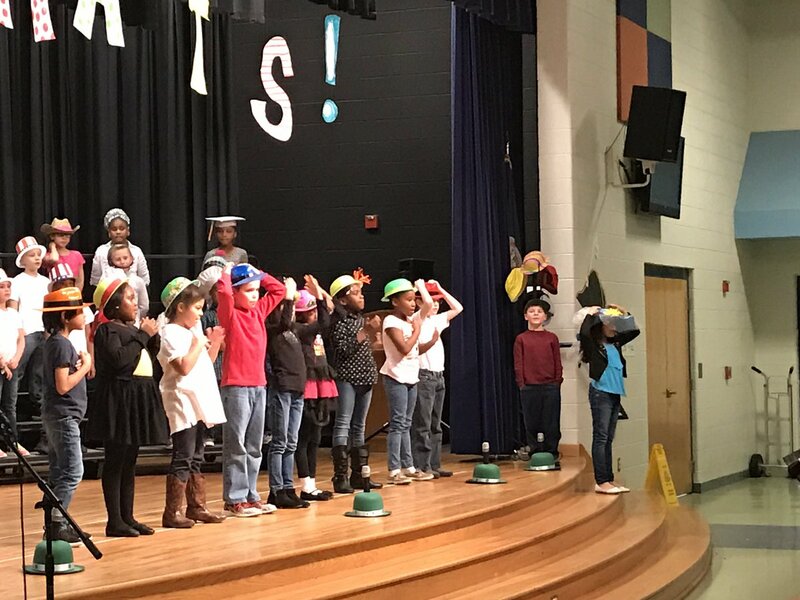 Hats off to second grade! 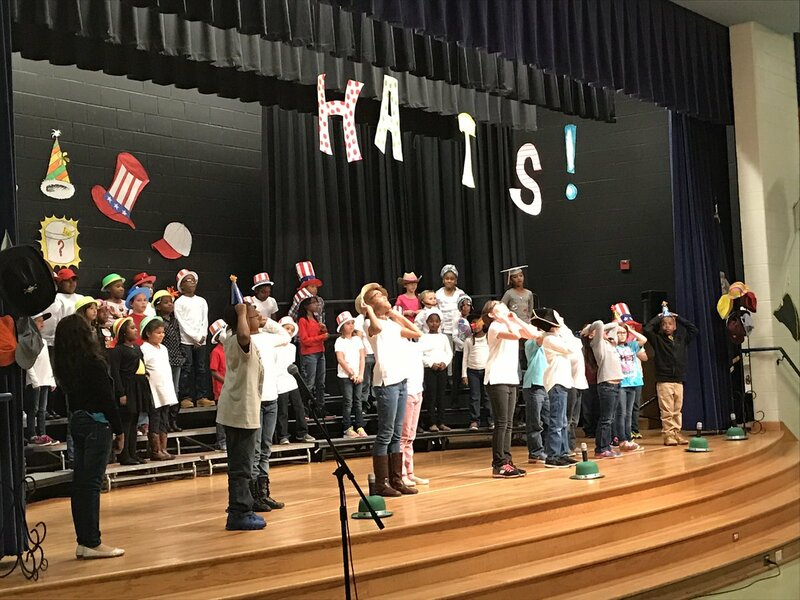 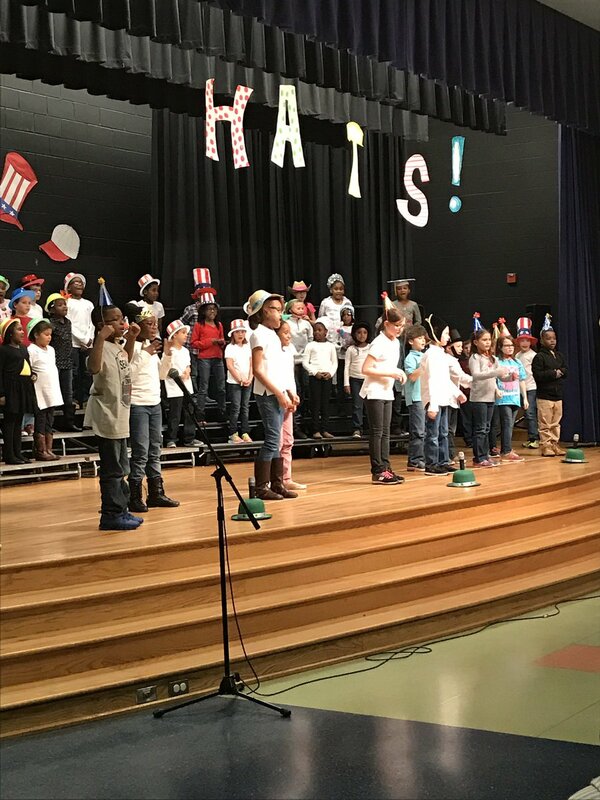 2nd graders performed “Hats! 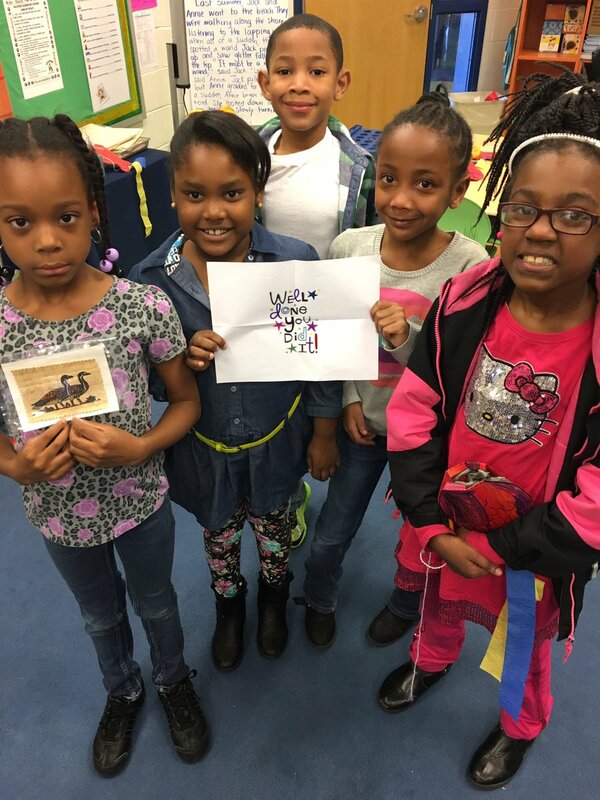 A Musical that celebrates what’s underneath” March 14. 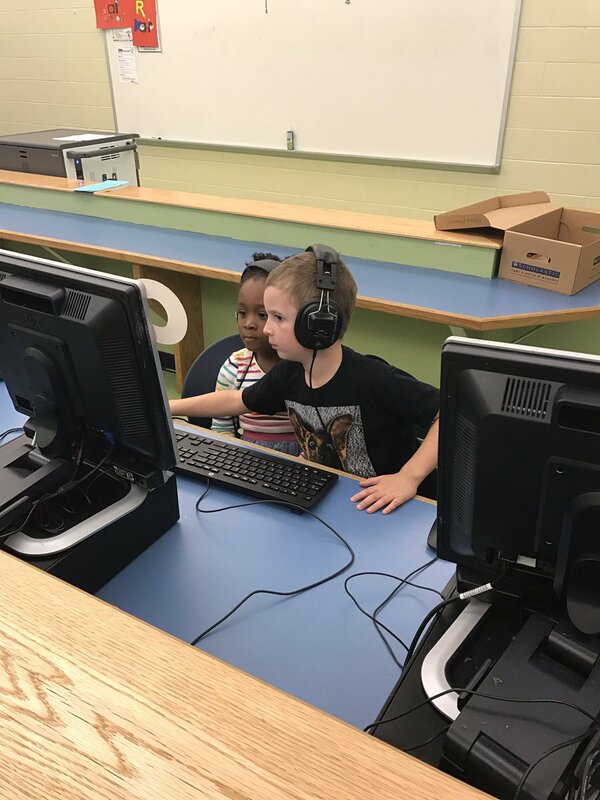 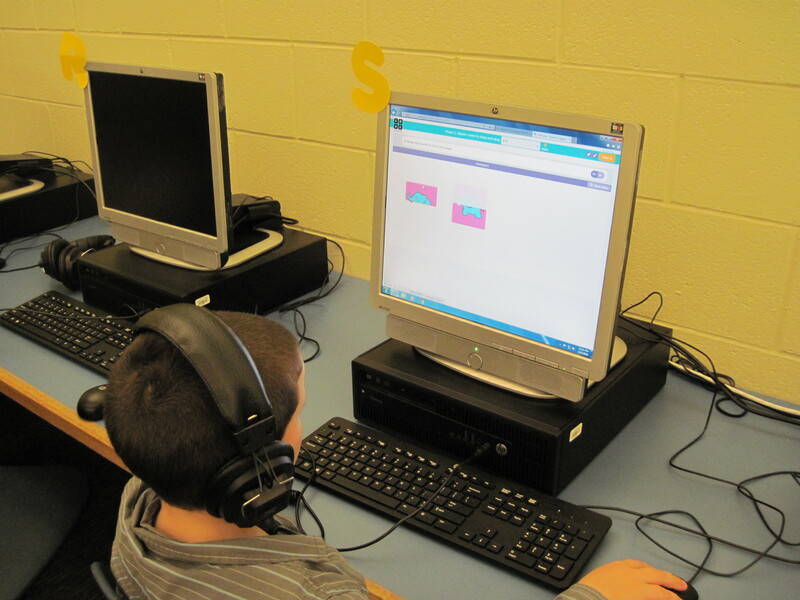 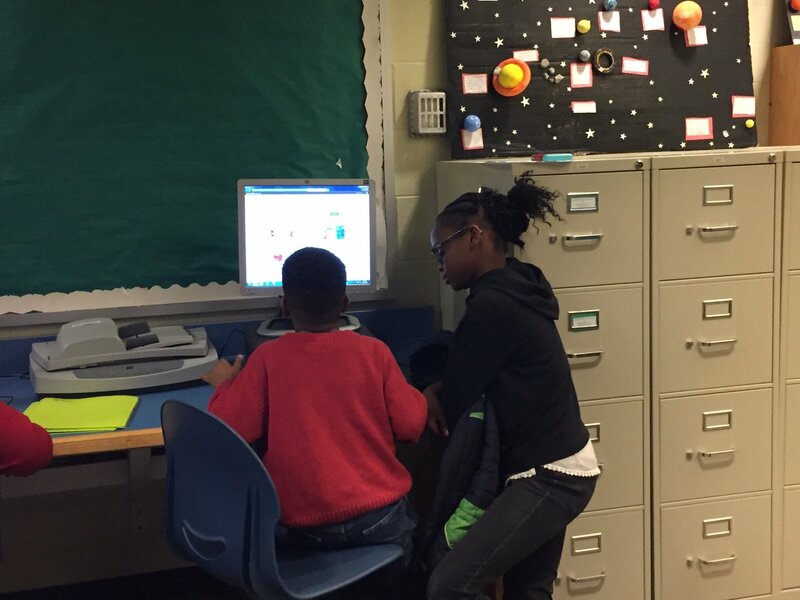 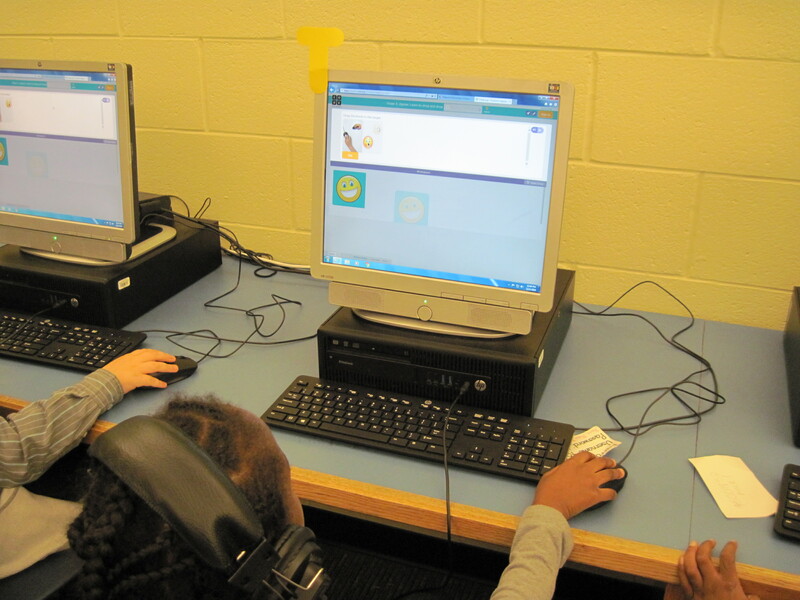 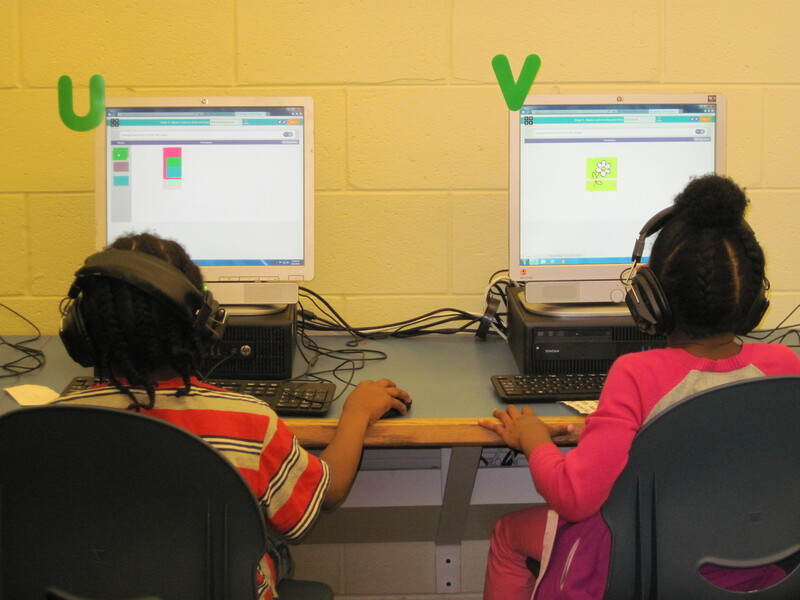 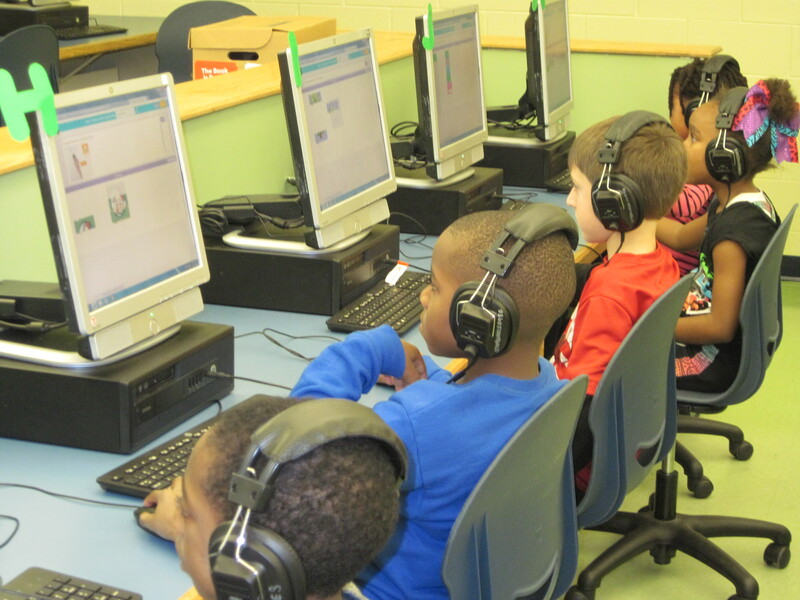 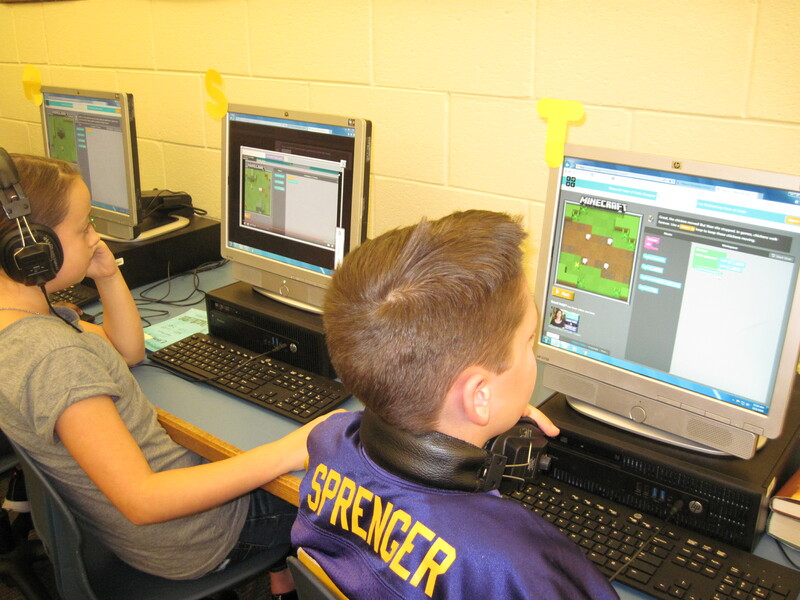 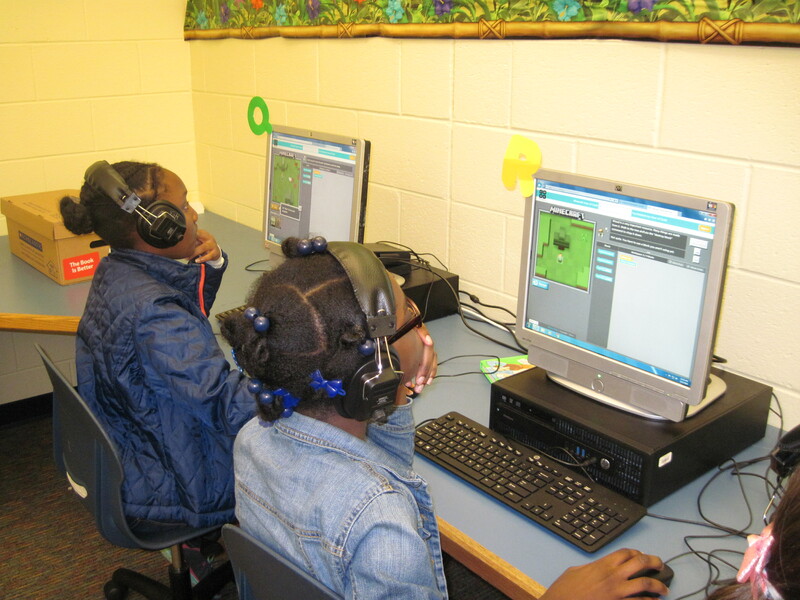 Kindergarten students help each other in the computer lab! 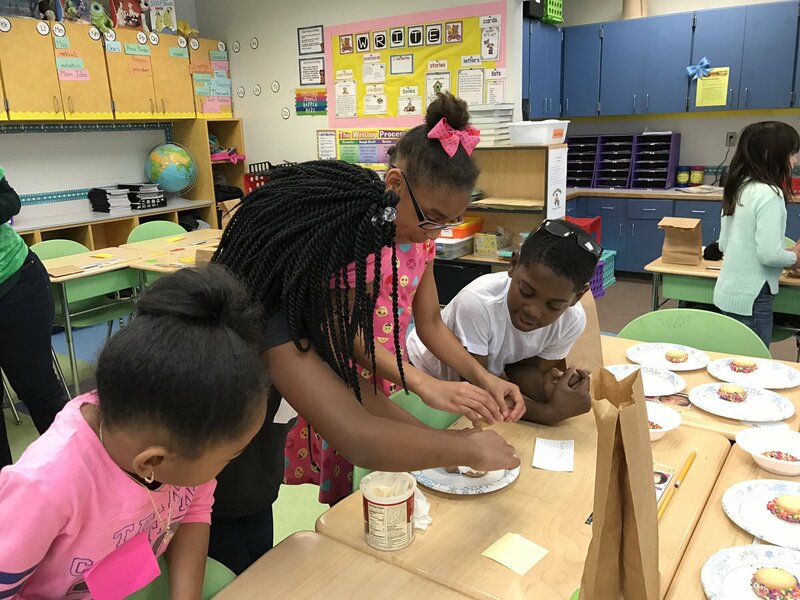 3rd graders learn about specialization by working on a cookie assembly line! 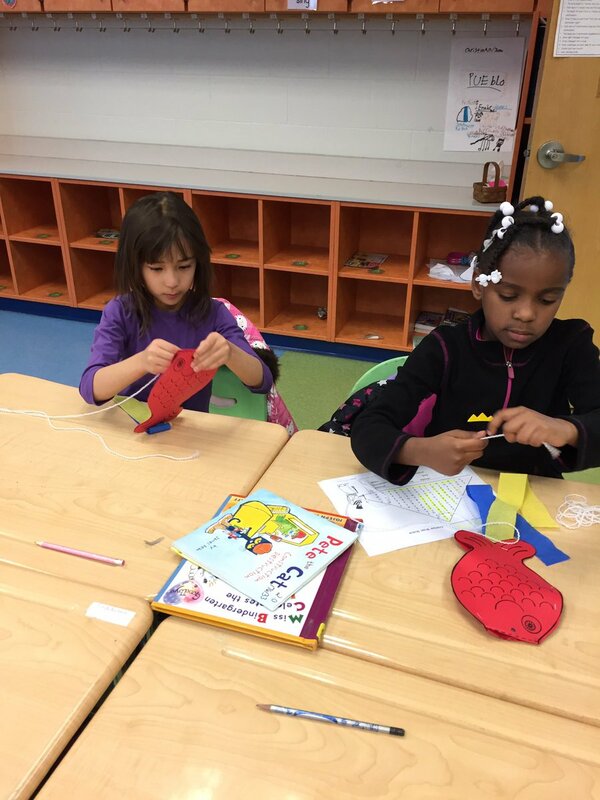 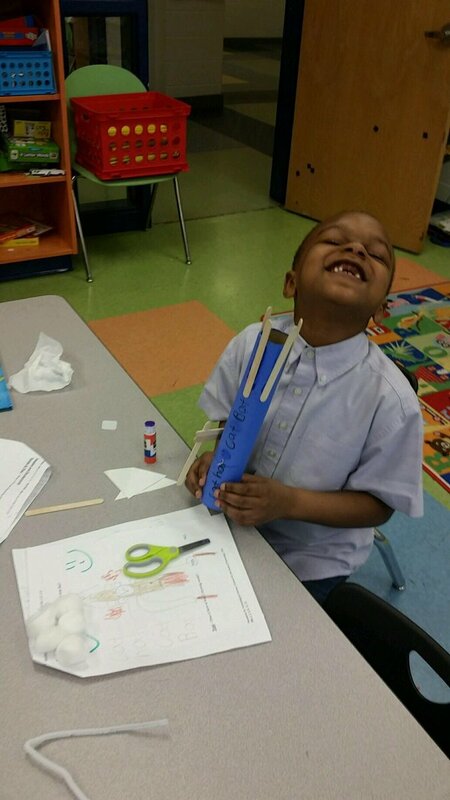 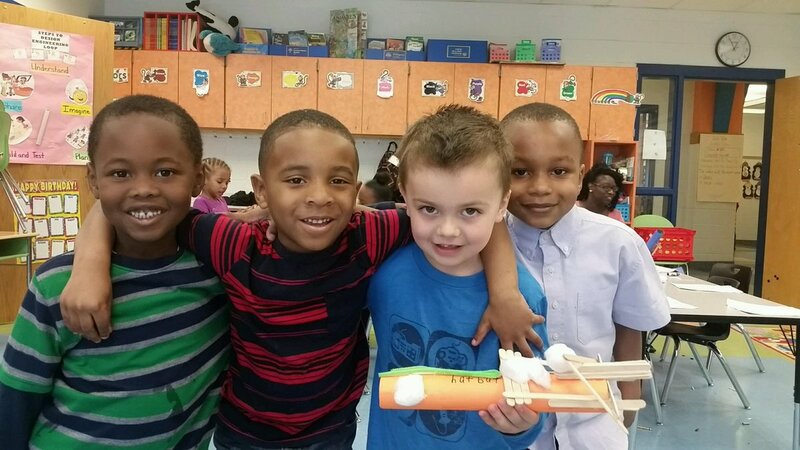 Kindergarten students designed and built their own rhyming rockets! 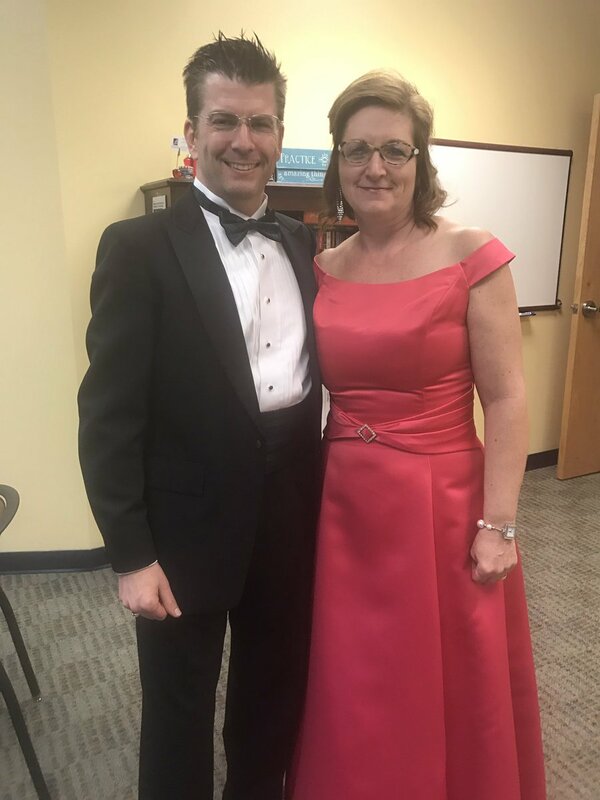 Friday, February 24th was Hillpoint’s 2nd Annual Sweetheart dance. 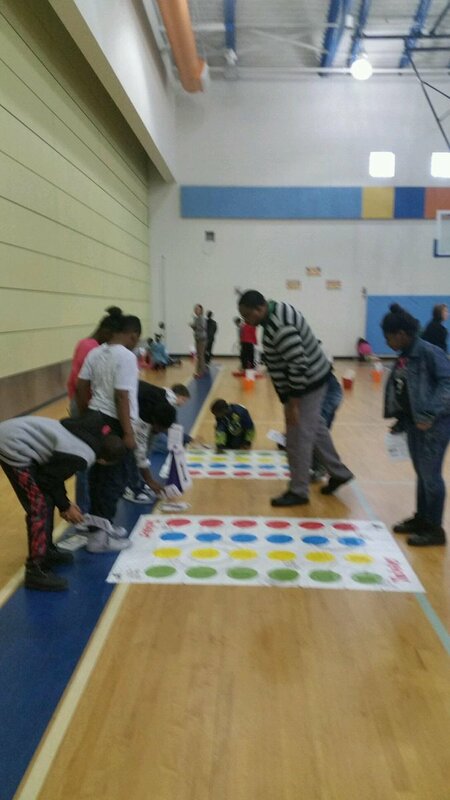 Sponsored by our PTA, students and their families came out for a night of food, dancing, family, and fun. 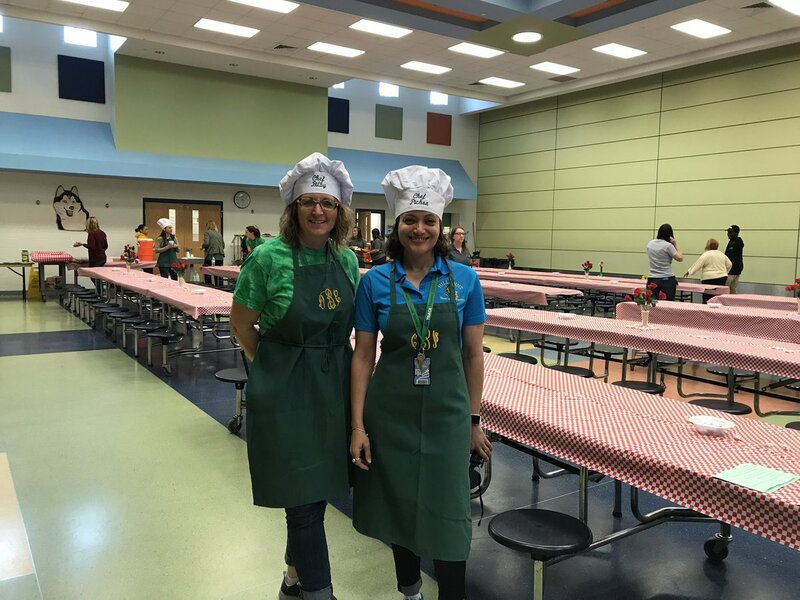 Thank you to our wonderful PTA for all of your hard work to make this possible! 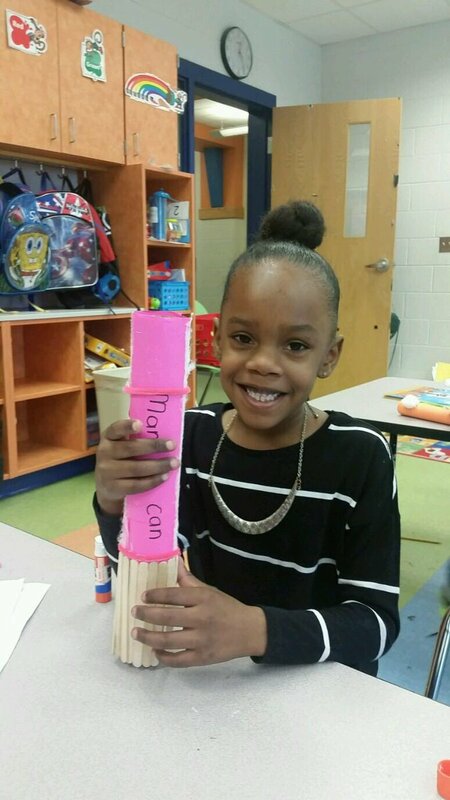 Please click the image below to see pictures! 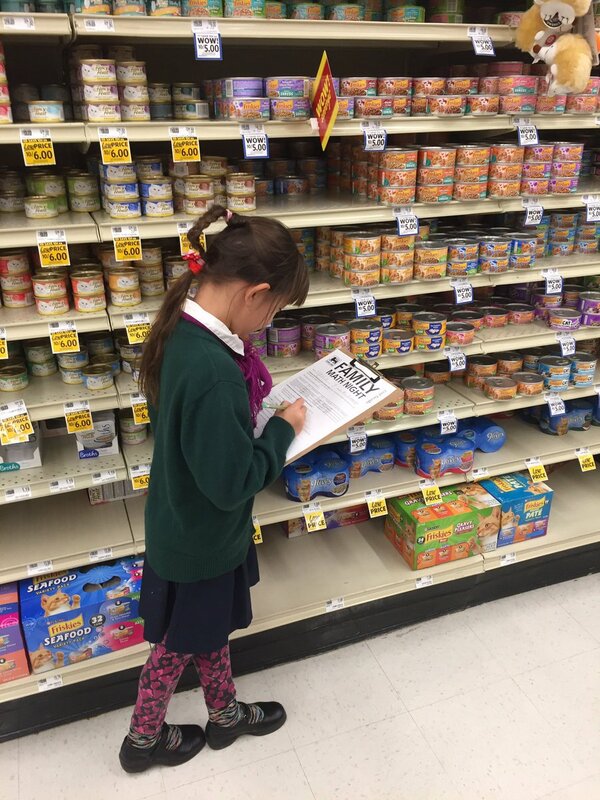 Is Goldilocks guilty of breaking and entering and destruction of property? 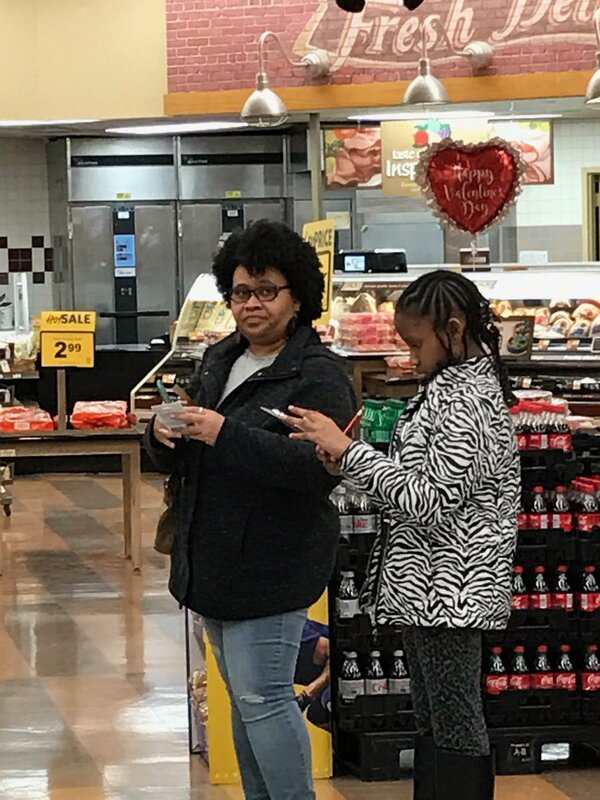 Or was she framed? 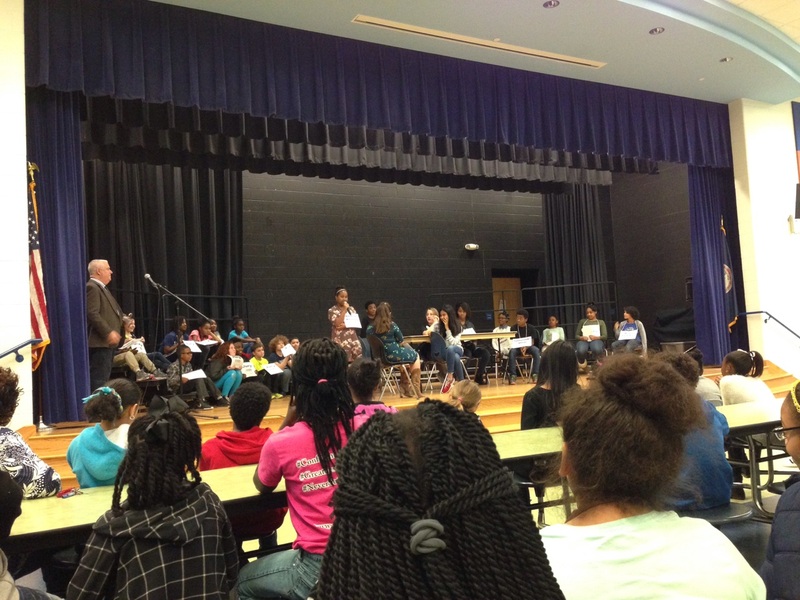 4th and 5th graders at Hillpoint Elementary grappled with this question as they took part in a mock trial that was based on the story Goldilocks and the Three Bears. 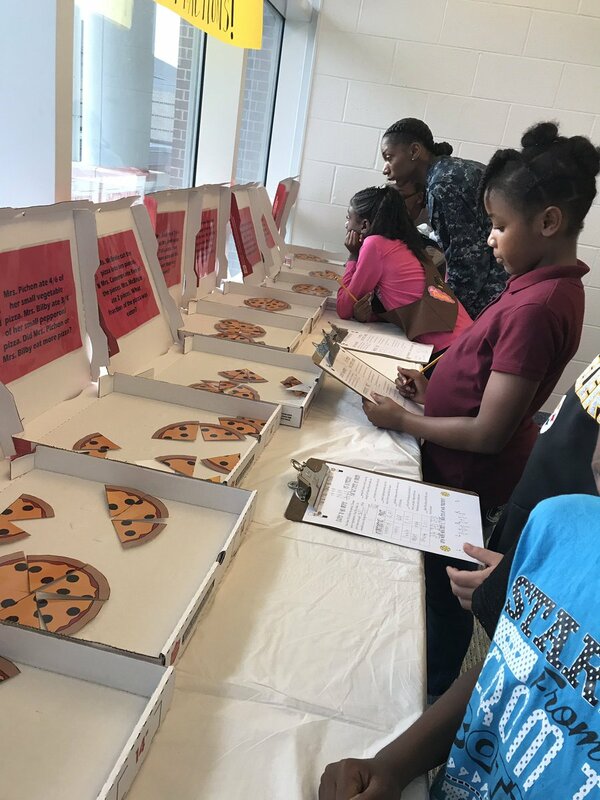 Senior Assistant Commonwealth’s Attorney F. Jefferson James and Community Outreach Coordinator Joan Turner led the students through the steps in a jury trial. 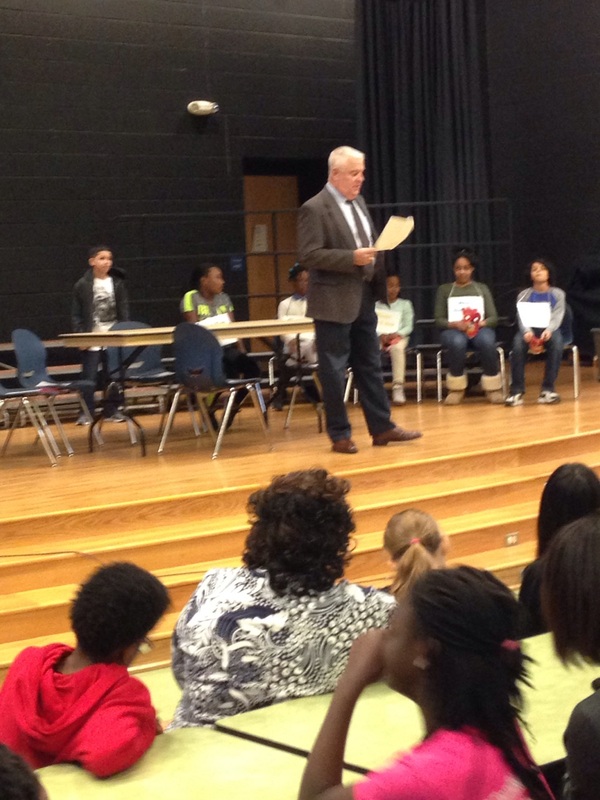 The students took on the roles of judge, jurors, attorneys, witnesses and others. 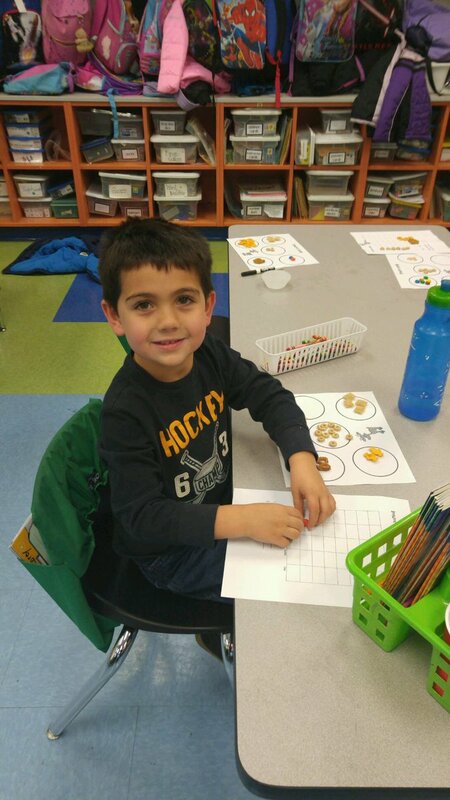 After deliberating carefully, the jury brought back a verdict of guilty on all counts. 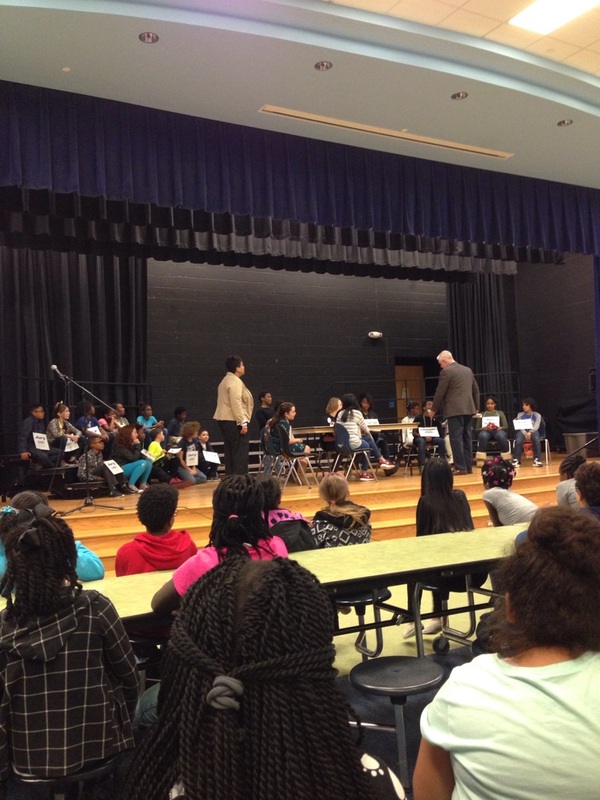 The trial ended with questions from the audience. 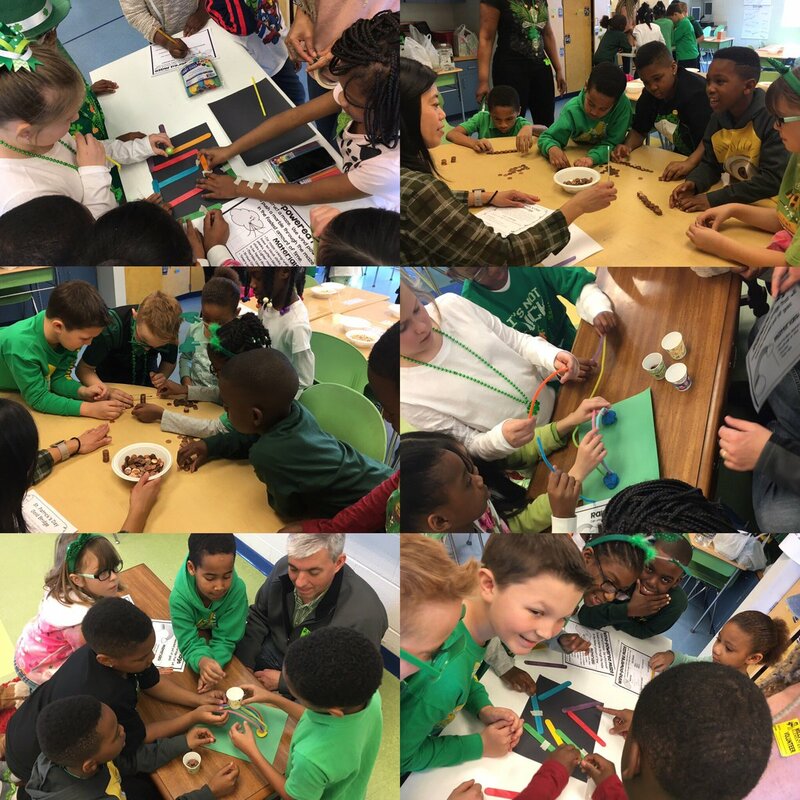 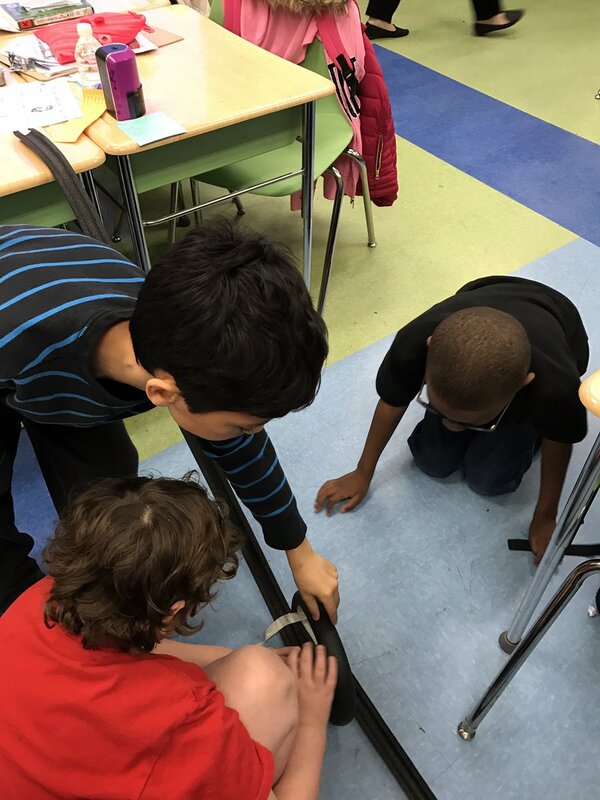 As a review of animal adaptations, fifth graders at Hillpoint participated in a simulation titled Survival Island. 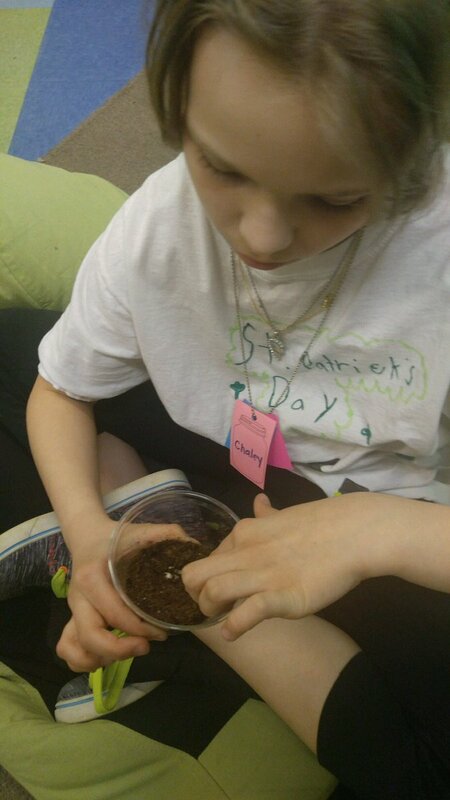 During the simulation, students tested the ability of three newly discovered species of animals (forkula, spoonik and stickette) to collect the only food source on the island–quinoa. 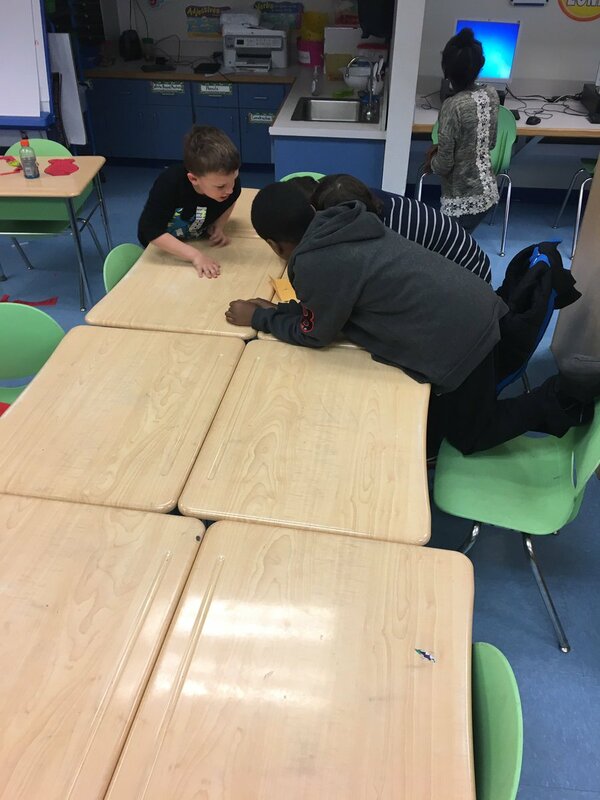 Students determined that the animal least able to gather quinoa would be the one least likely to survive on the island. 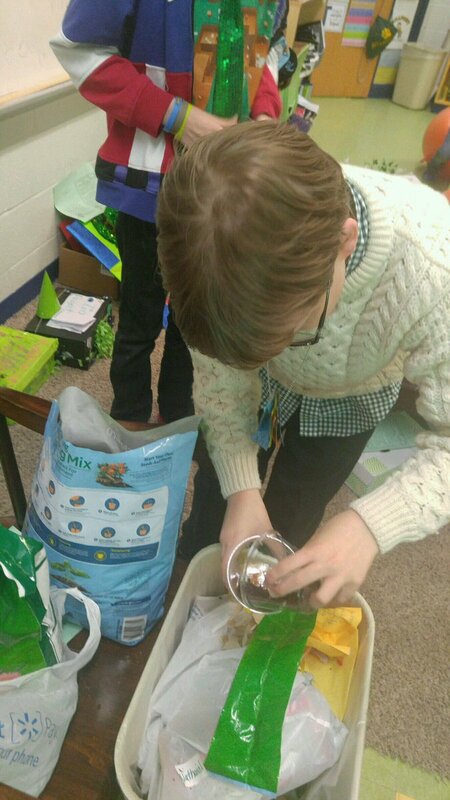 They invented an adaptation for the animal that would help it collect the food and increase its chances of living. 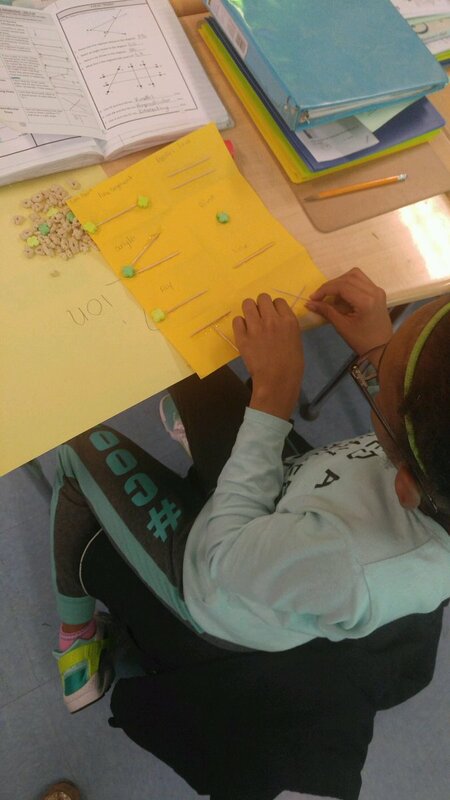 Students also recorded data in a table and created a graph of their results. 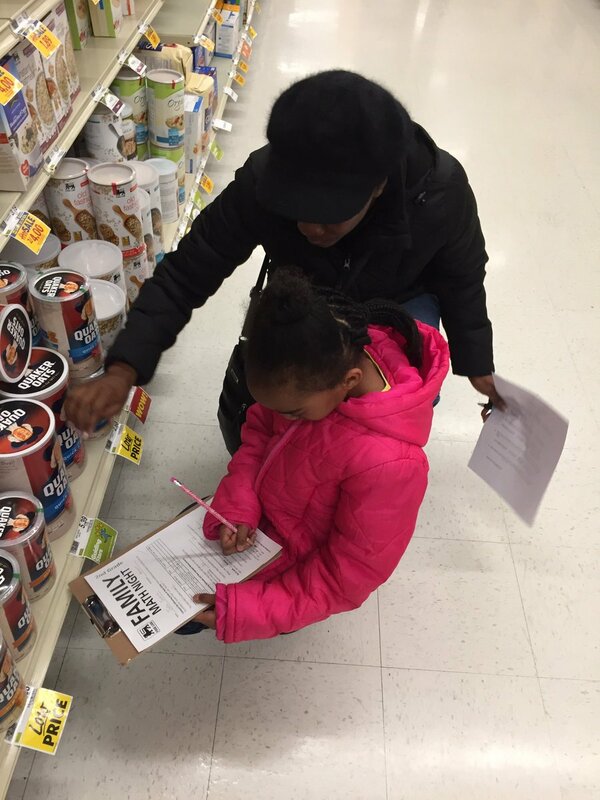 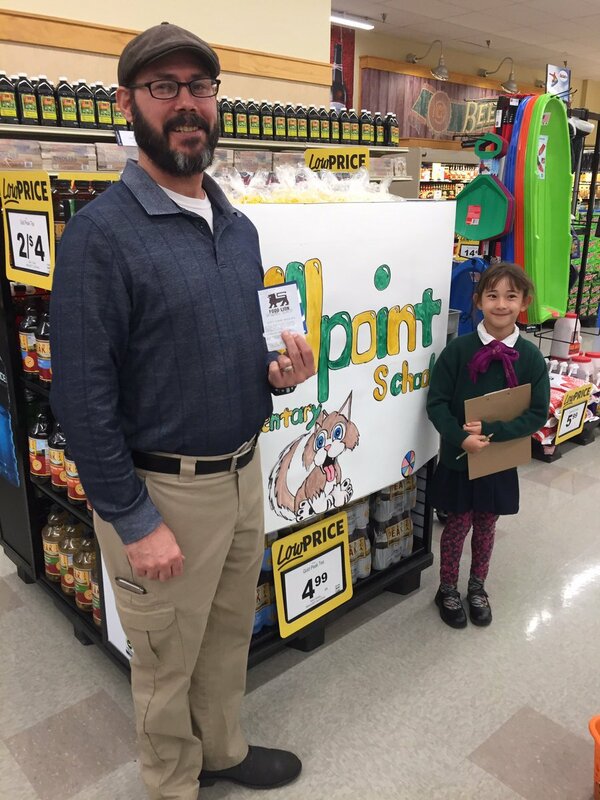 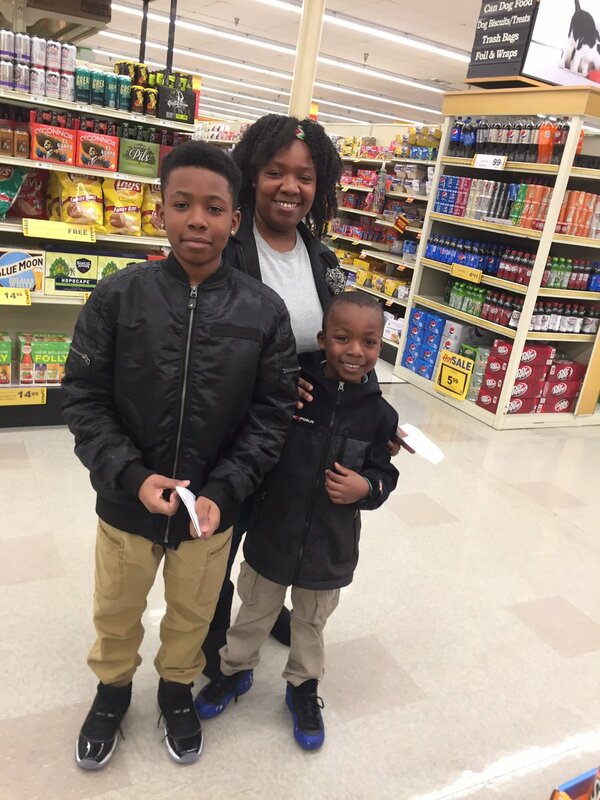 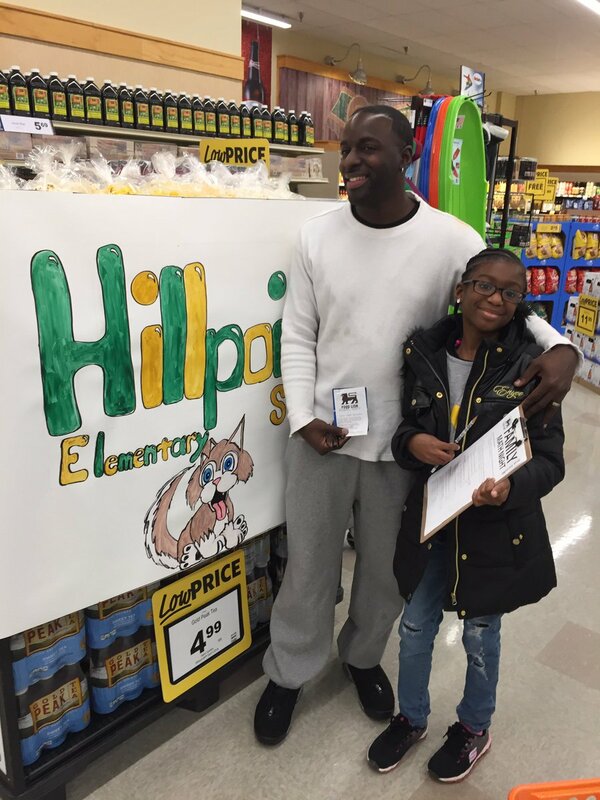 Hillpoint Elementary School partnered with the Food Lion on Godwin Blvd. 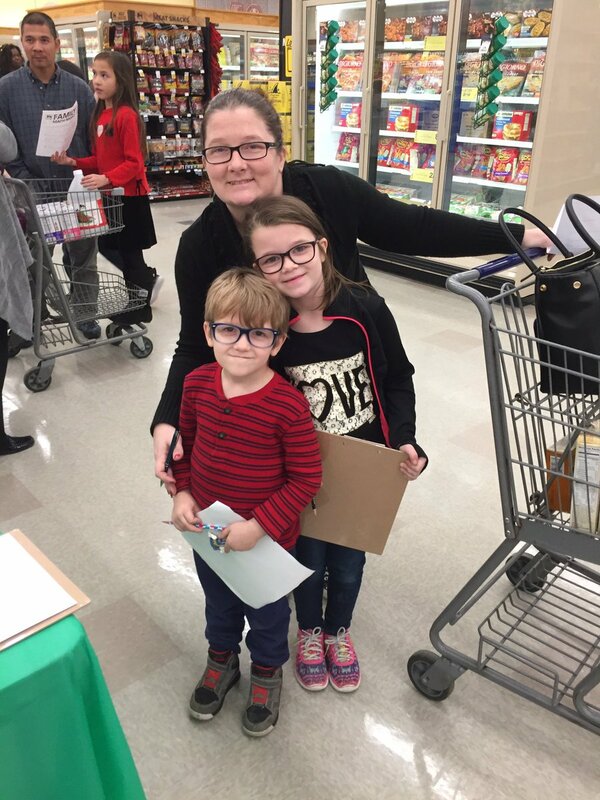 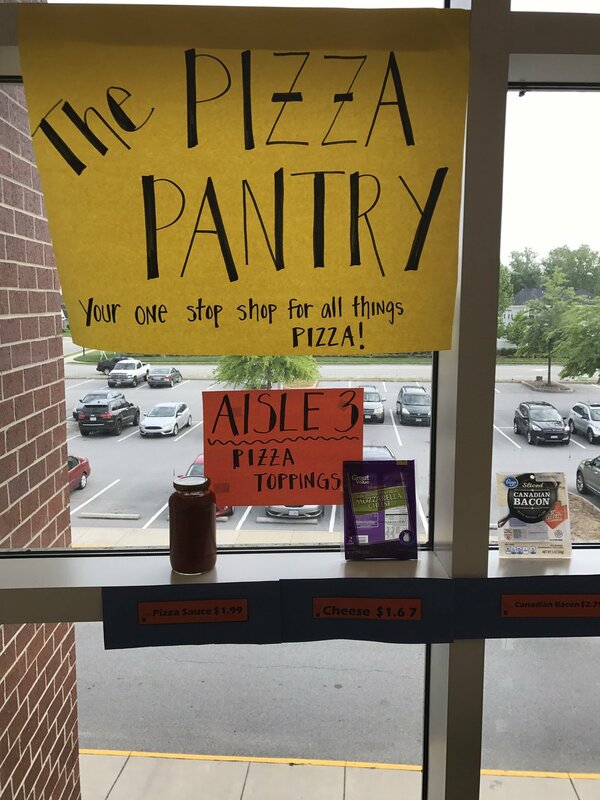 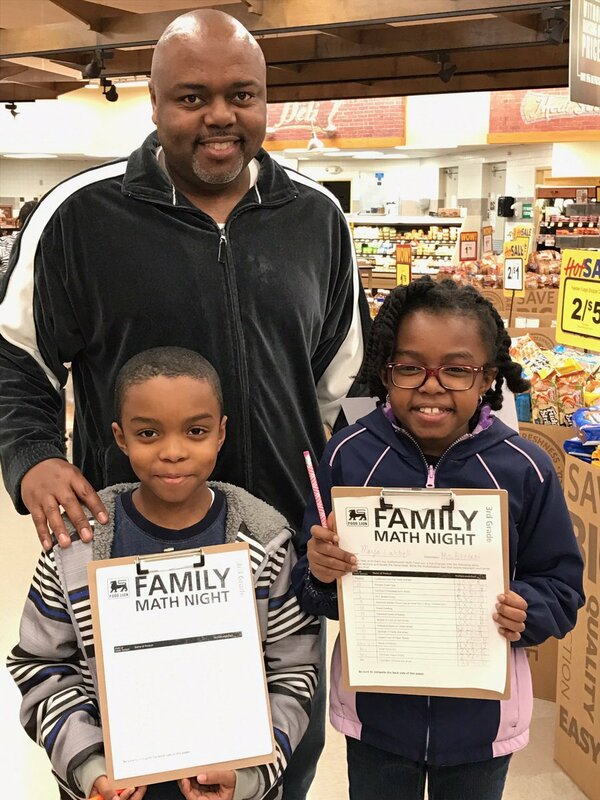 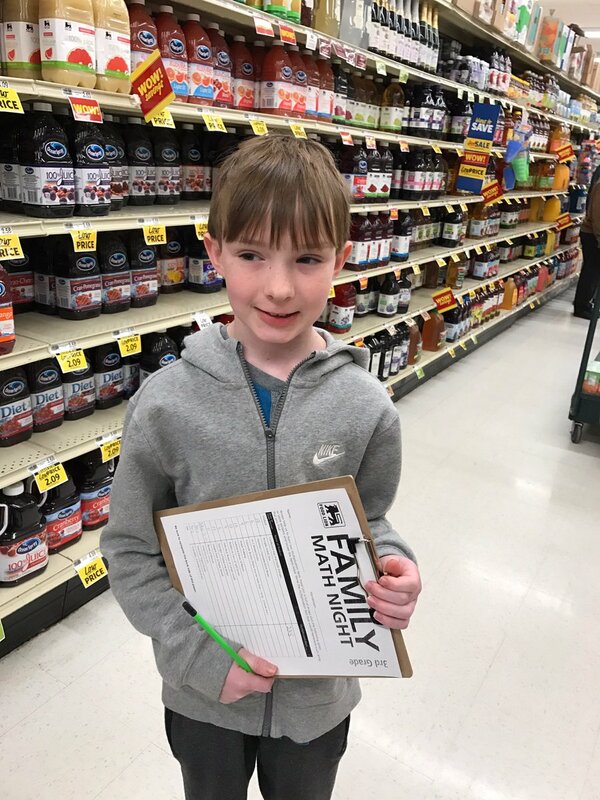 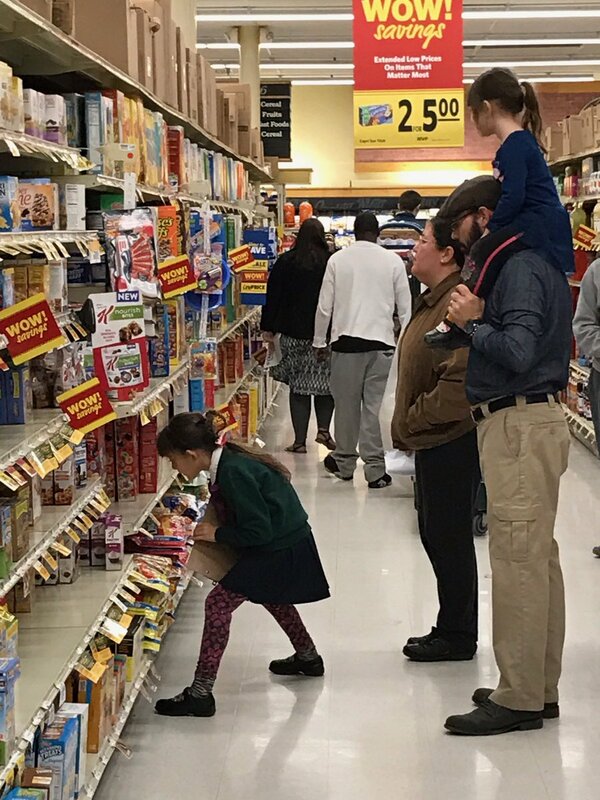 to have a Food Lion Math Night. 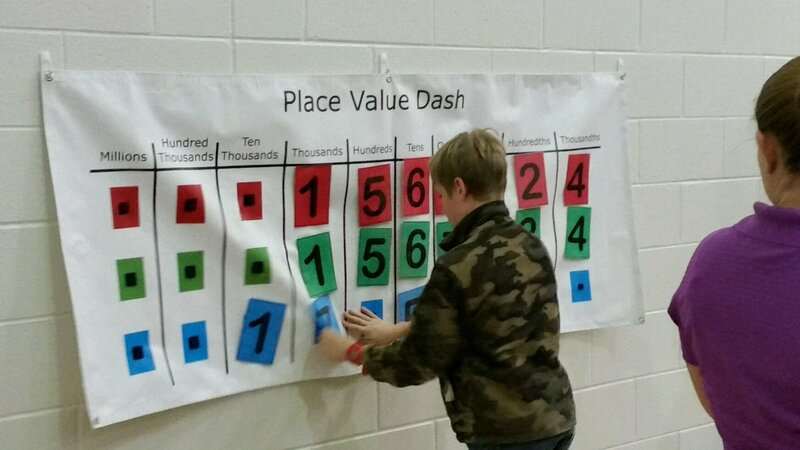 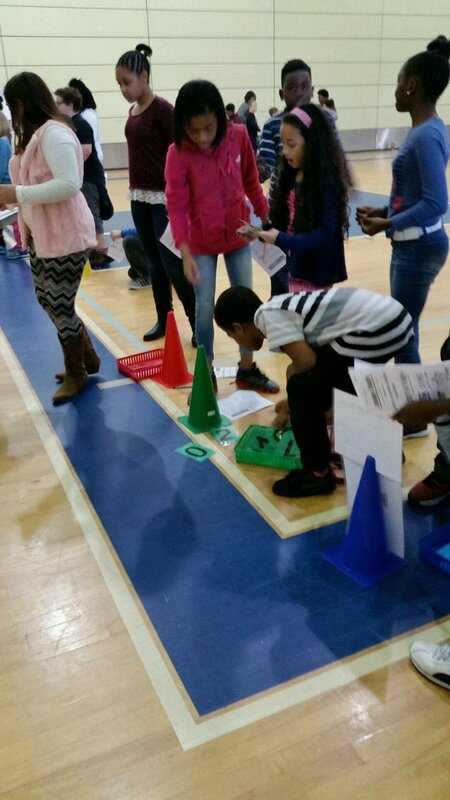 Students in all grades were invited to come and have some real world, hands on math learning and fun. 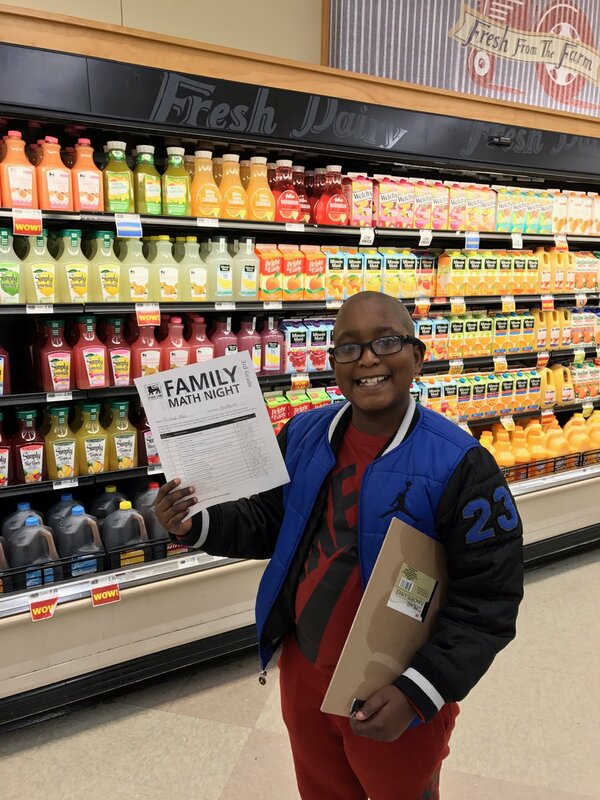 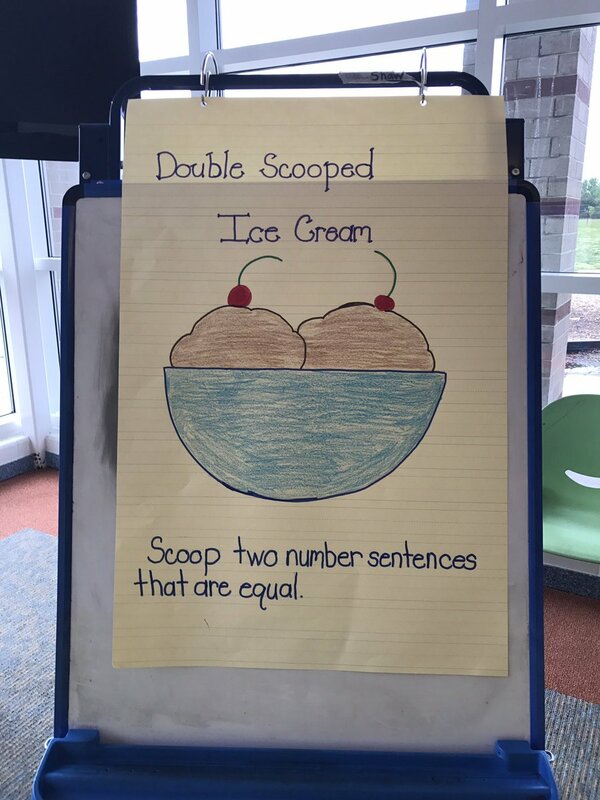 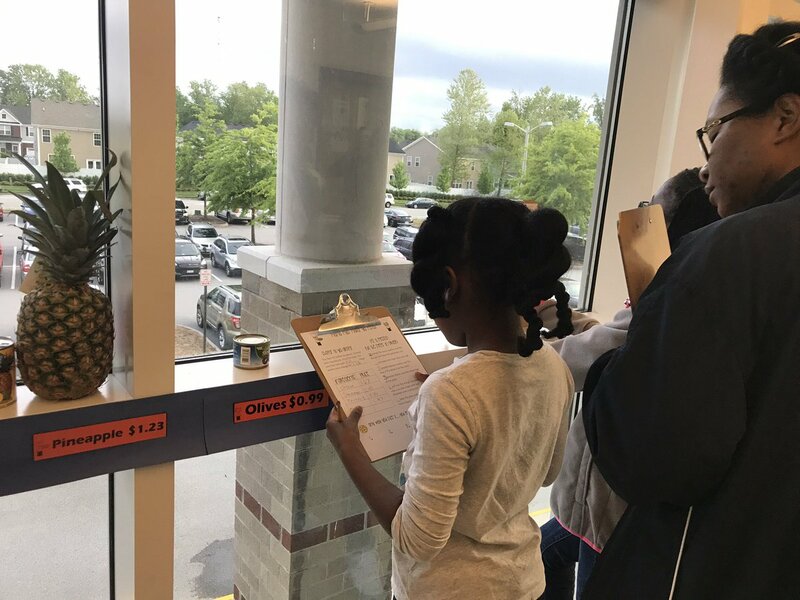 Students created weekly food lists with only $20, found multiplication arrays in the juice and fruit isles, and even made patterns with pudding! 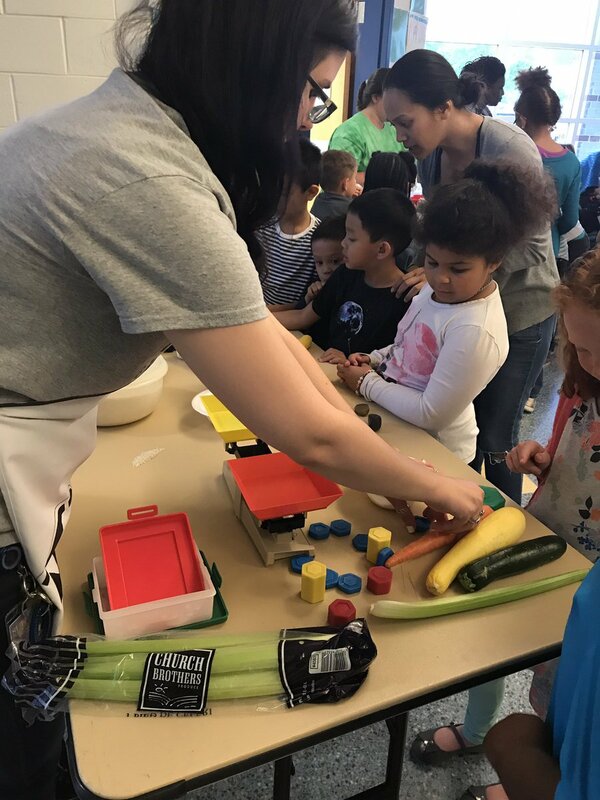 Thank you to our Food Lion partners for their help with this event, and thank you to Ms. Espinosa and Ms. Phelps for organizing this event! 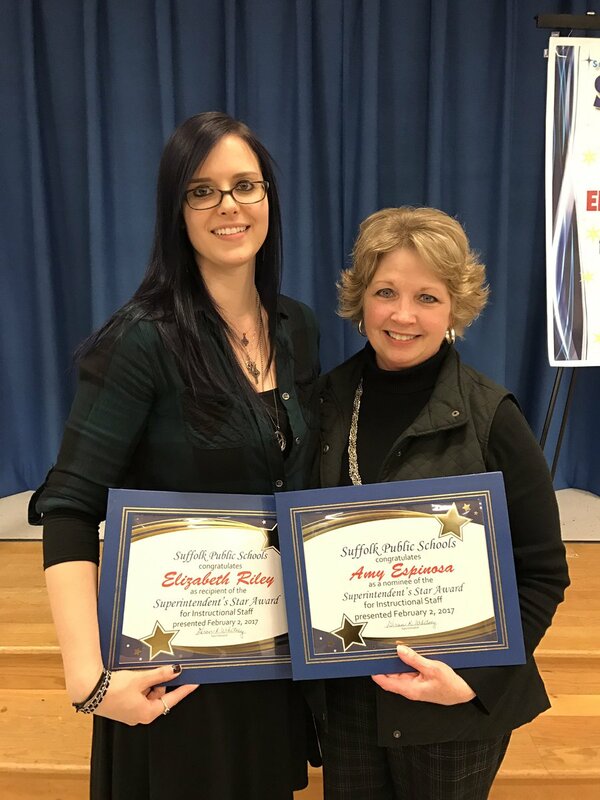 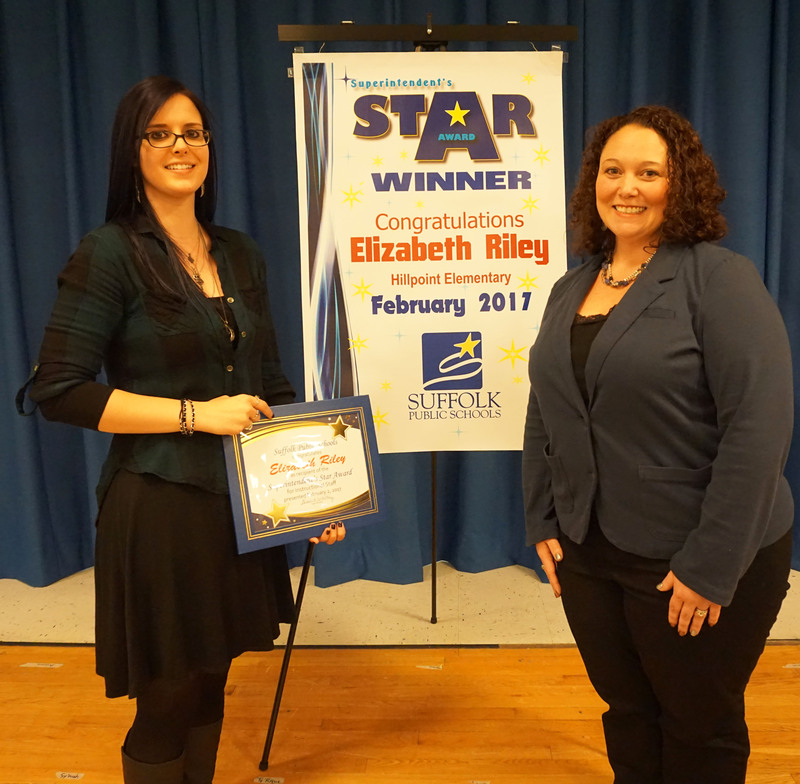 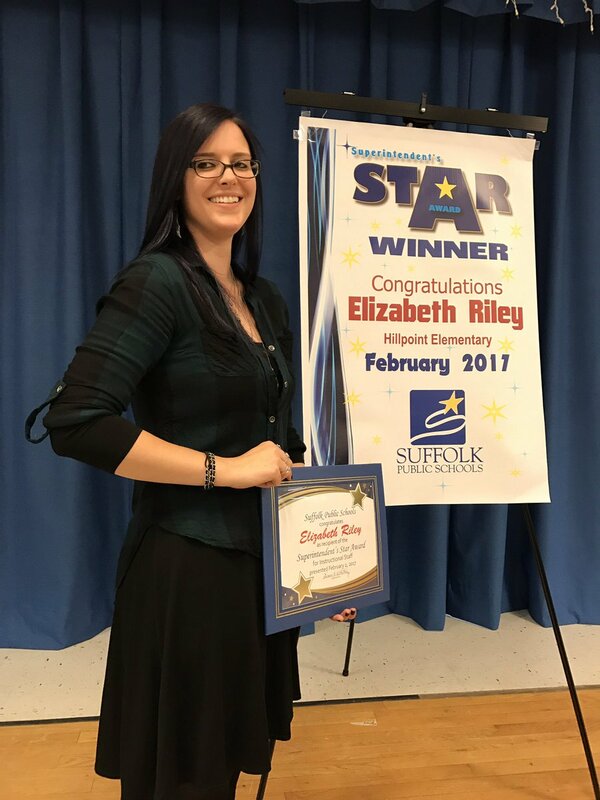 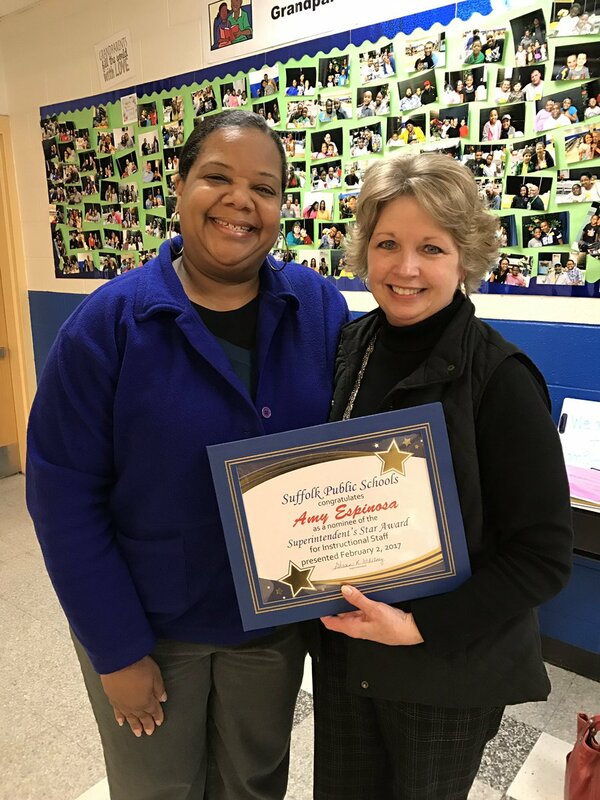 Congratulations to Ms. Riley and Ms. Espinosa, who were recipients of the superintendents STAR award. 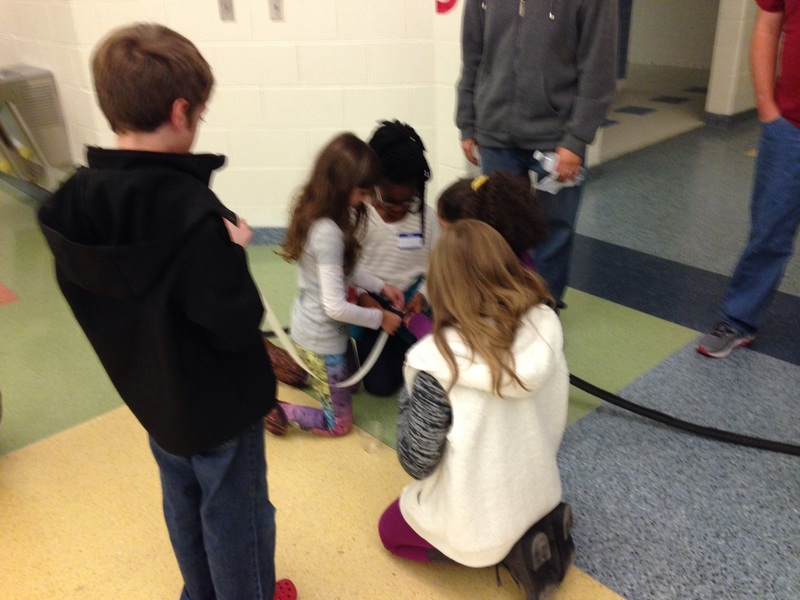 4th graders reviewed and learned STEM skills with an outreach program from the Air and Space Museum. 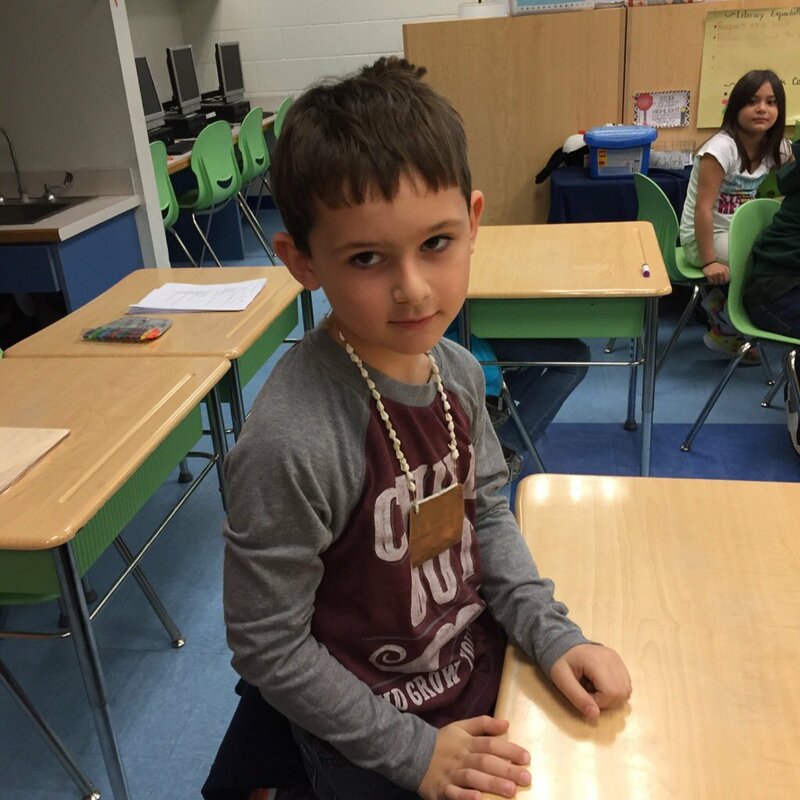 2nd grade completed a unit on Native Americans with an in-school field trip from Jamestown. 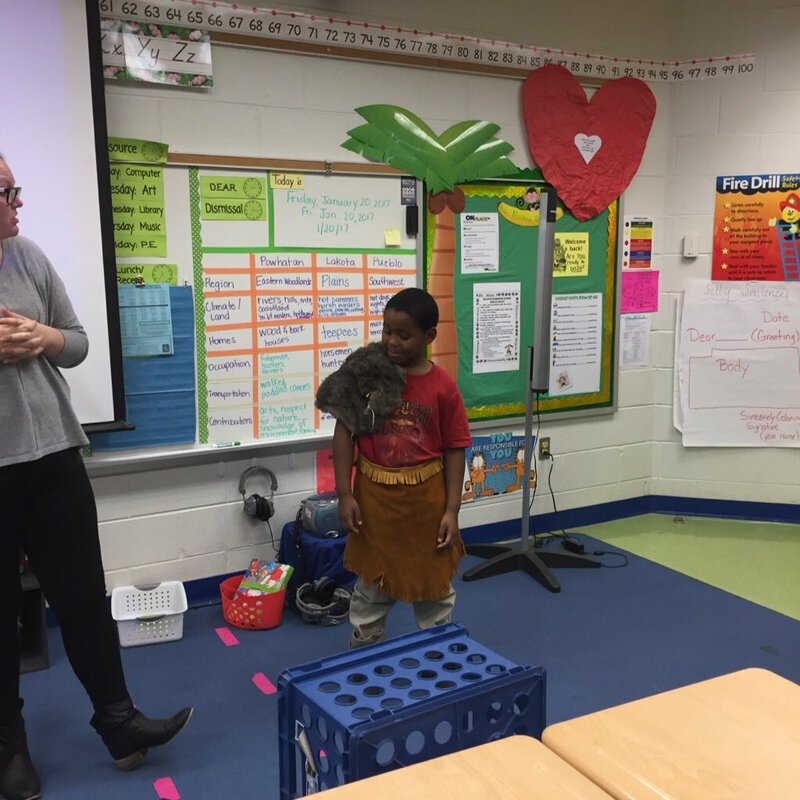 Students had the opporunity to touch artifacts, experience farming, fishing, and hunting as a Powhatan, and even touch real deer skin! 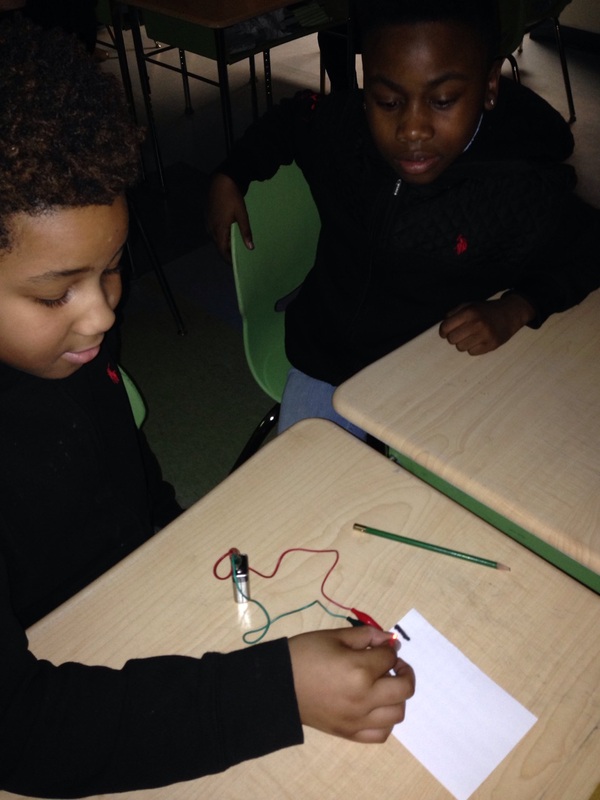 Fourth grade students at Hillpoint have been learning about circuitry. 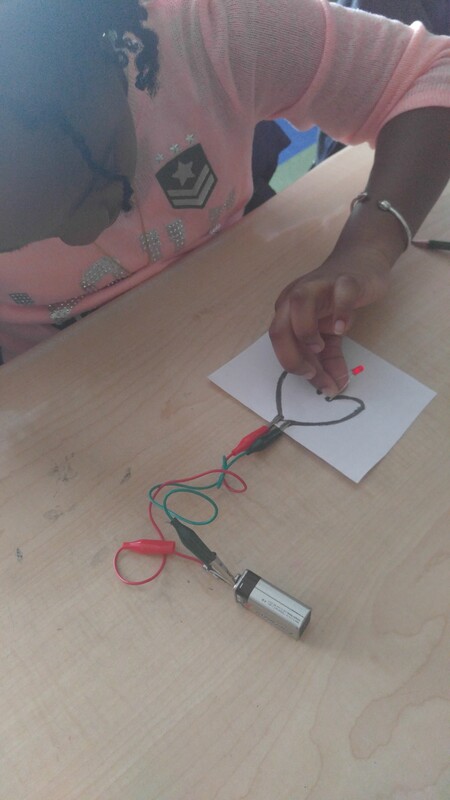 As part of their unit, the children created “surreal circuits”. 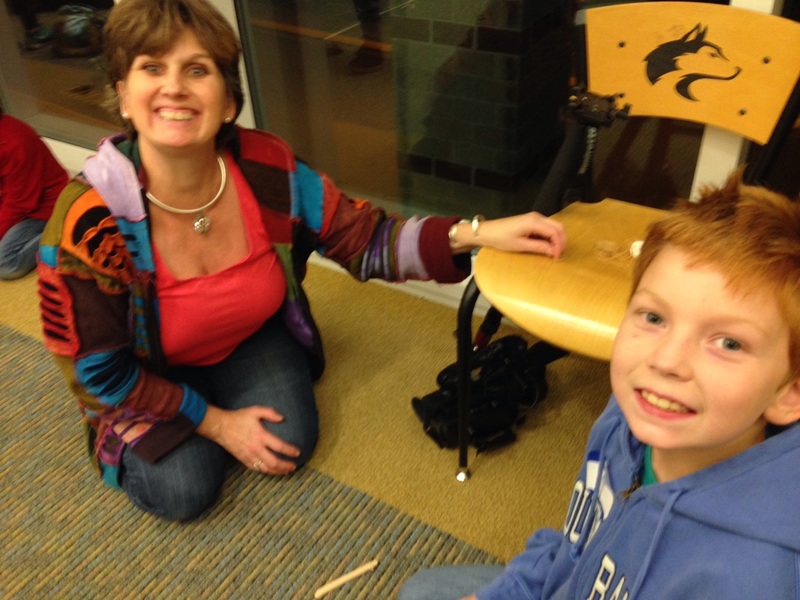 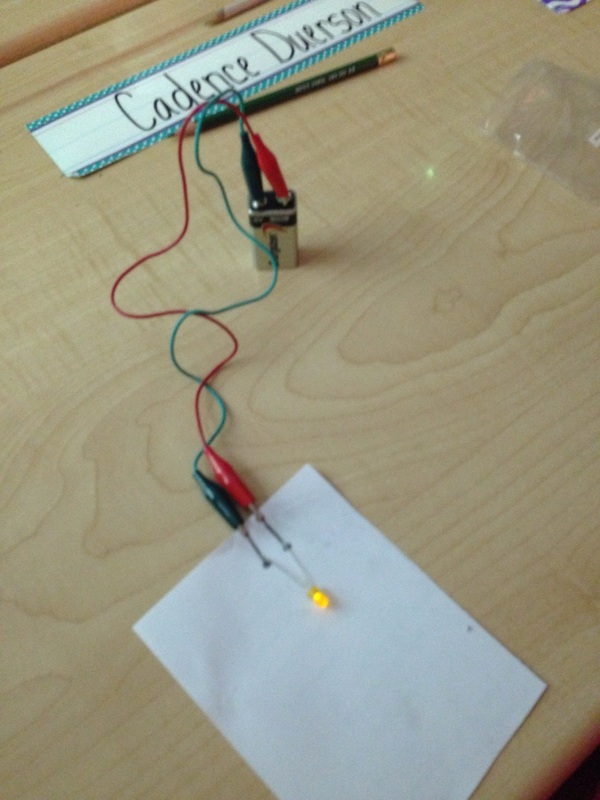 The circuits were constructed with a 9 volt battery, wires, LED bulbs—and paper and pencil! 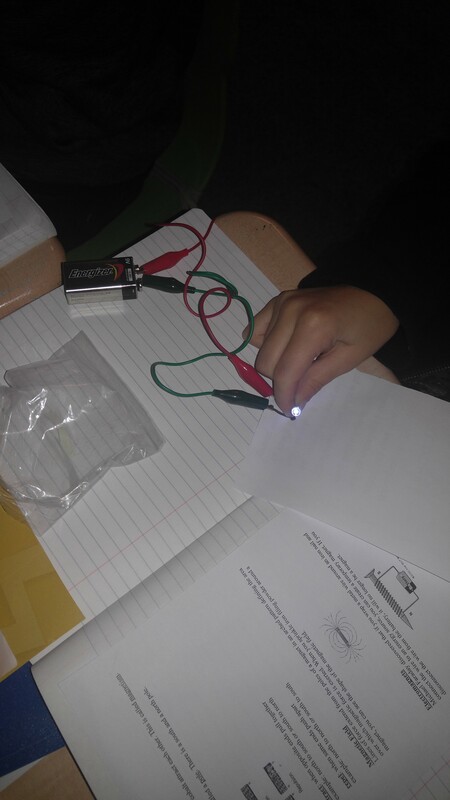 Students drew lines on paper and attached the clips from the battery to the paper. 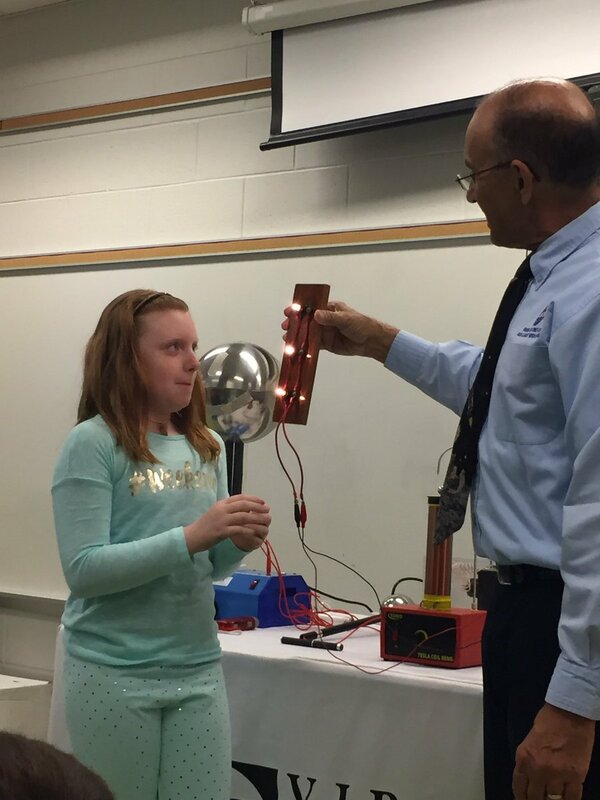 They were able to get a bulb to light up when they touched the bulb wires to the lines. 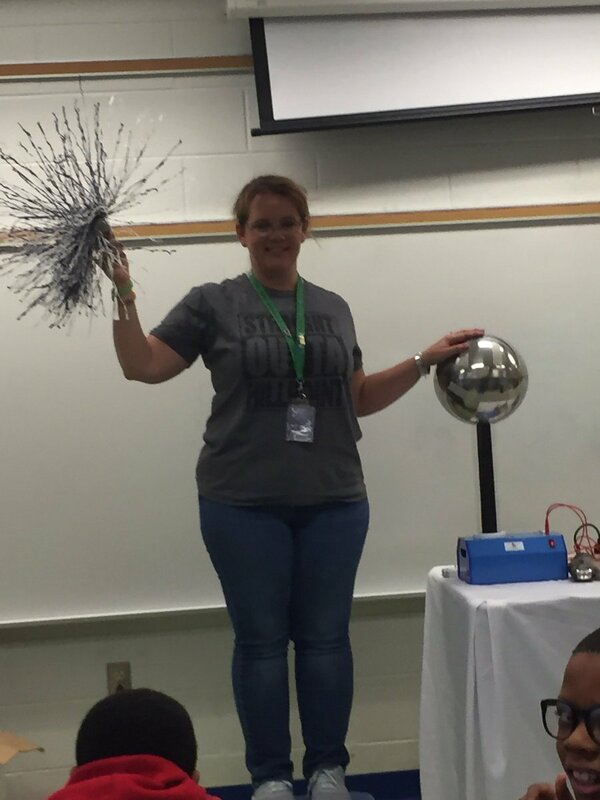 Who knew that graphite is a conductor?! 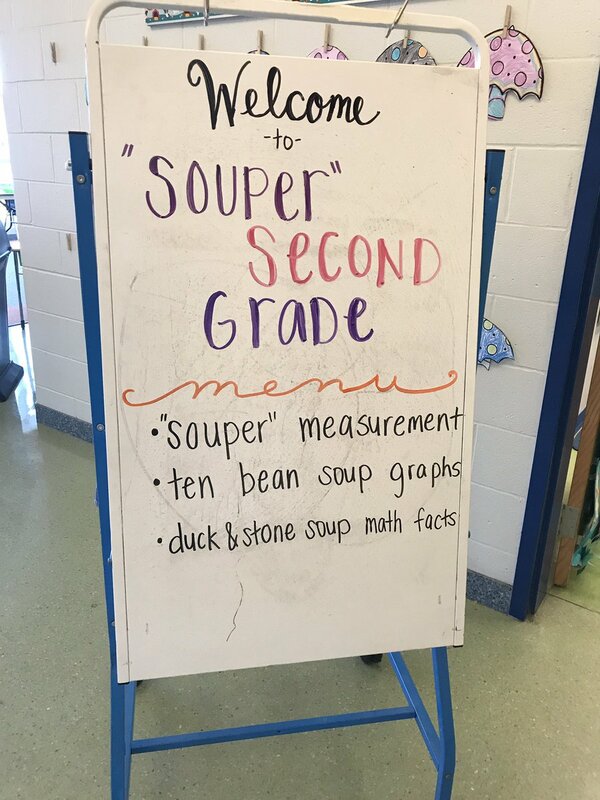 You learn something new everyday at Hillpoint! 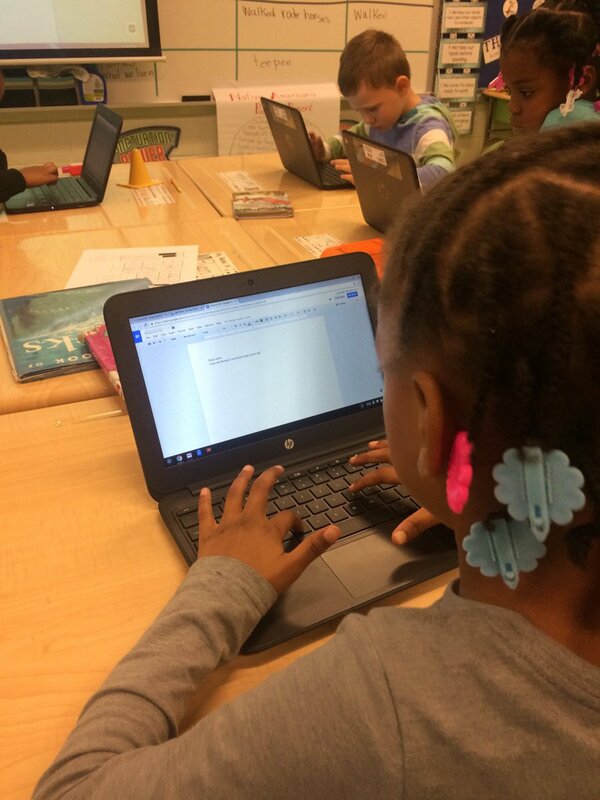 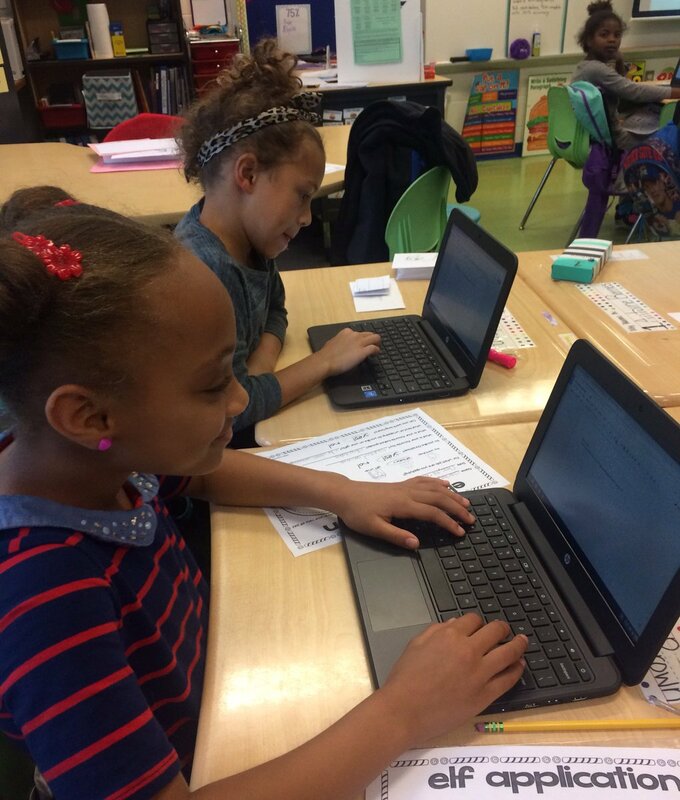 Second graders learned how to use Google to enhance their writing. 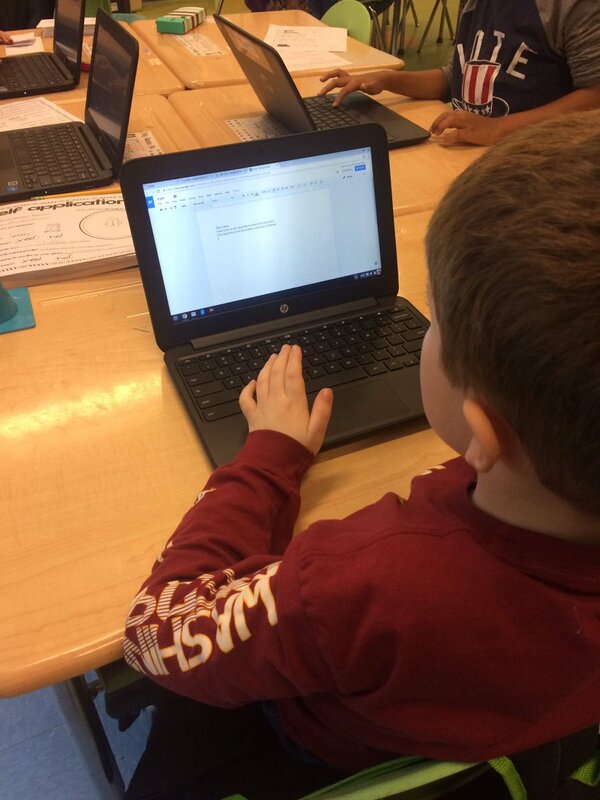 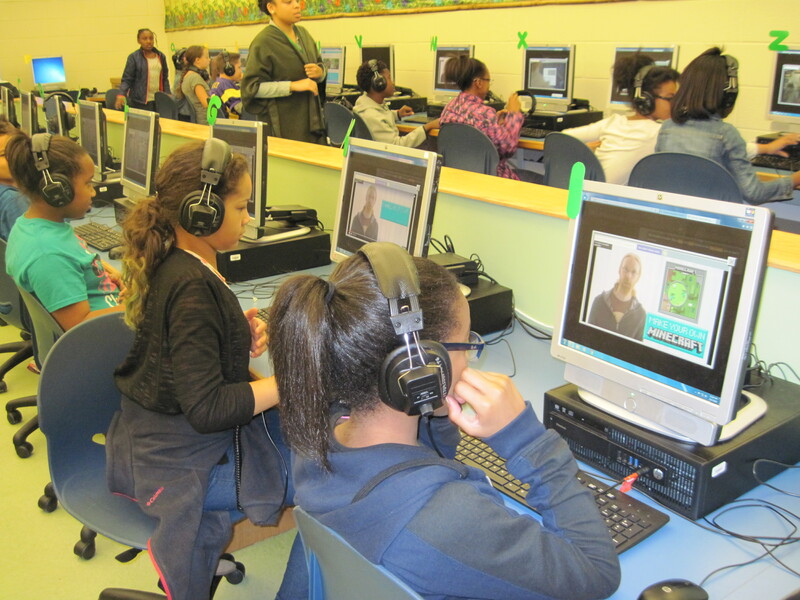 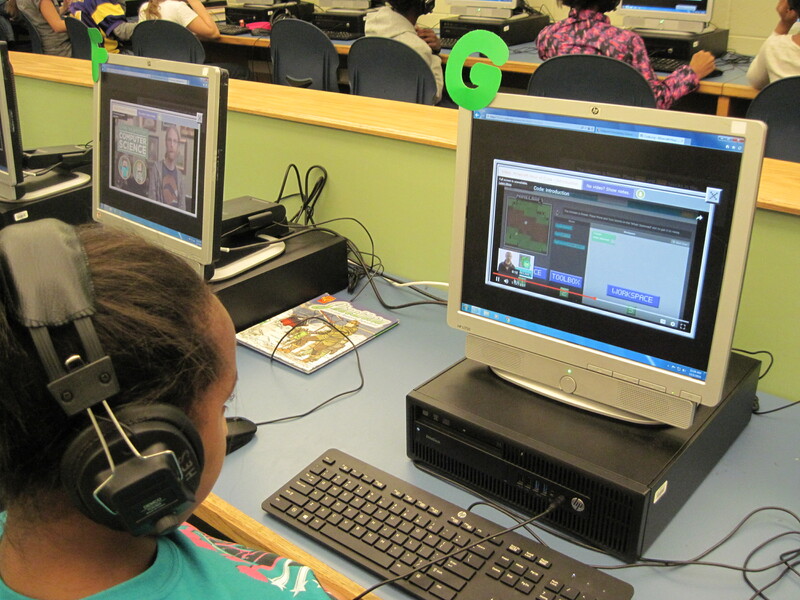 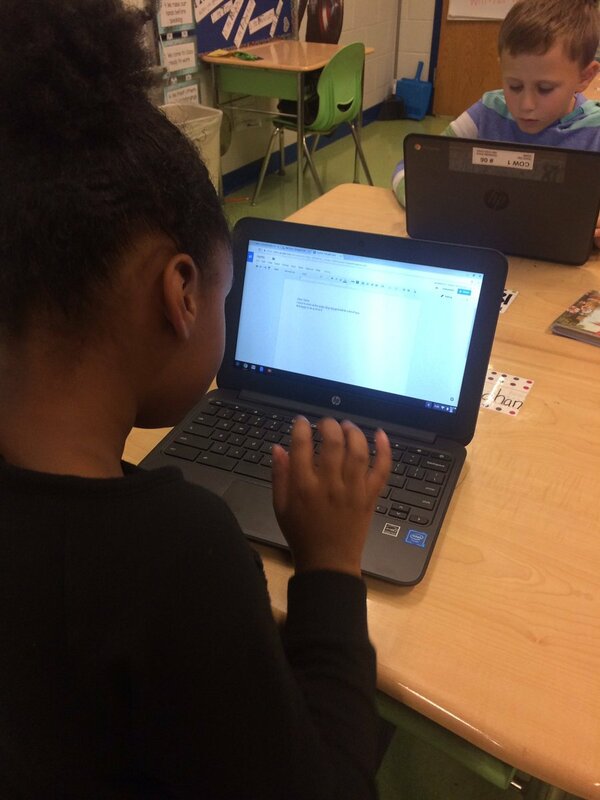 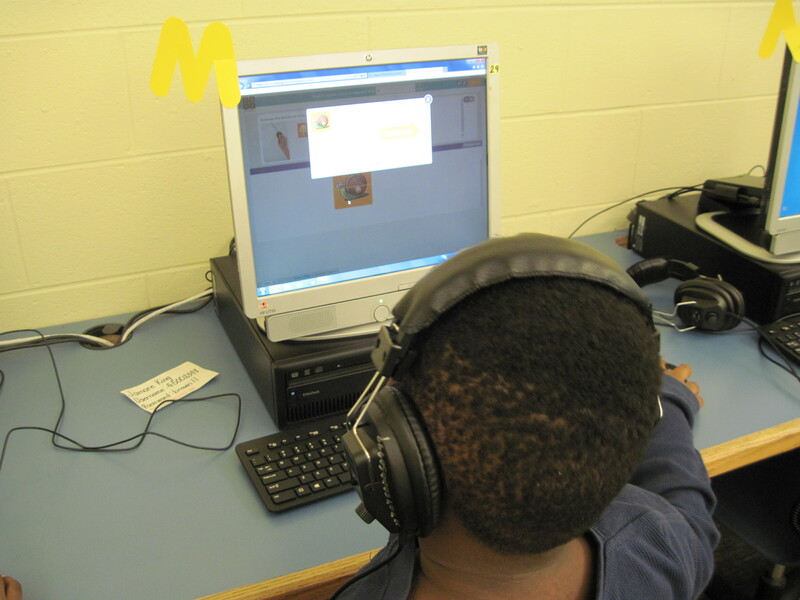 Students learned how to create a Google document, type a story, and even add pictures! 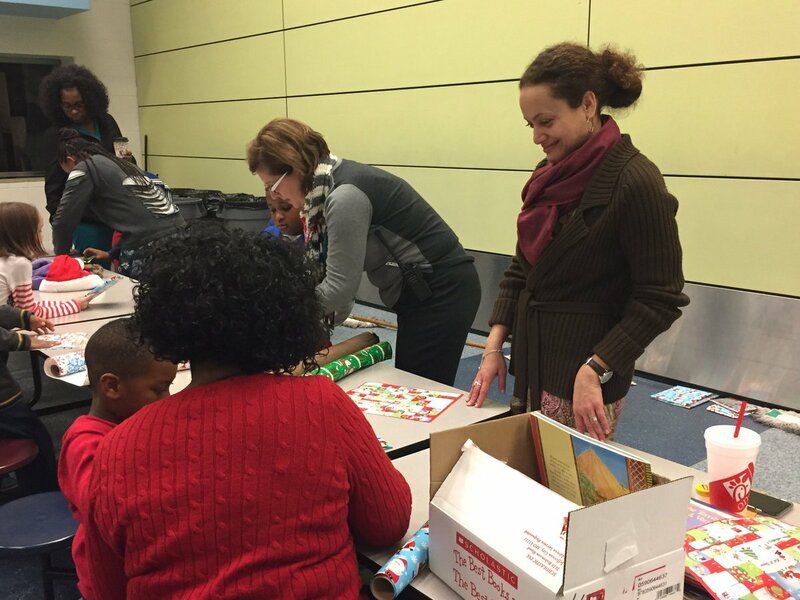 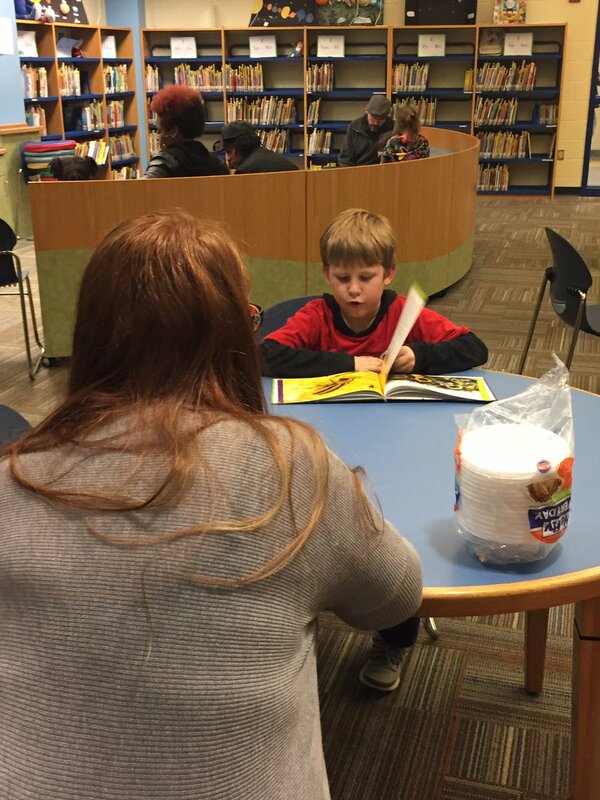 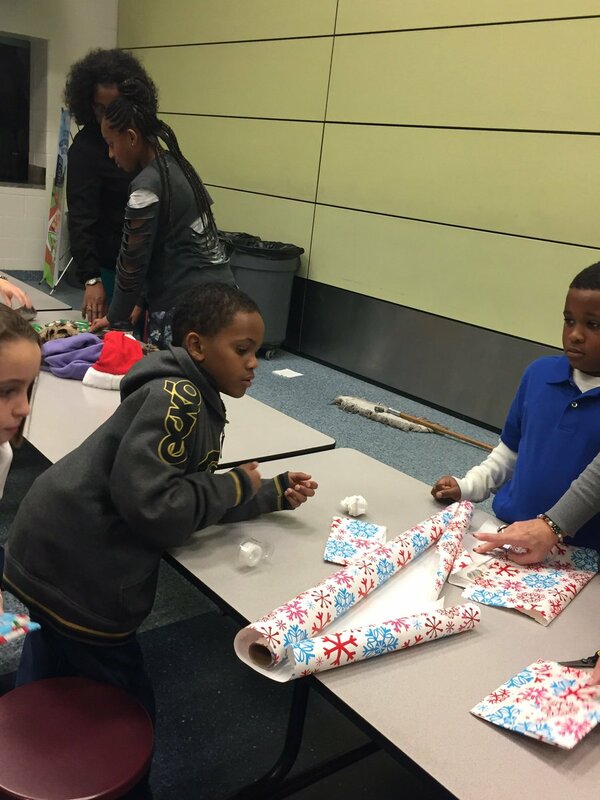 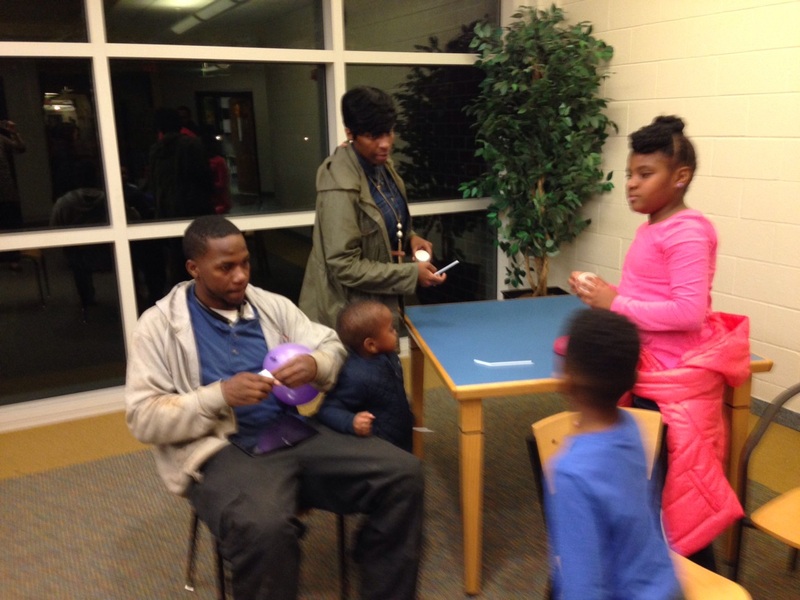 Hillpoint Elementary held its first Family Reading Night of the school year on Tuesday, December 13, 2016. 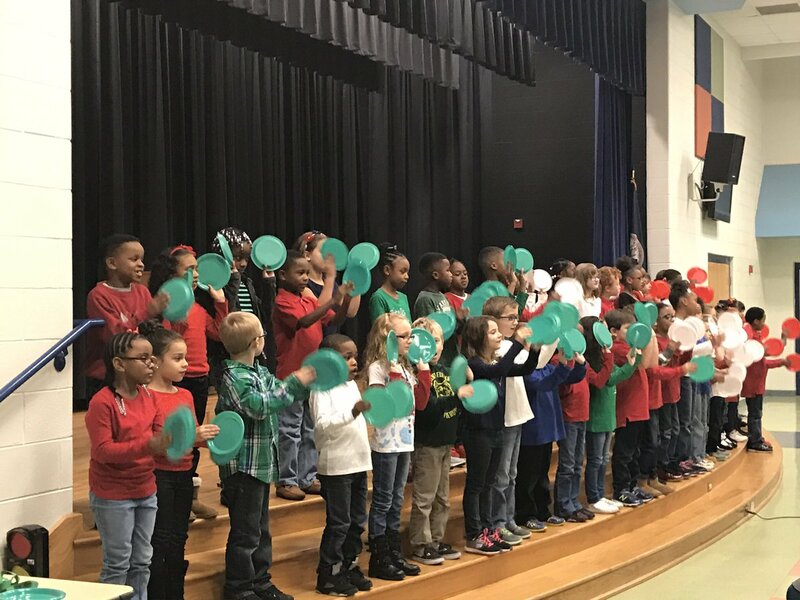 Families enjoyed a Christmas performance by first grade students, hot cocoa and cookies provided by PTA, reading and quizzing on Accelerated Reader books, wrapping a book for donation to Toys for Tots, and selecting a book to take home for their personal library. 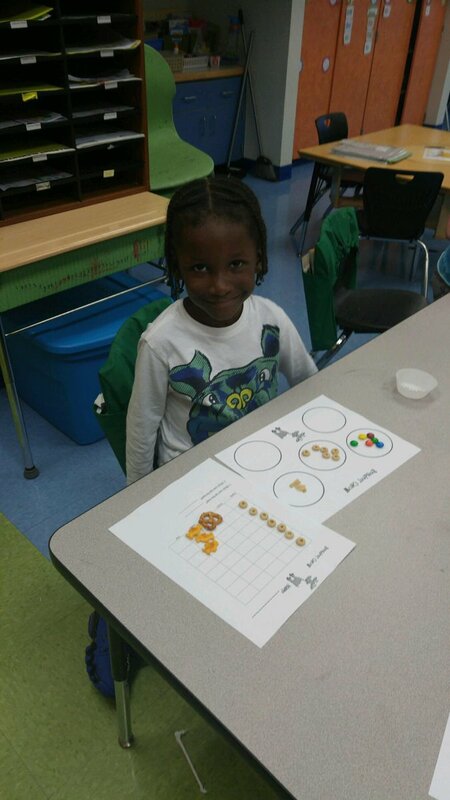 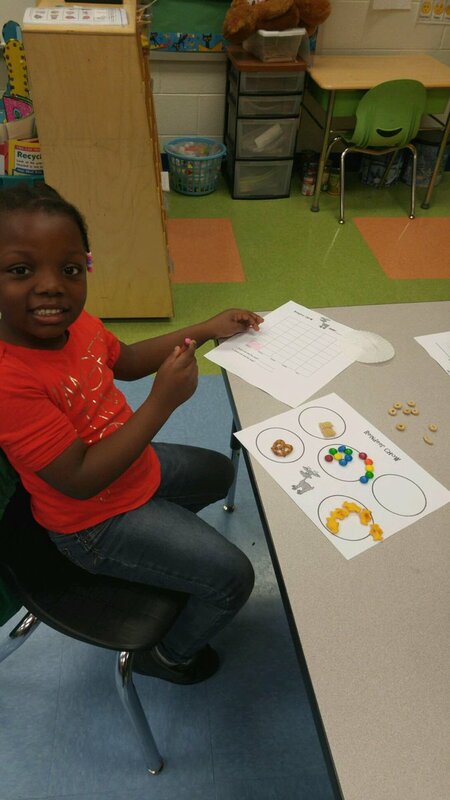 Students in kindergarten learned about sorting and graphing by playing with reindeer chow! 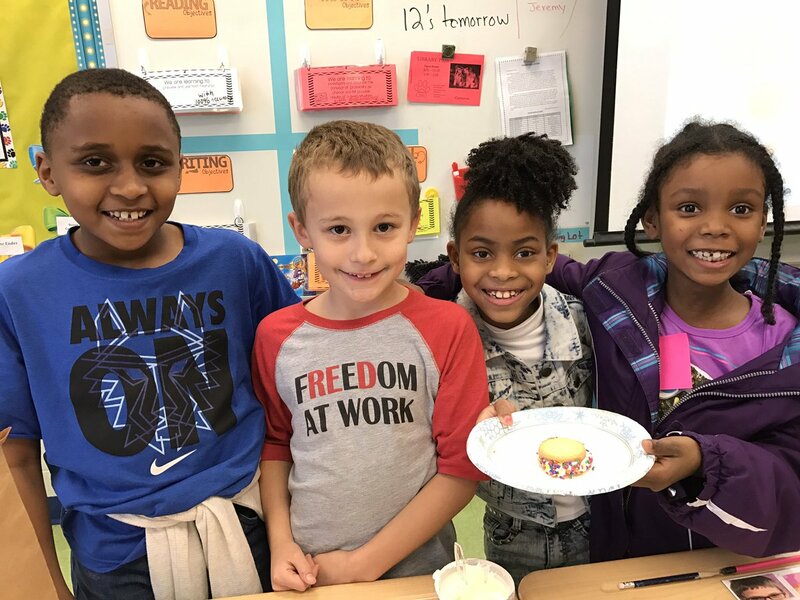 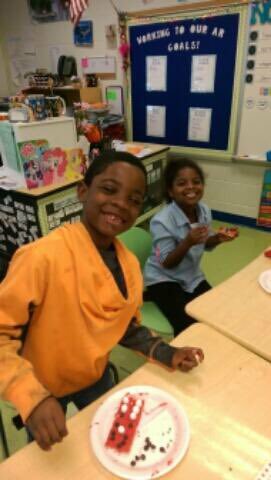 2nd graders learned about fractions by creaking cookie pizzas with specific fraction recipes. 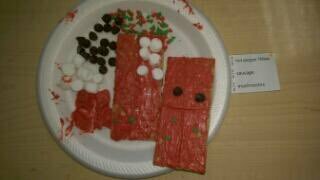 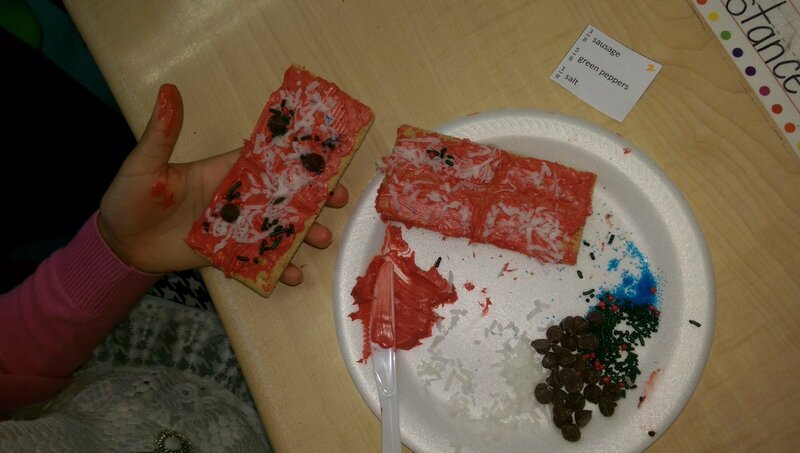 They were delicious and full of learning fun! 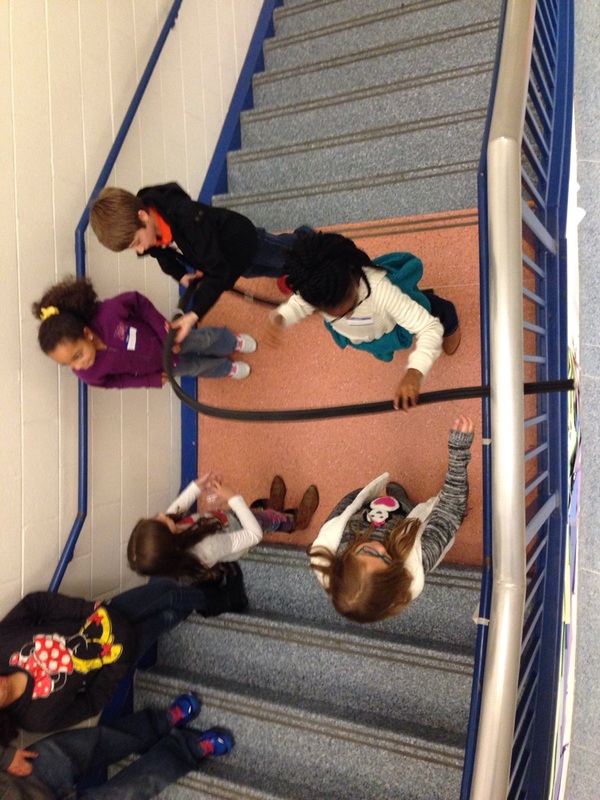 4th graders learned about force, motion, and energy to build working roller coasters! 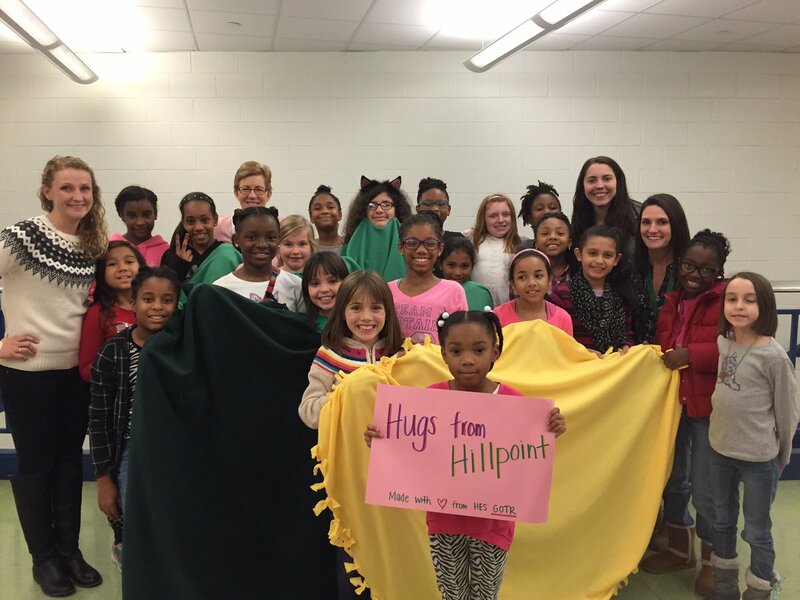 Our Girls on the Run club worked together to make blankets to donate to cancer patients. 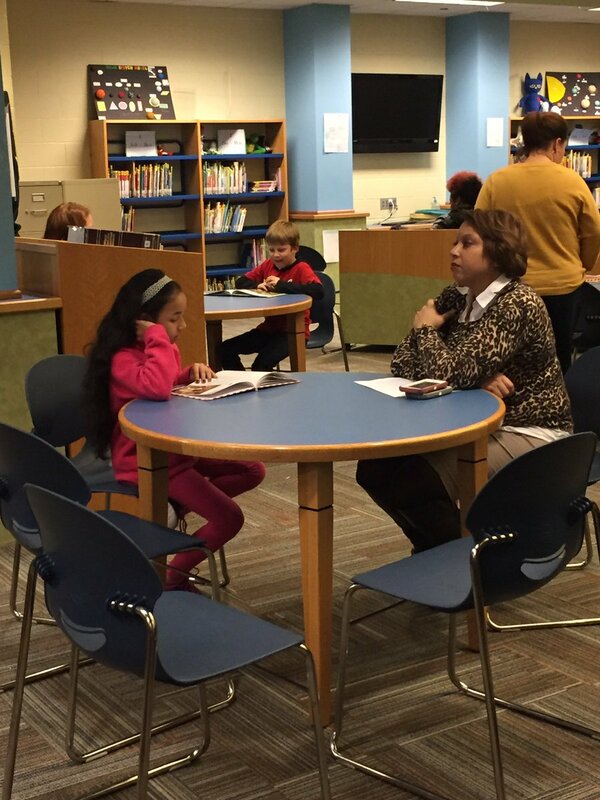 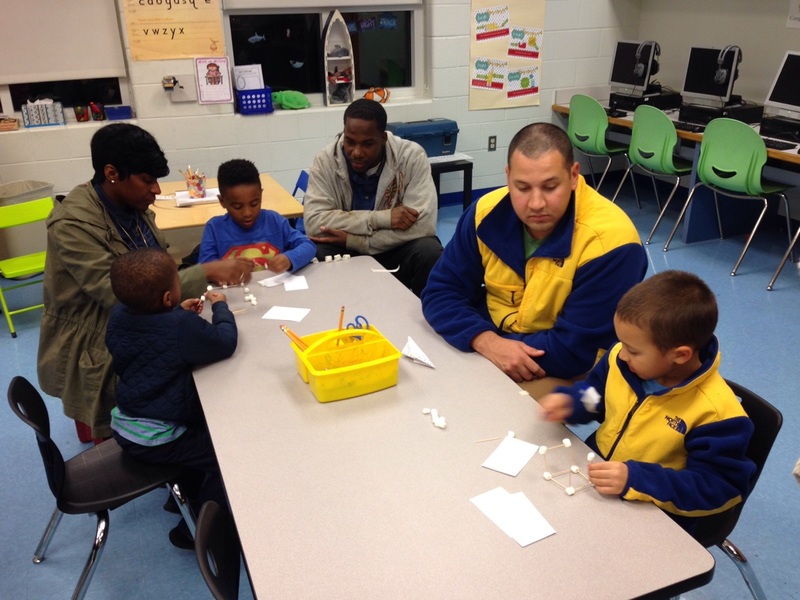 Parents of Title I students were invited to join their child during D.E.A.R time to enjoy reading together. 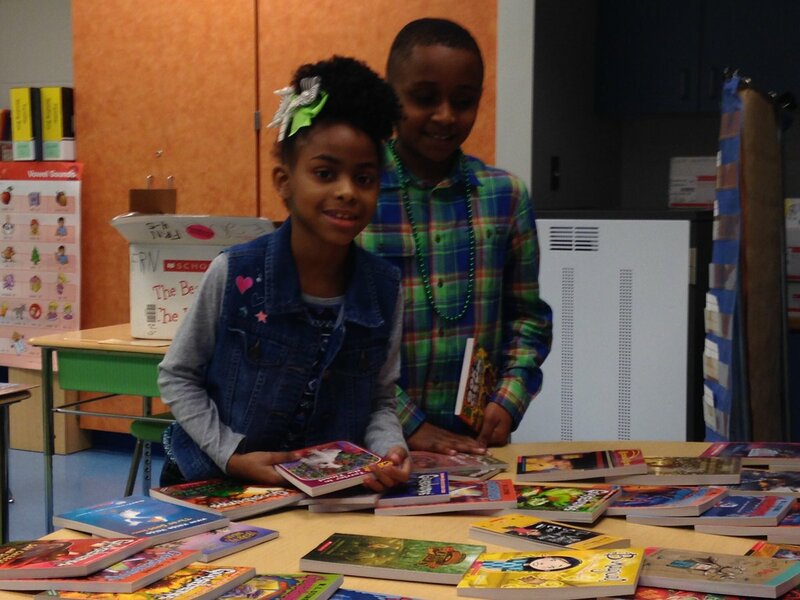 Each student that had a parent to come received a free book of their choice to add to their home library. 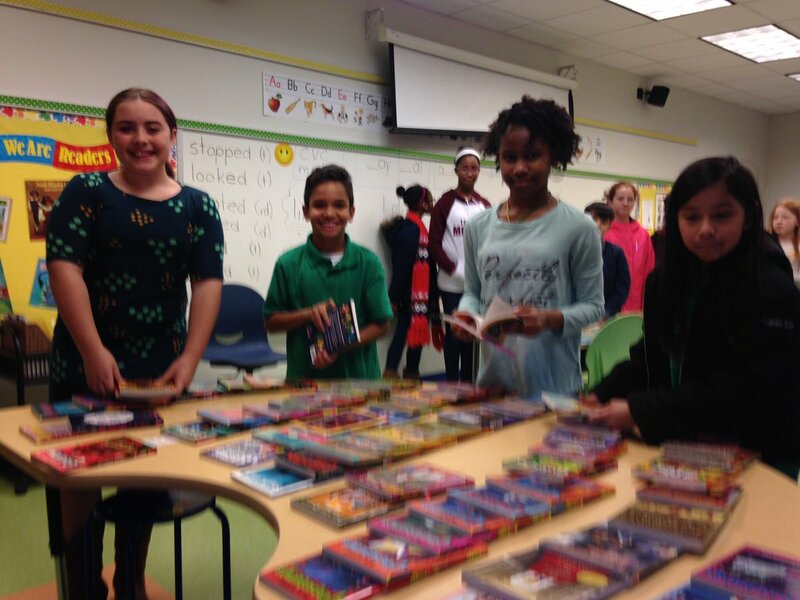 Students pick a new book for their home library! 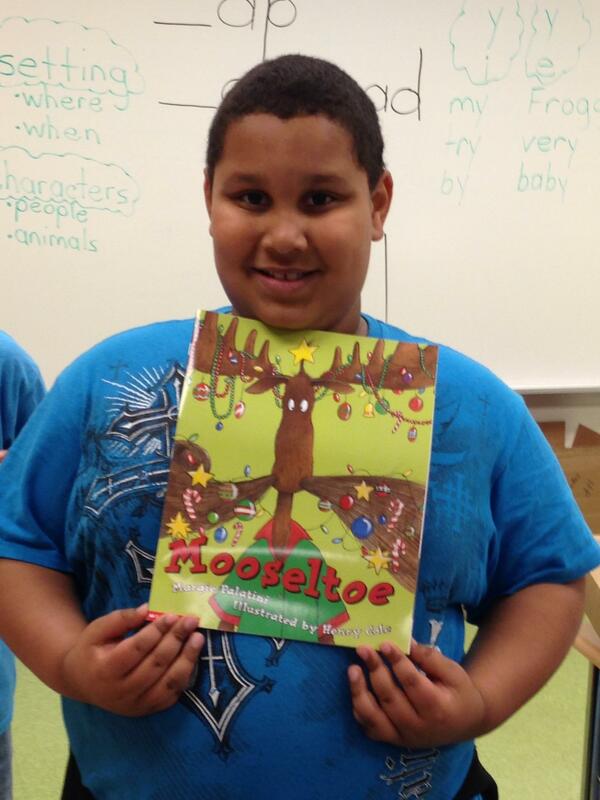 A new book–just in time for Christmas! 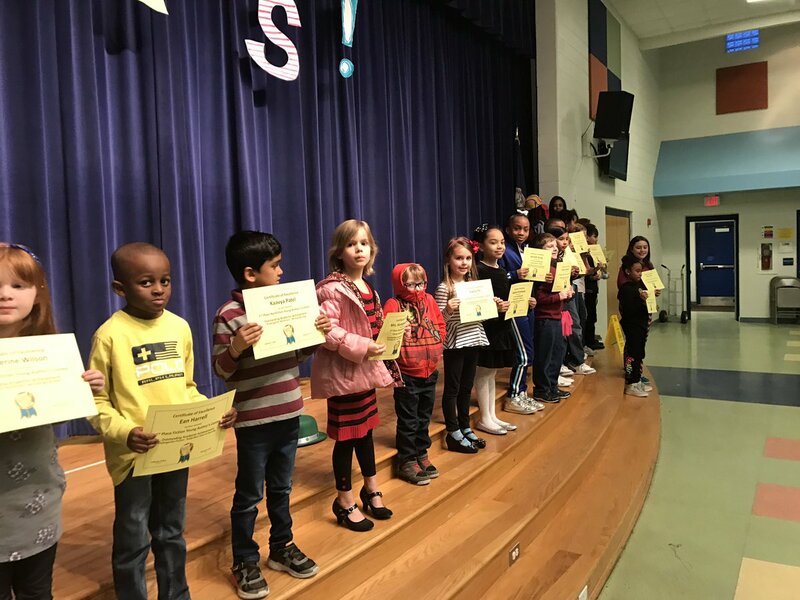 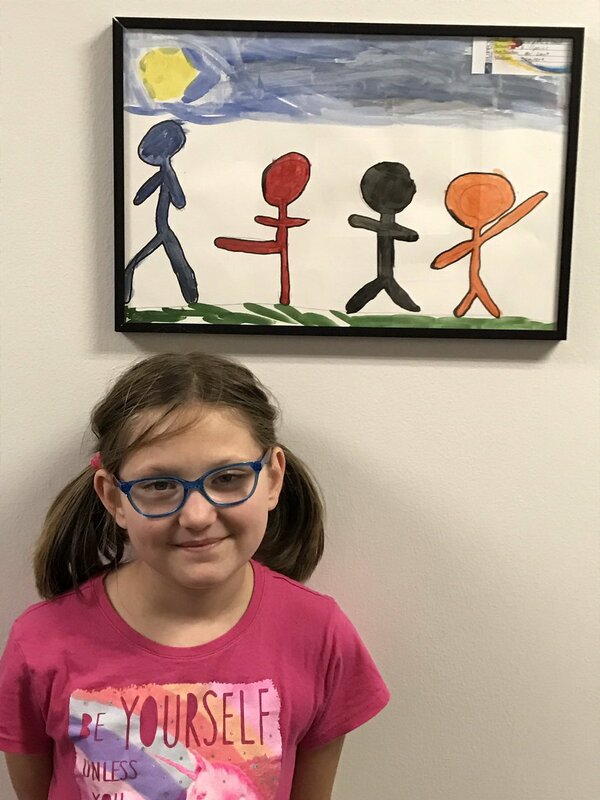 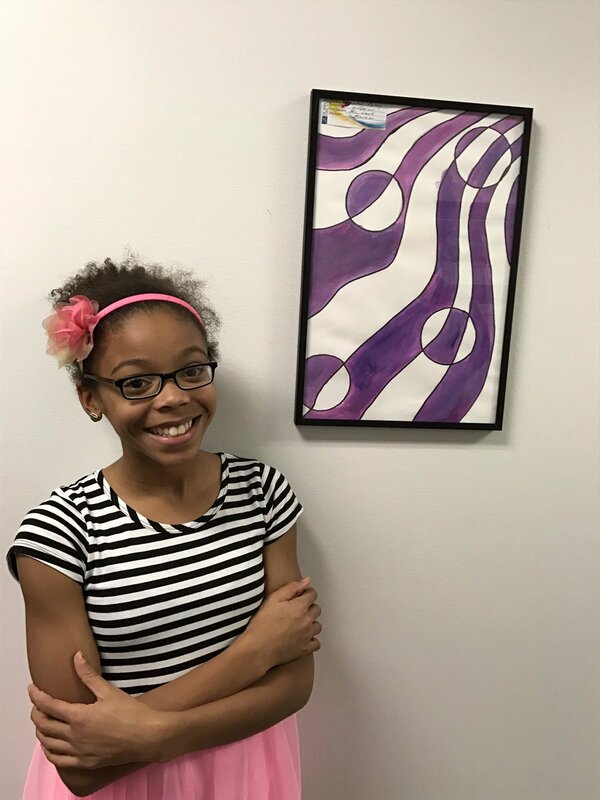 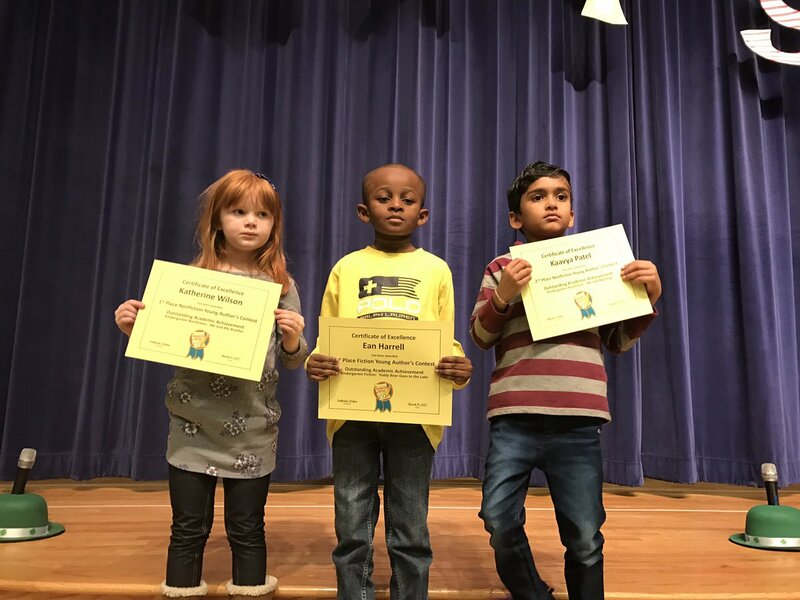 Congratulations to our wonderful student artists! 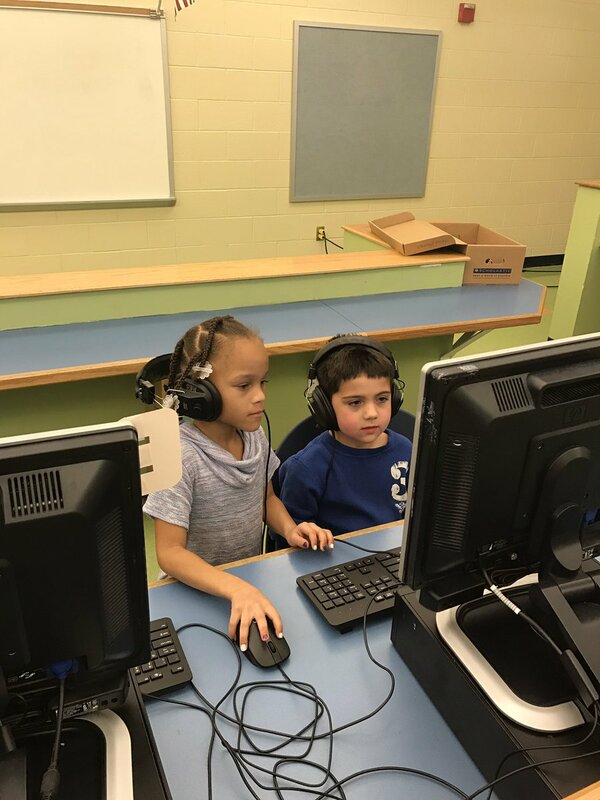 Computer Science Education Week (CSEdWeek) takes place December 5-11. 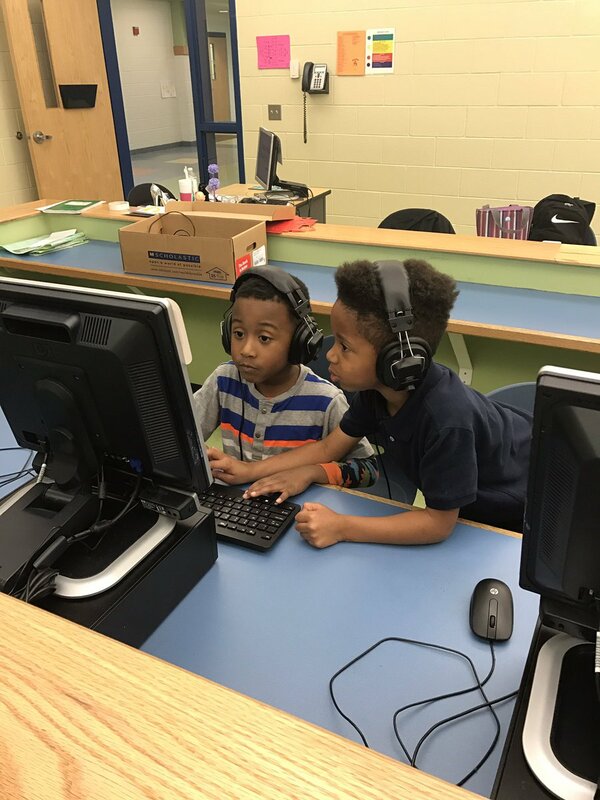 It was started to raise awareness about the need for computer science education at all levels and to underscore the critical role of computing in all careers. 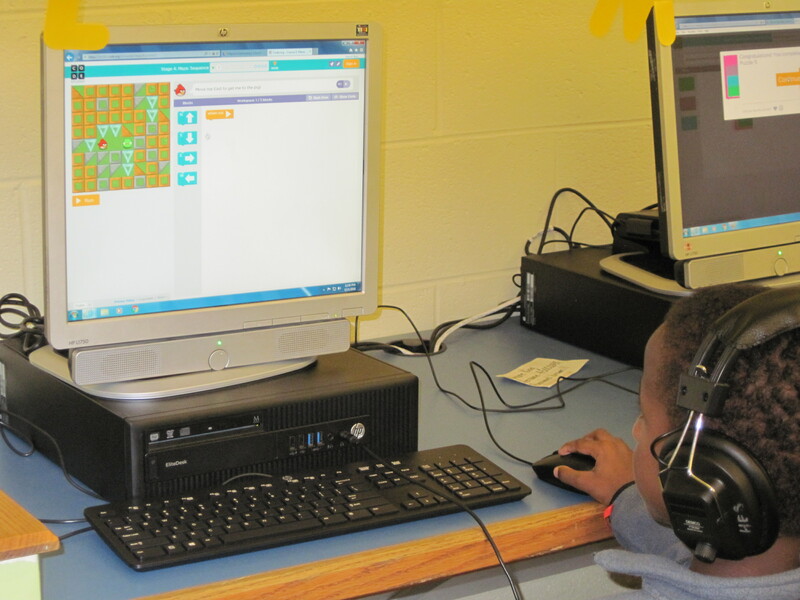 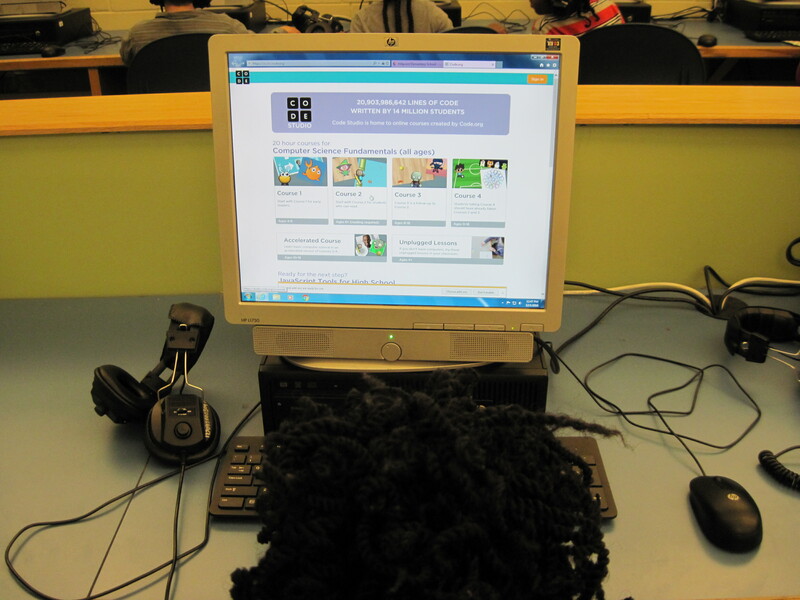 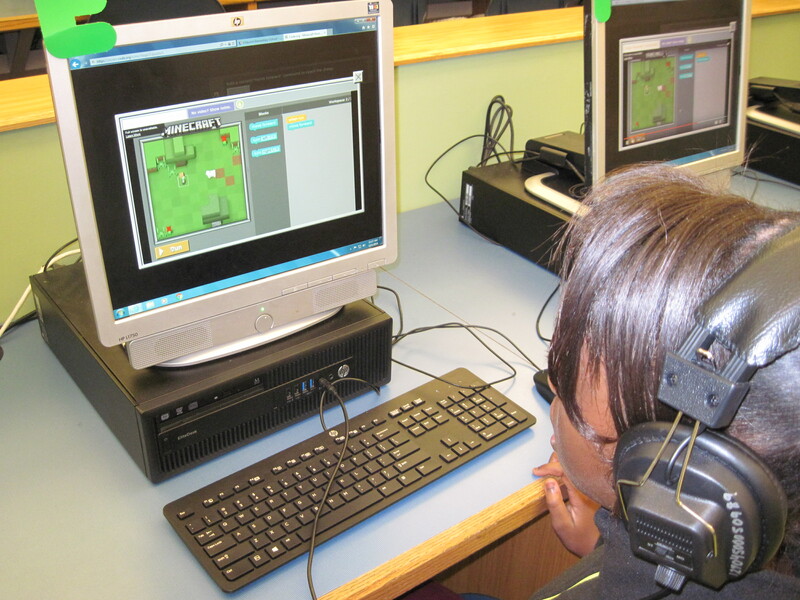 During the Hour of Code, students have the opportunity to think like a computer scientist as they try computer programming for one hour. 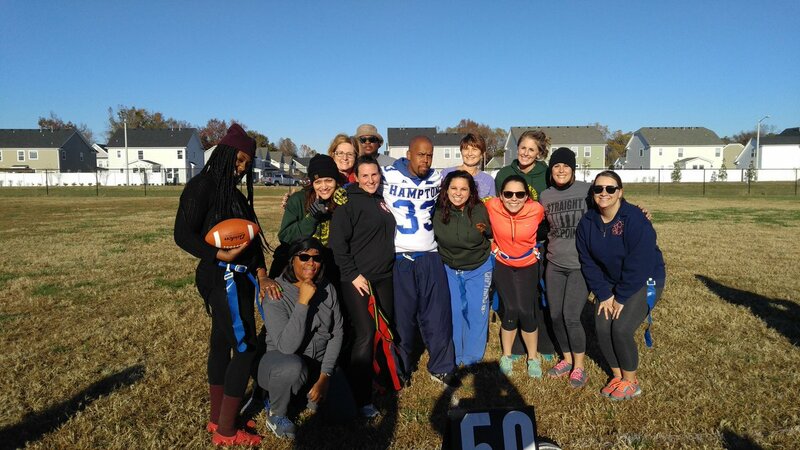 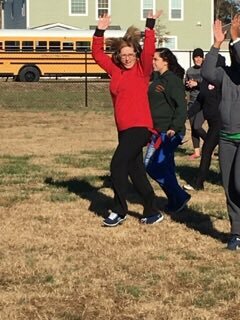 In order to raise money for Jump Rope for Heart, teachers, Coast Guard volunteers, and 5th grade students participated in a flag football game. 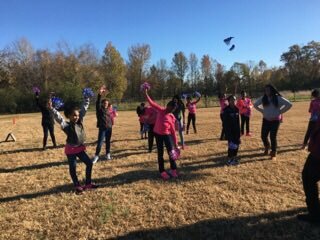 Students donated money in order to cheer on their favorite team! 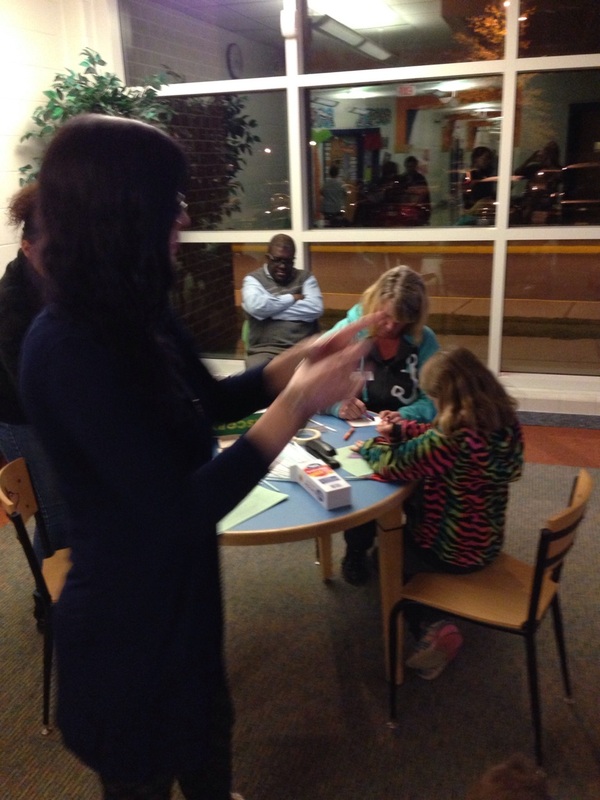 thank you to everyone who volunteered for make this possible! 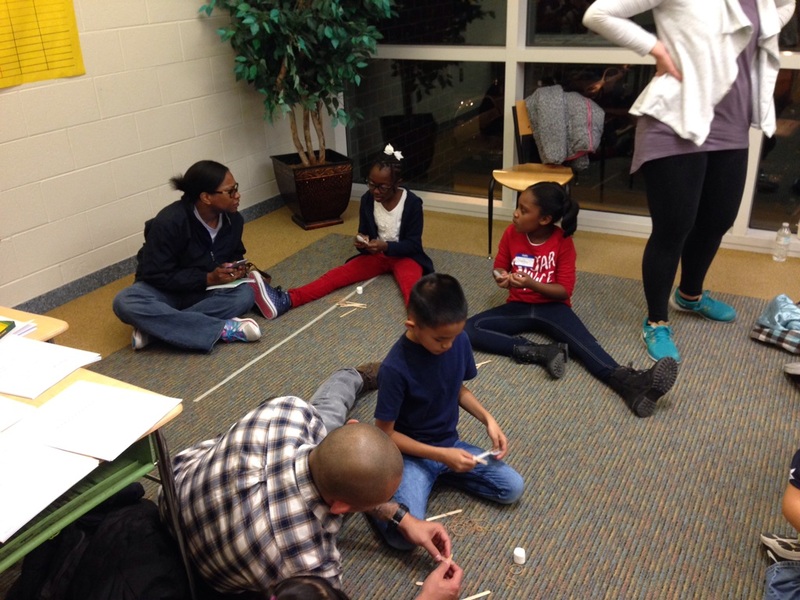 4th and 5th grade math students enjoyed a day of hands on math learning. 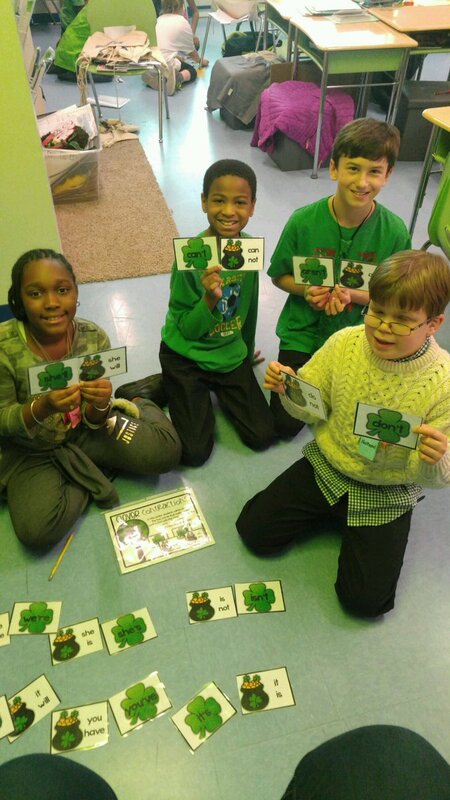 They used the skills they have been taught in math class to help solve real world problems, and to complete challenging math puzzles involving movement. 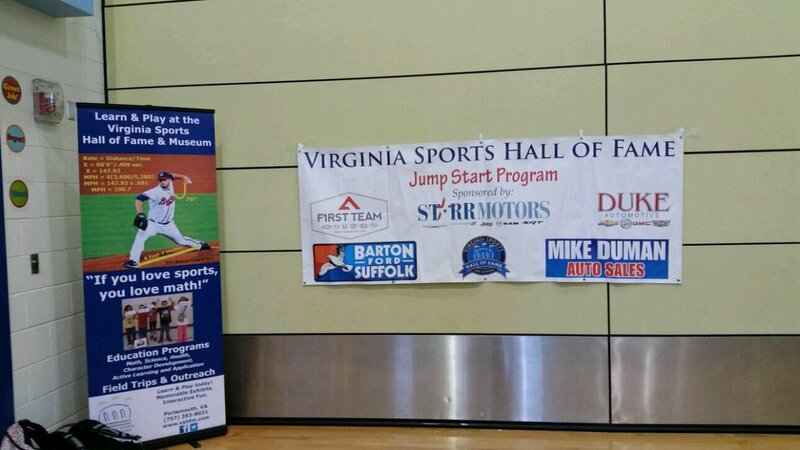 And a special thanks to the Virginia Sports Hall of Fame and Suffolk Auto Dealers for sponsoring this event! 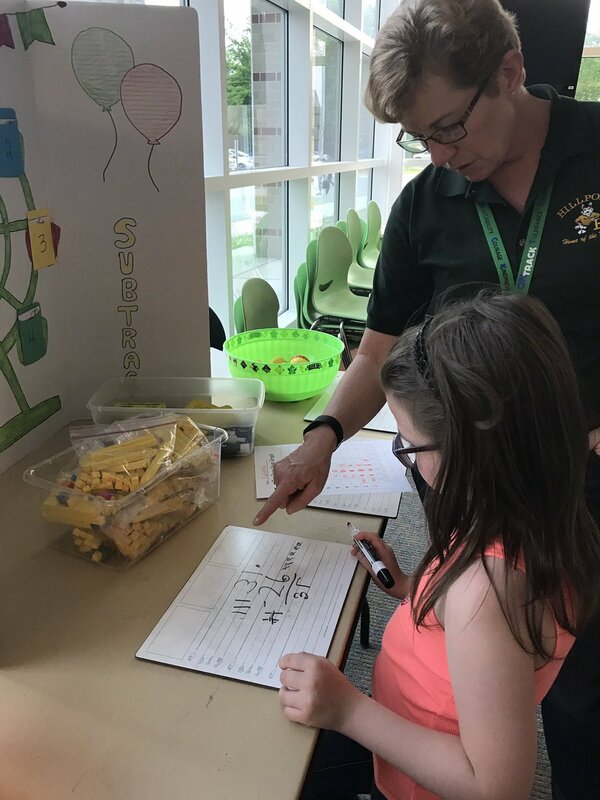 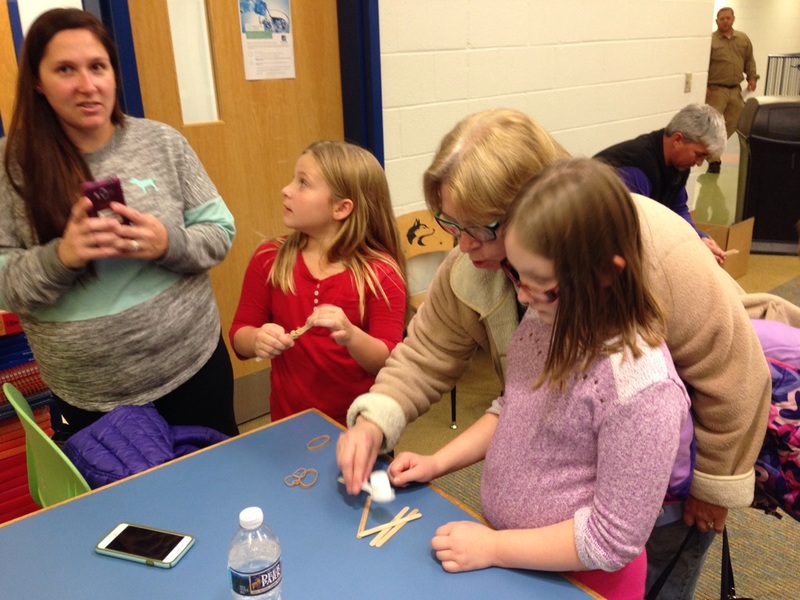 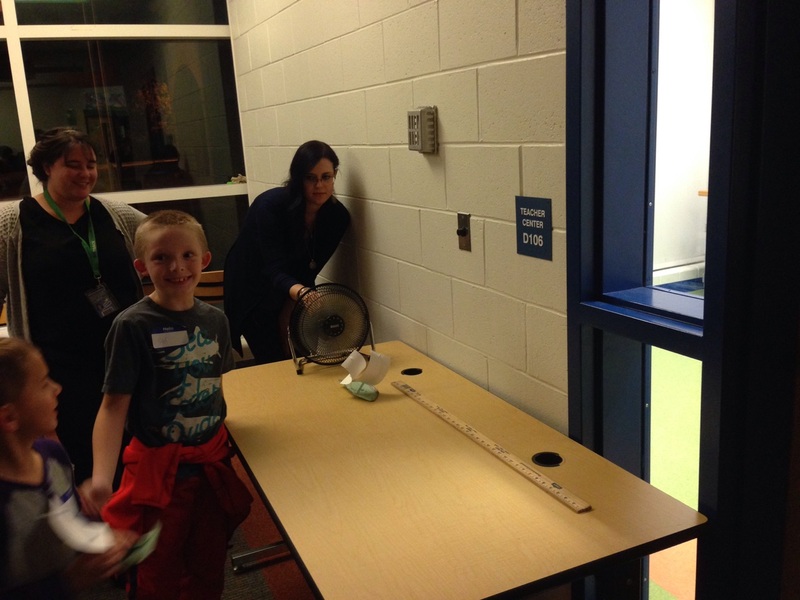 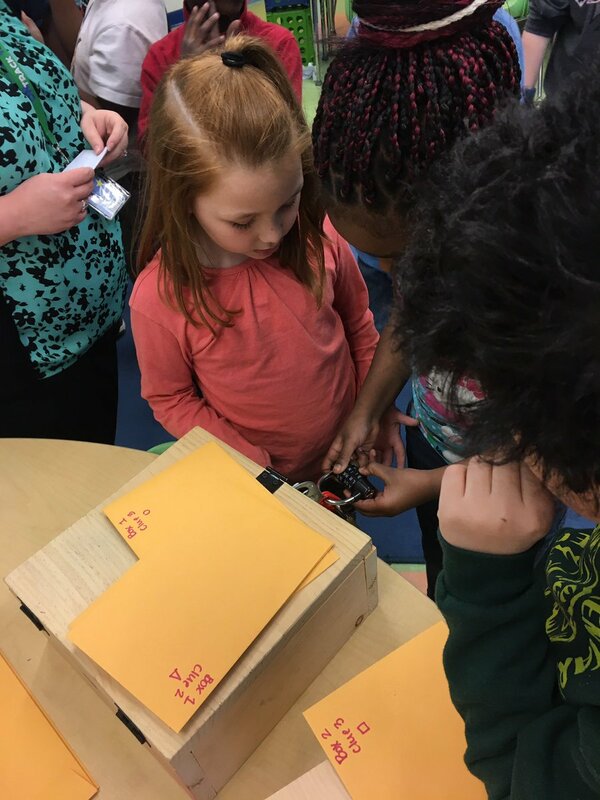 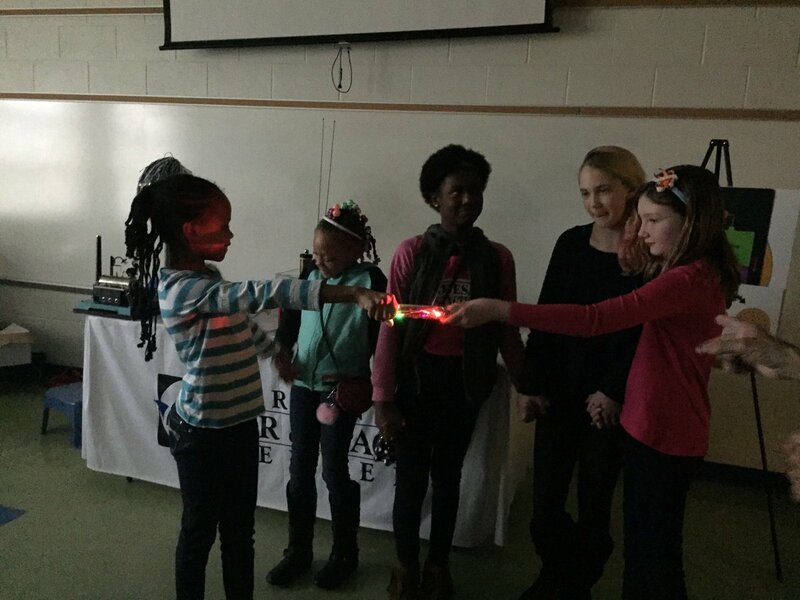 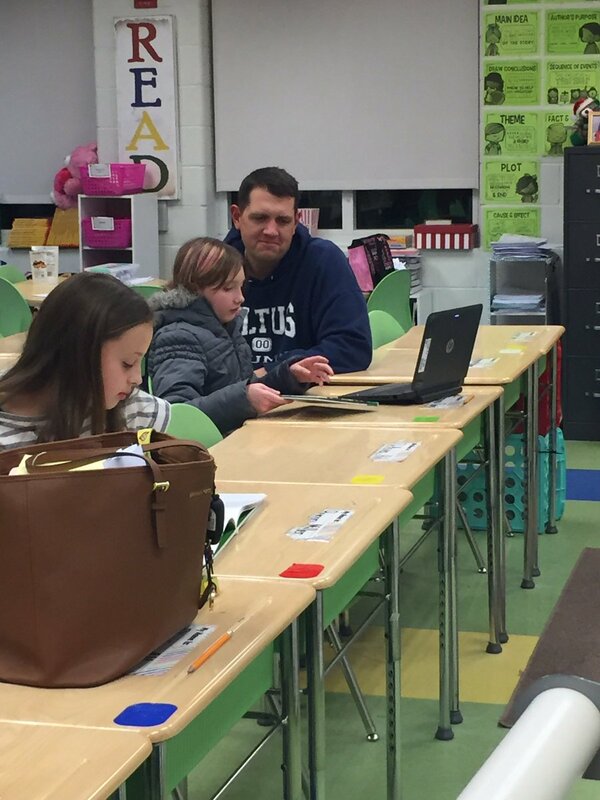 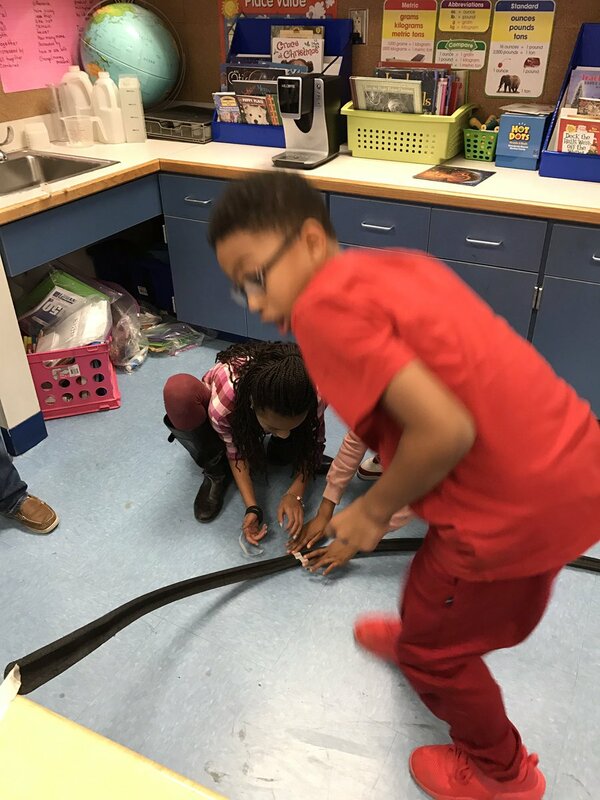 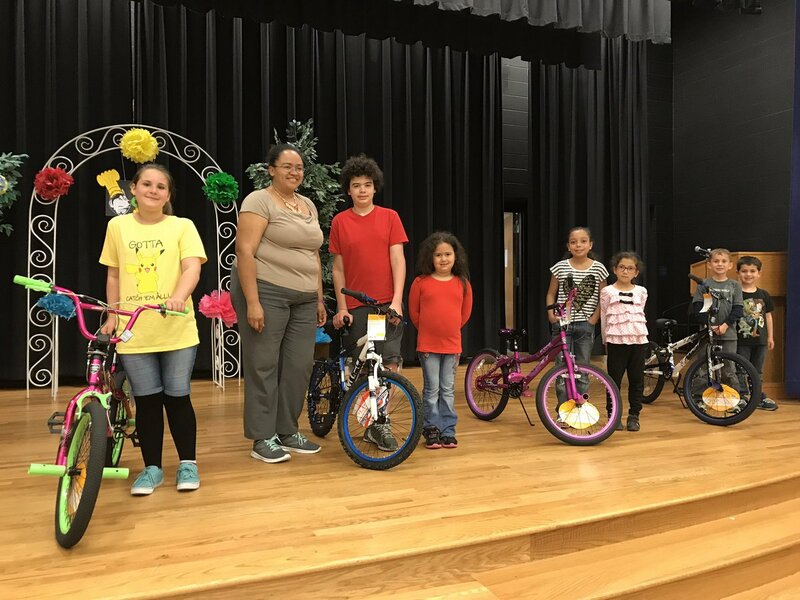 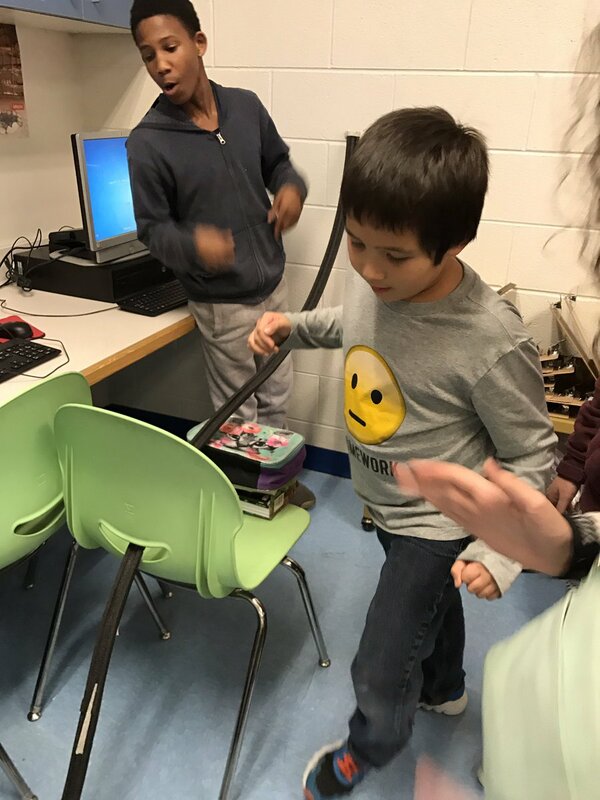 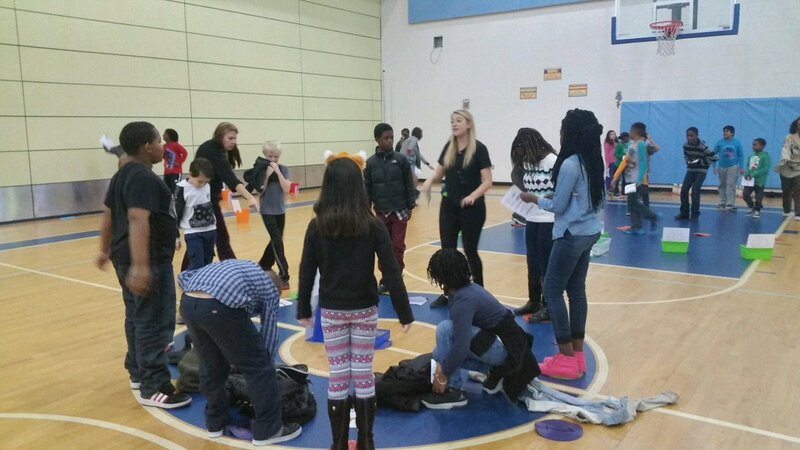 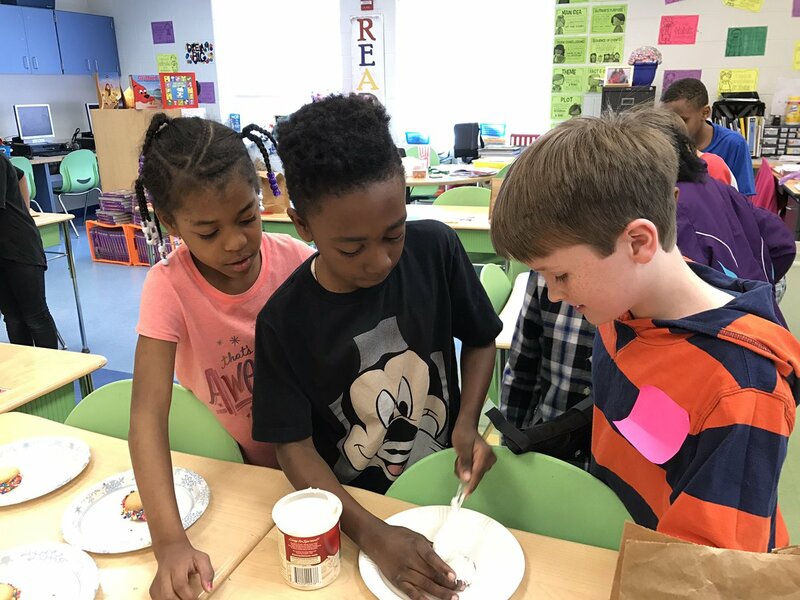 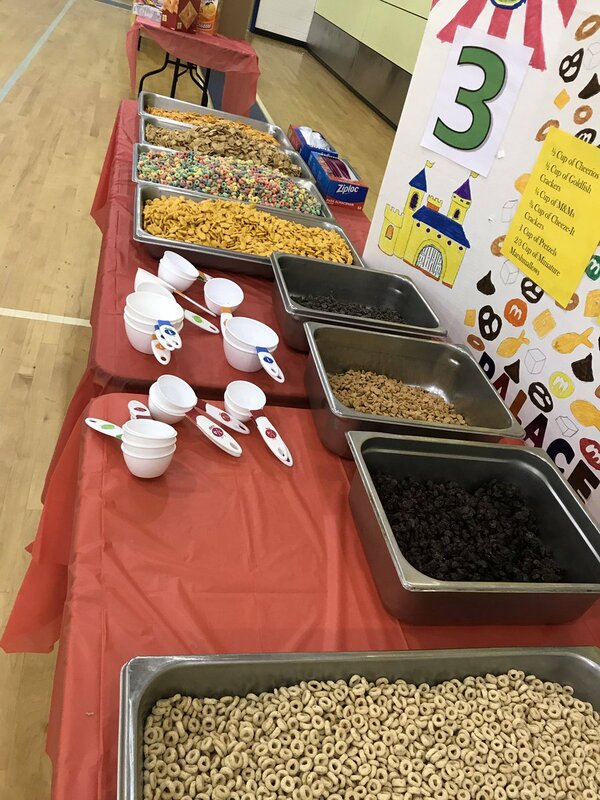 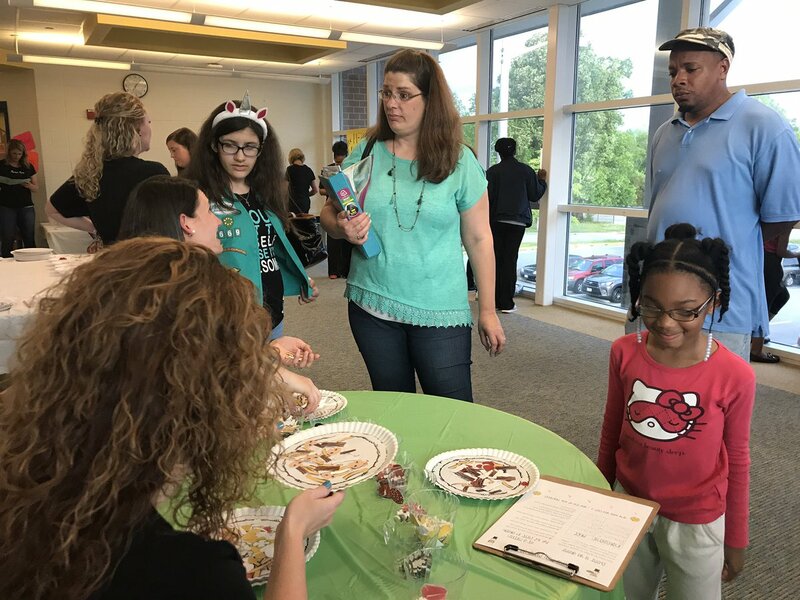 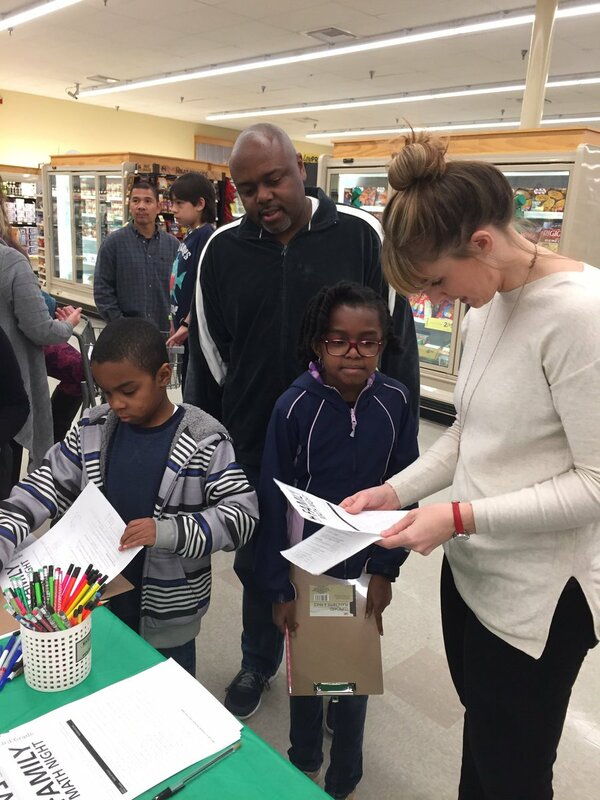 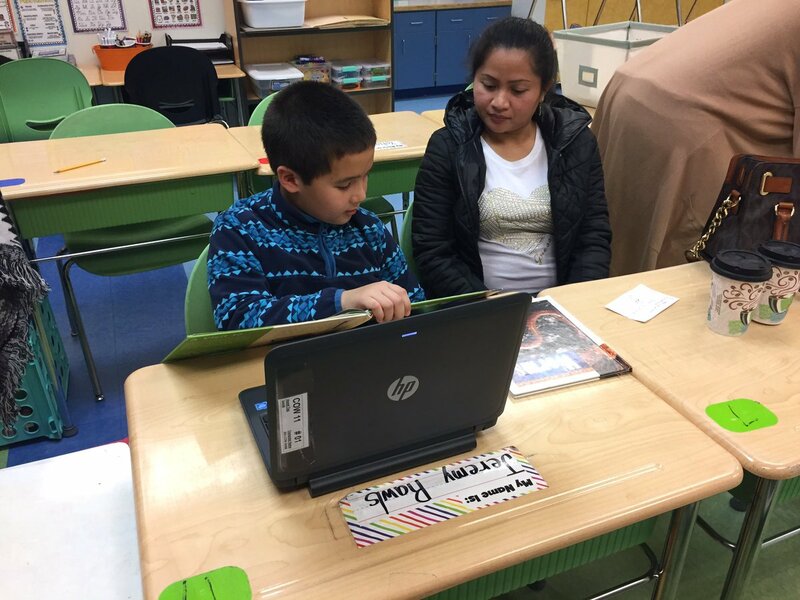 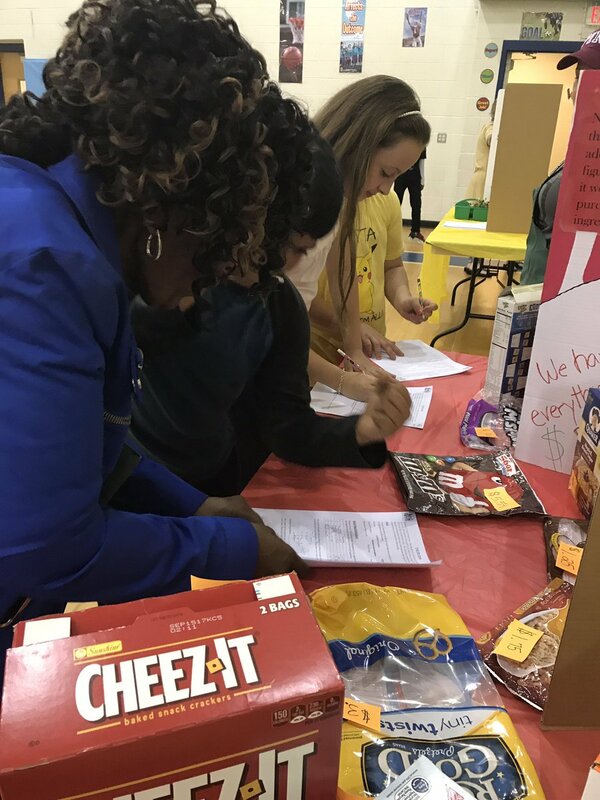 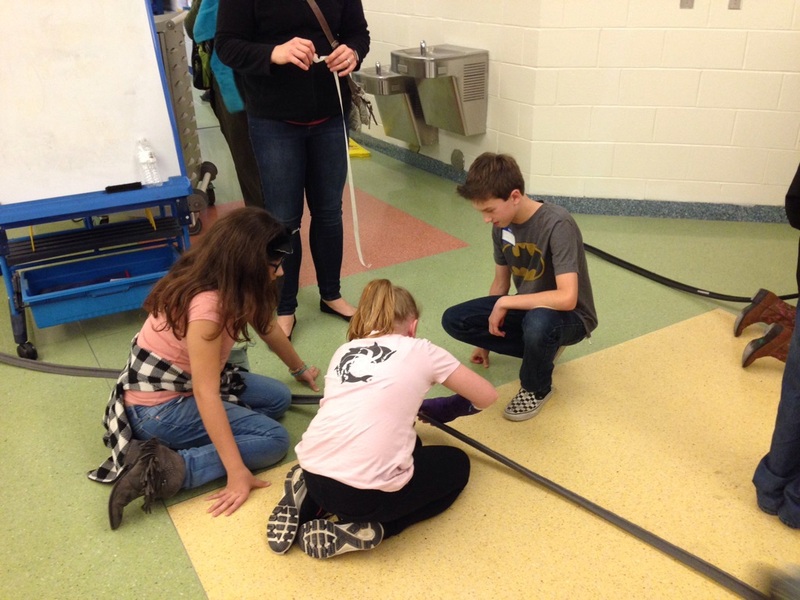 Students and their parents were given the opportunity to interact together by completing fun, hands-on activities as they participated in Hillpoint Elementary’s annual STEM (science, technology, engineering, math) night. 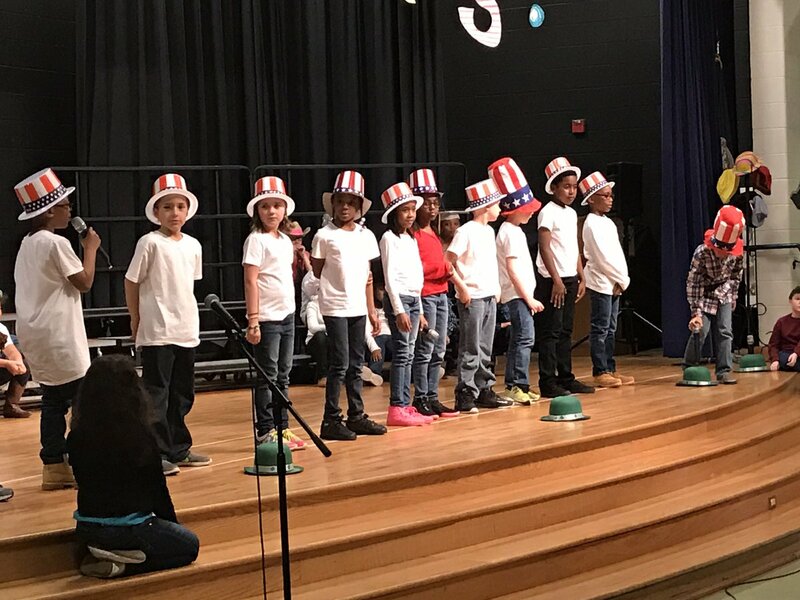 The evening began with a pizza dinner followed by songs from third grade students. 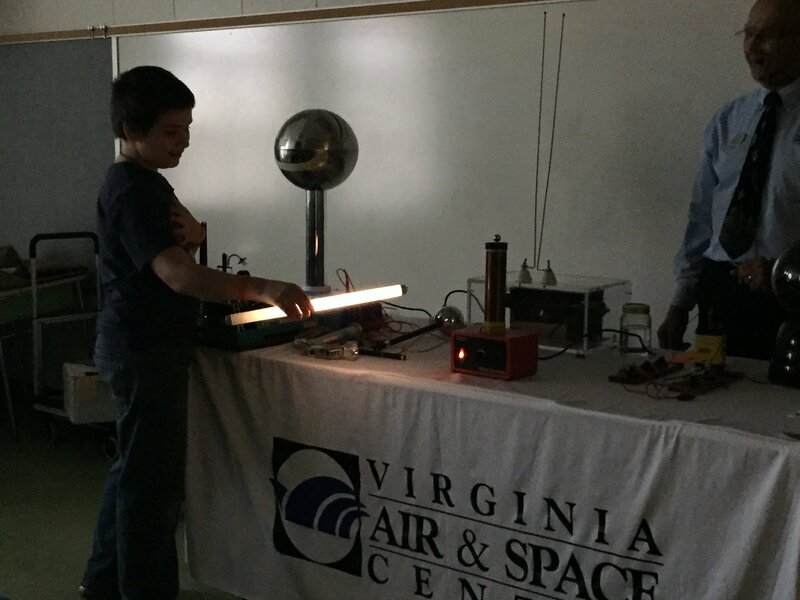 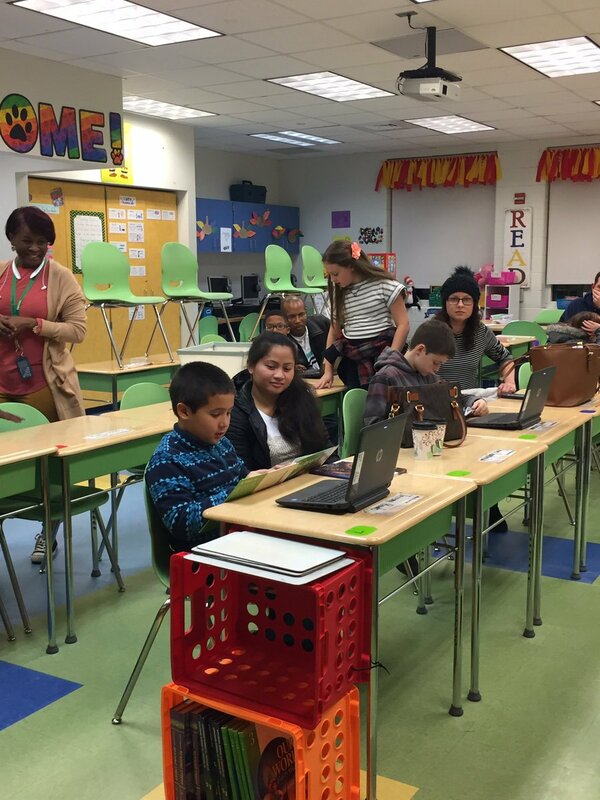 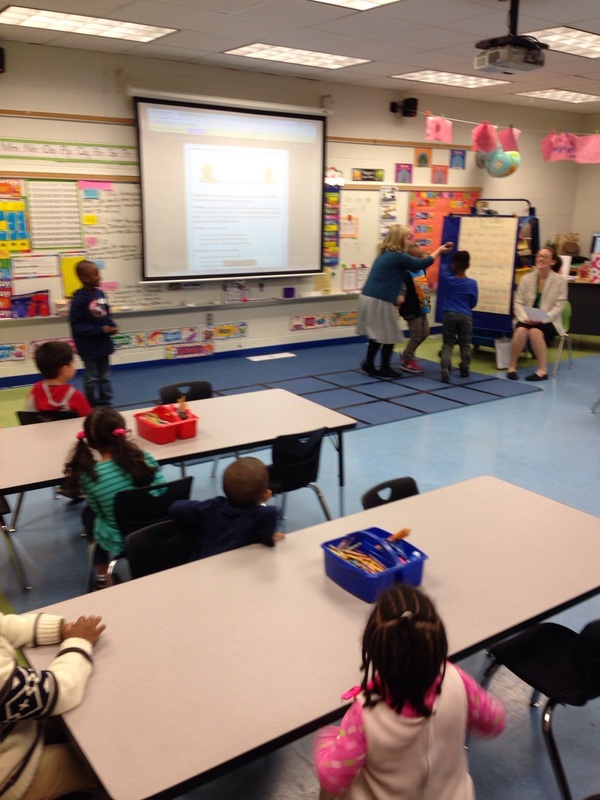 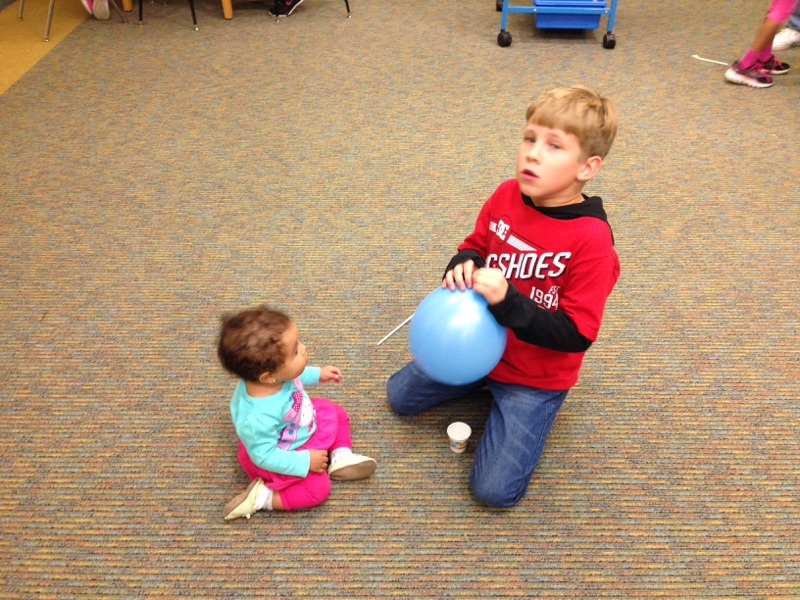 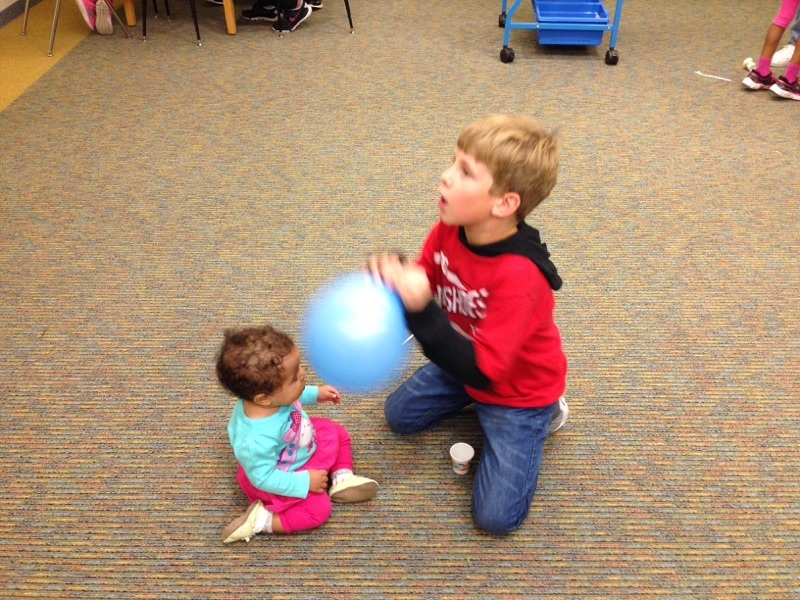 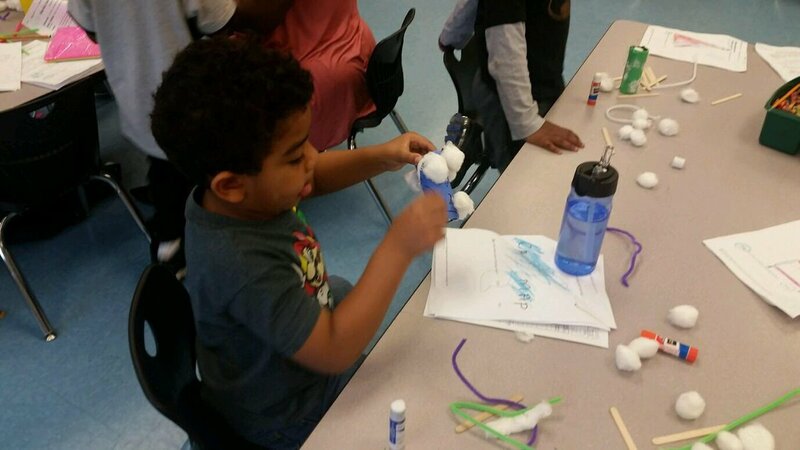 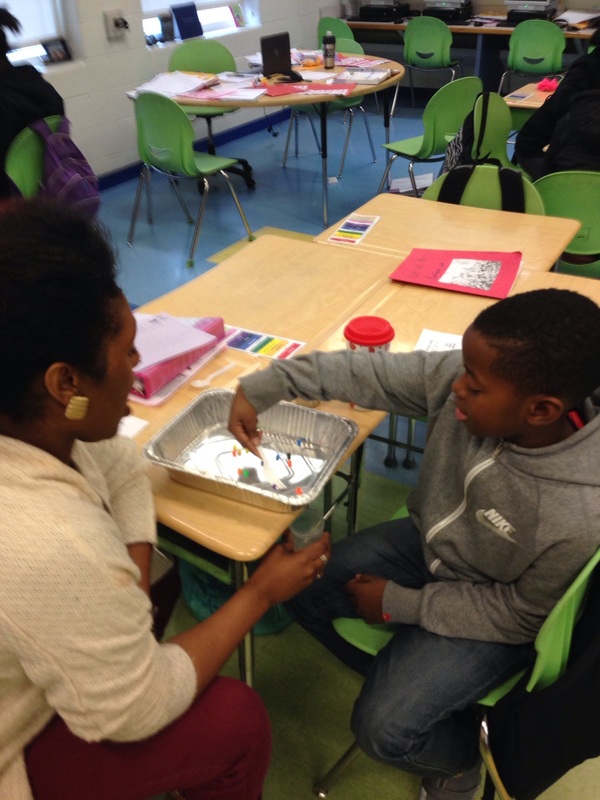 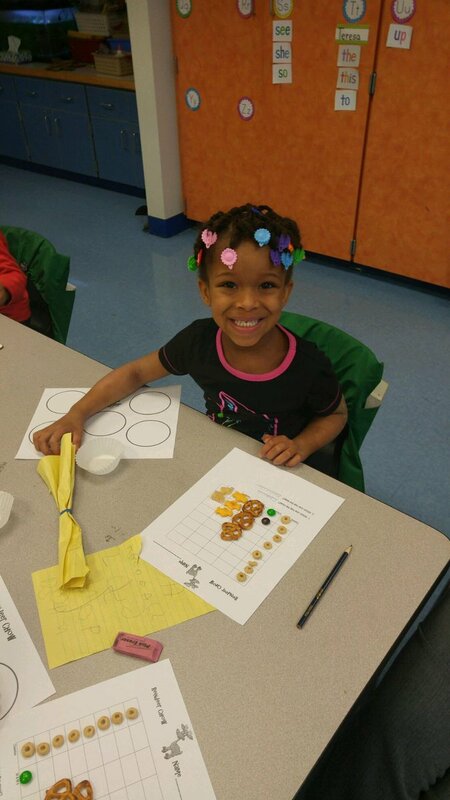 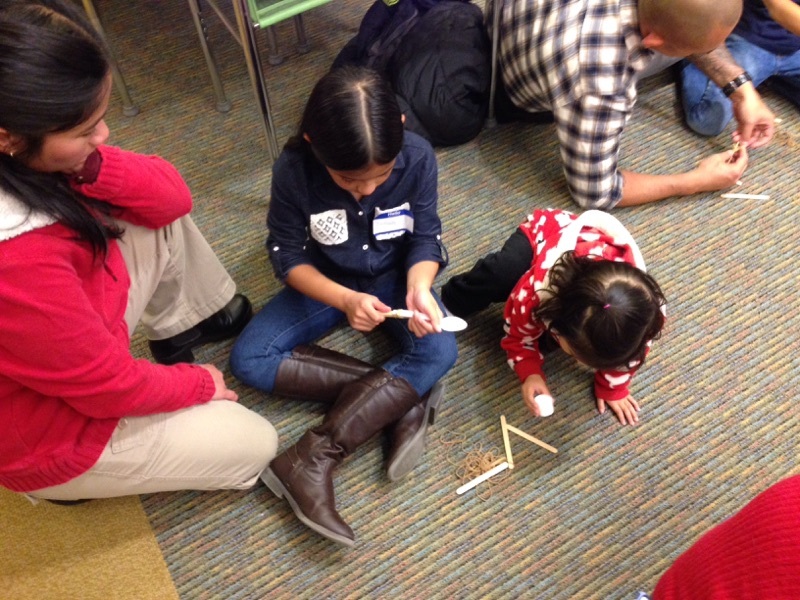 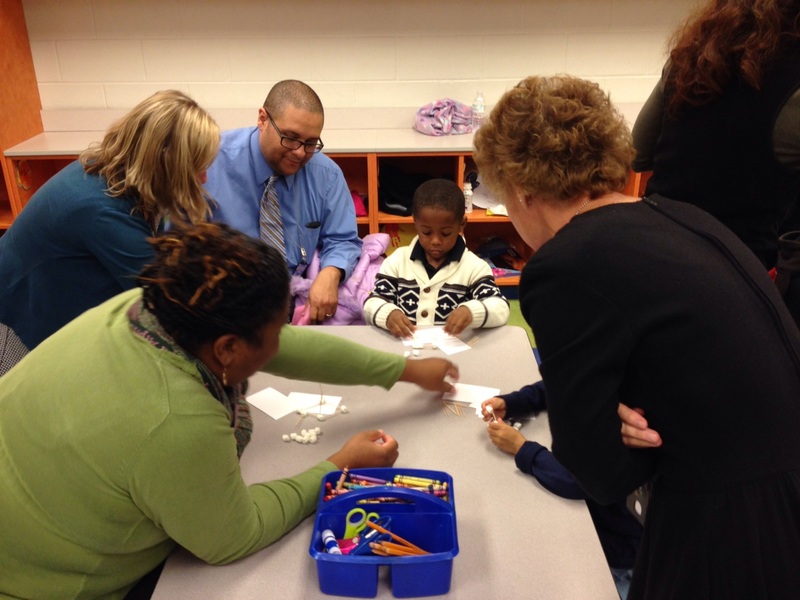 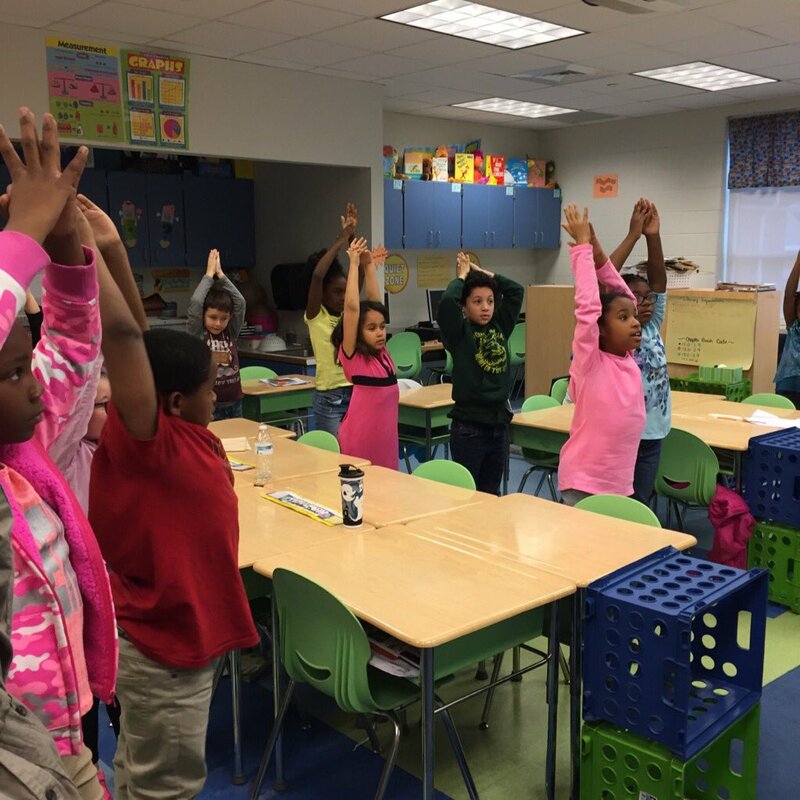 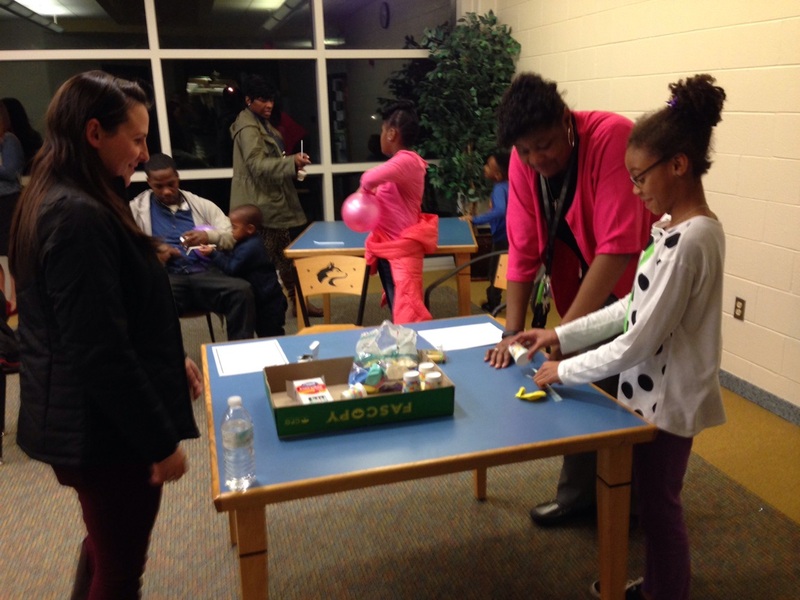 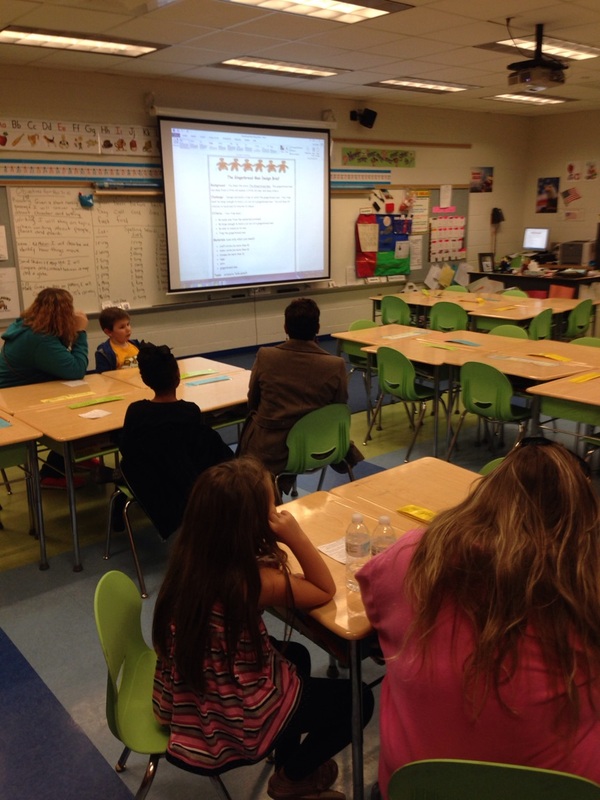 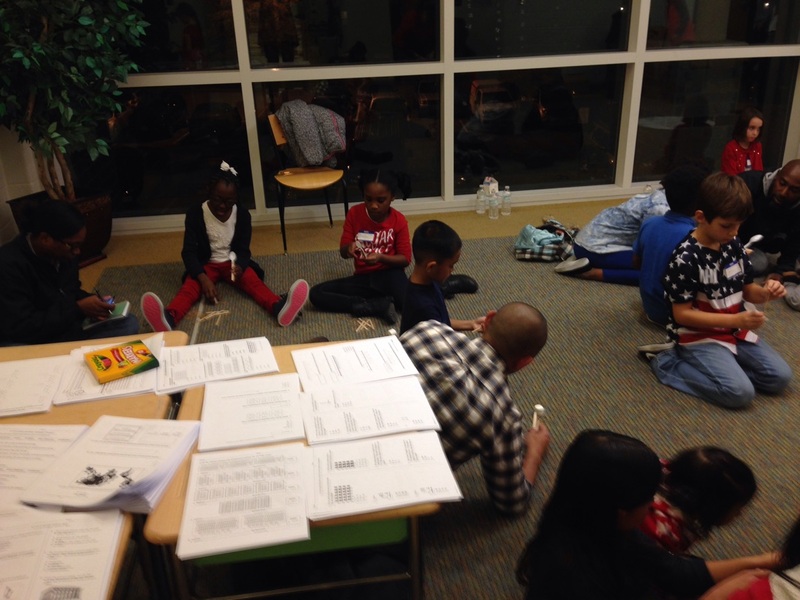 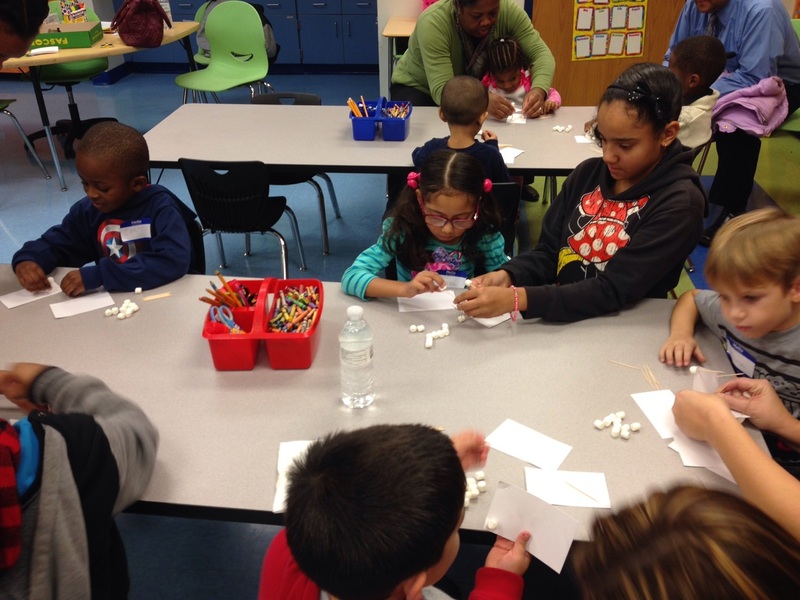 After a PTA meeting, students and their parents reported to the classrooms to complete SOL-related STEM activities. 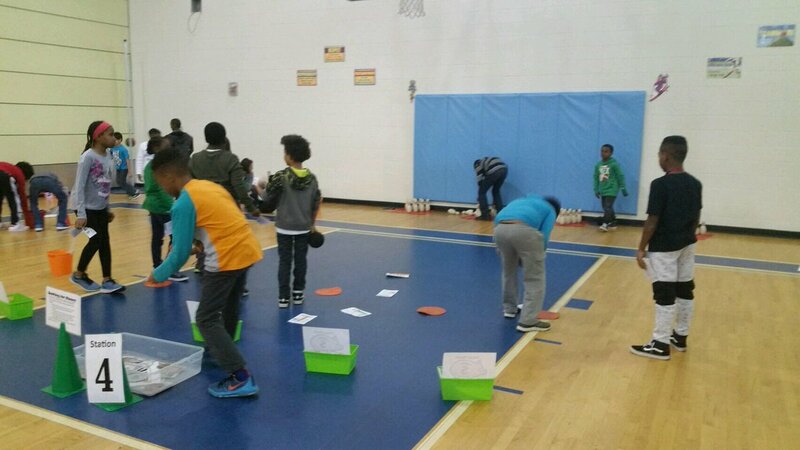 There were also 12 stations set up in the gym. 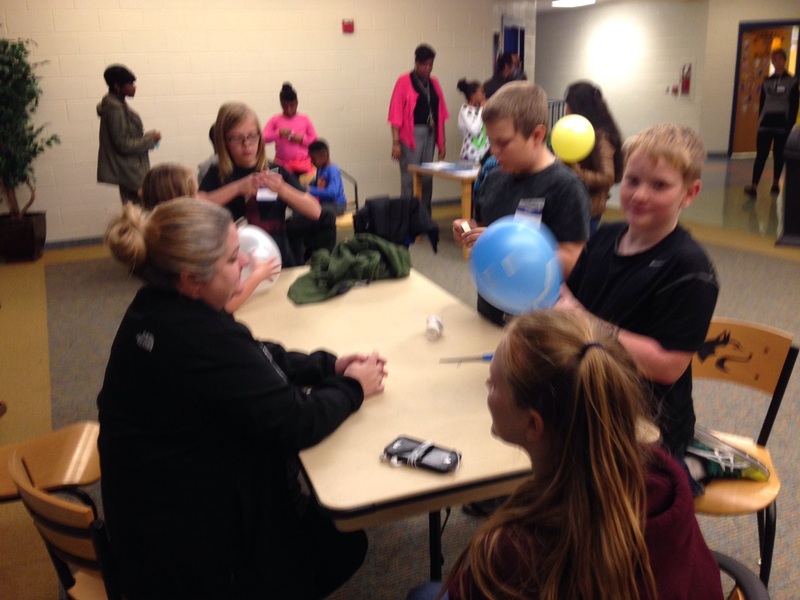 Participants rotated through the stations completing a variety of STEM-related challenges. 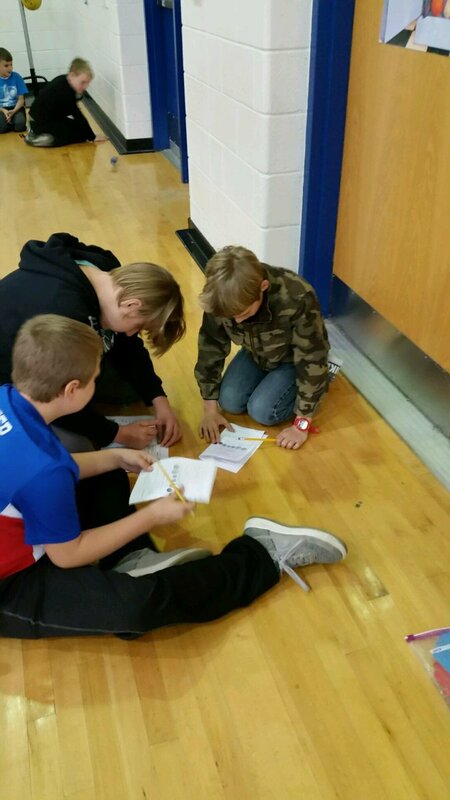 In completing the tasks presented, students were required to think creatively, solve open-ended problems and work in teams. 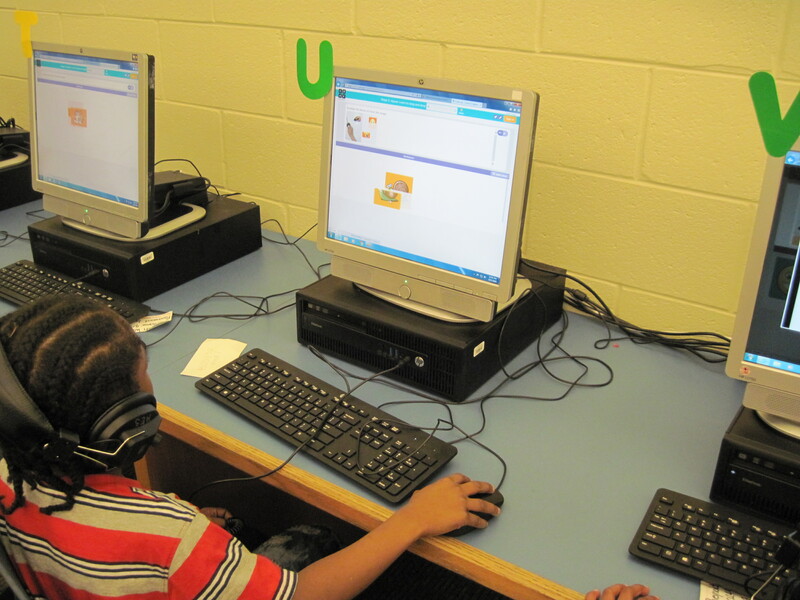 All these are important 21st century skills. 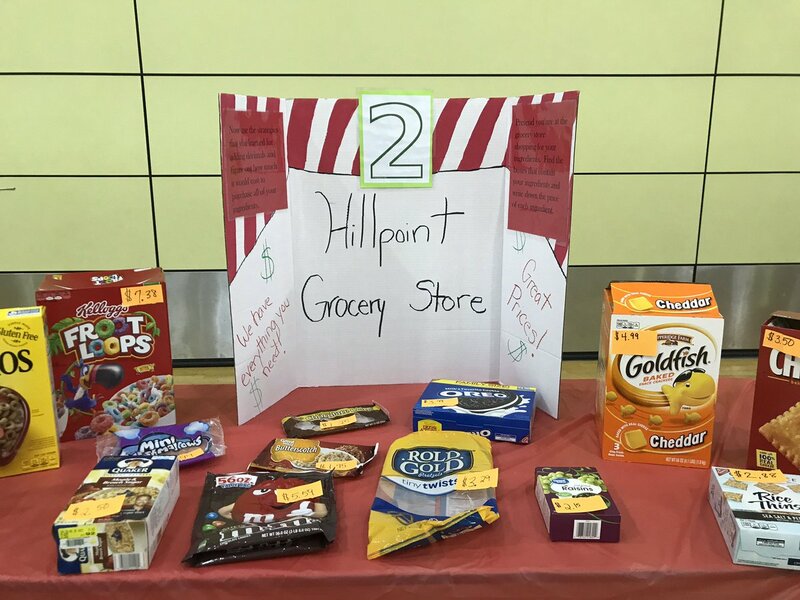 Hillpoint Elementary celebrated our first annual Trunk or Treat Harvest Festival this past Thursday, October 27. 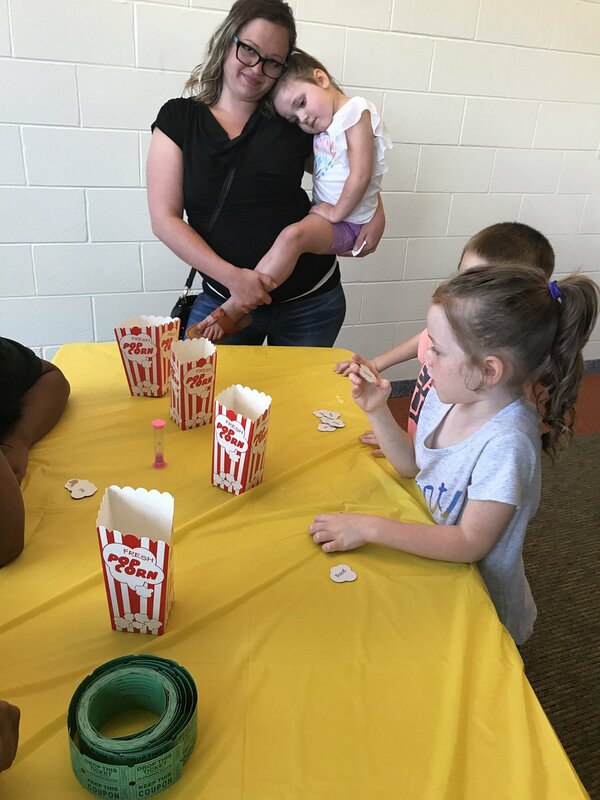 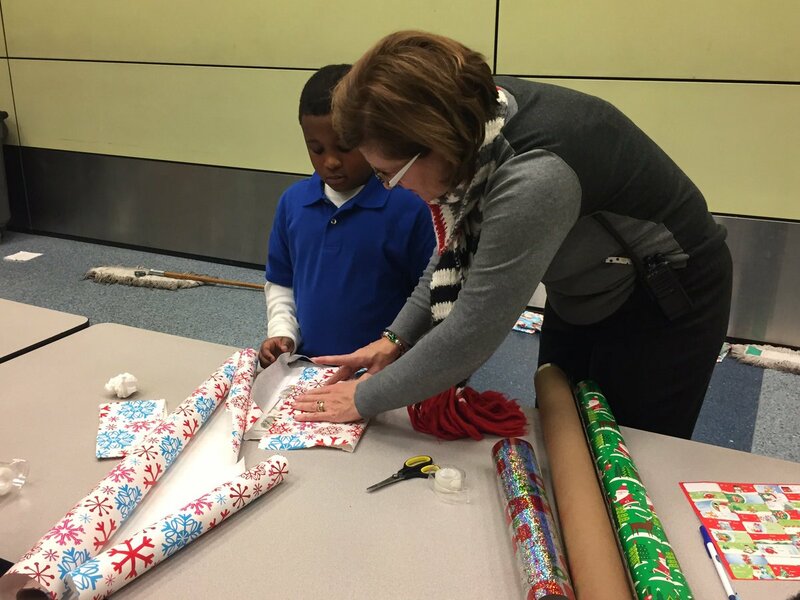 Staff and parent volunteers prepared trunks and fun activities, and Partners in Education like the Suffolk Police Department and the Suffolk Public Library came out to help us celebrate. 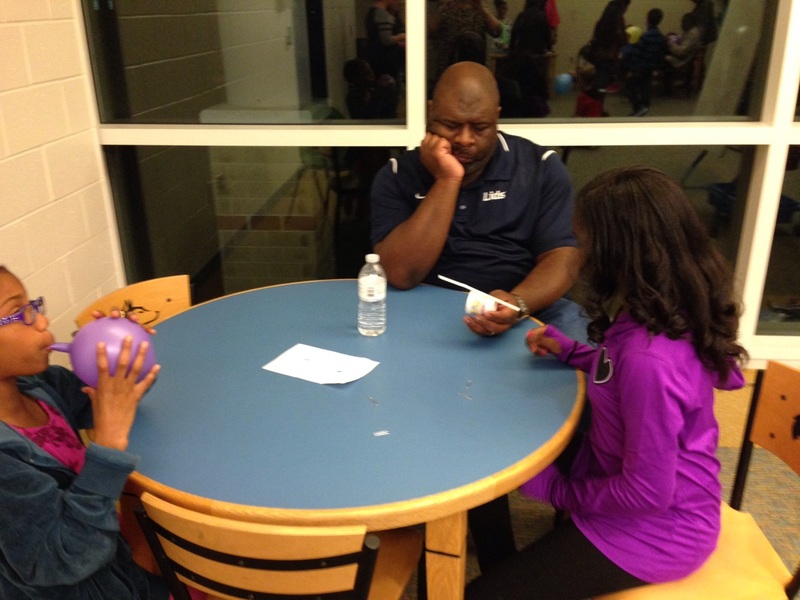 Over 900 parents families came to eat candy, go on hayrides, listen to music, and celebrate as a community. 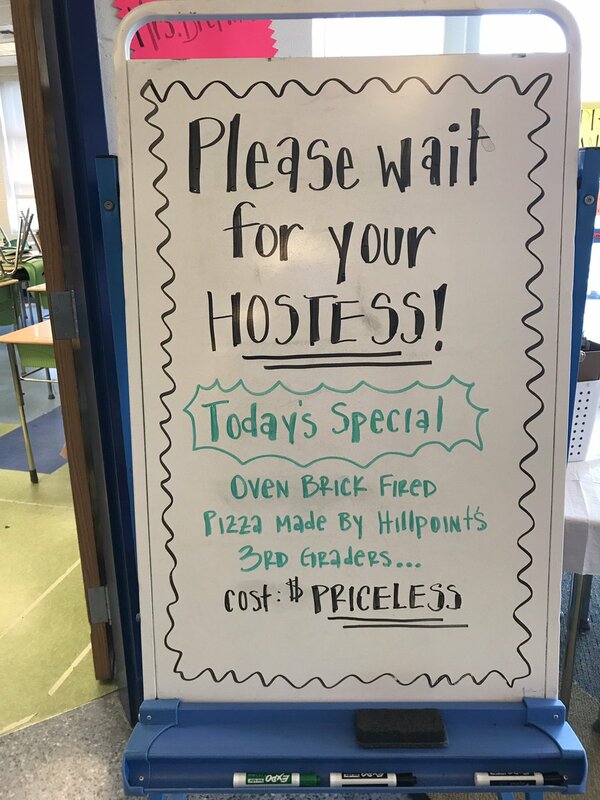 We have such an awesome Hillpoint Family! 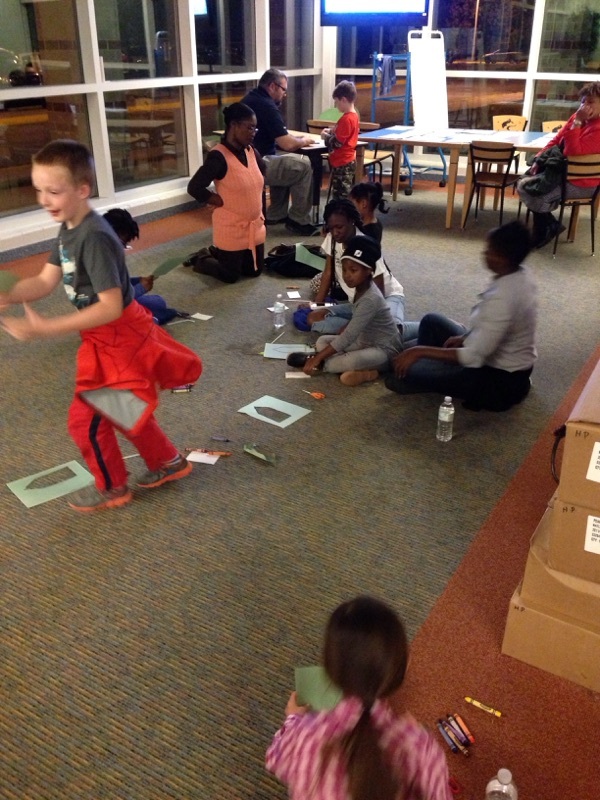 Thank you to everyone who contributed to making our night fantastic! 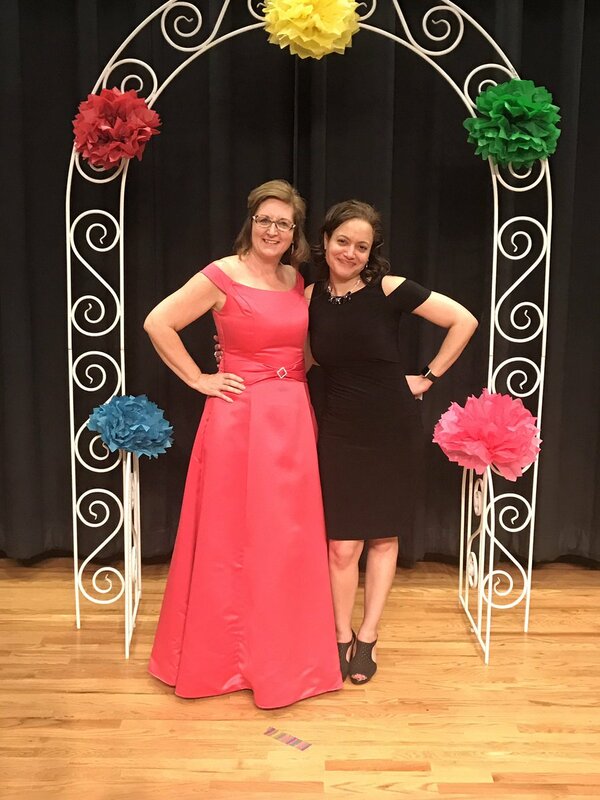 Click the image below to be linked to a photo album of some of the awesome pictures from our fest! 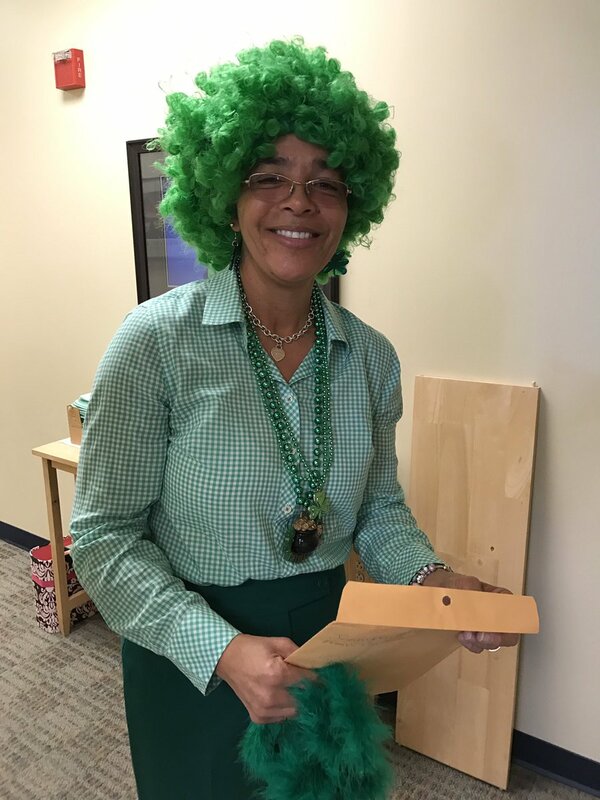 To help raise money for United Way, students and staff participated in Spirit Week! 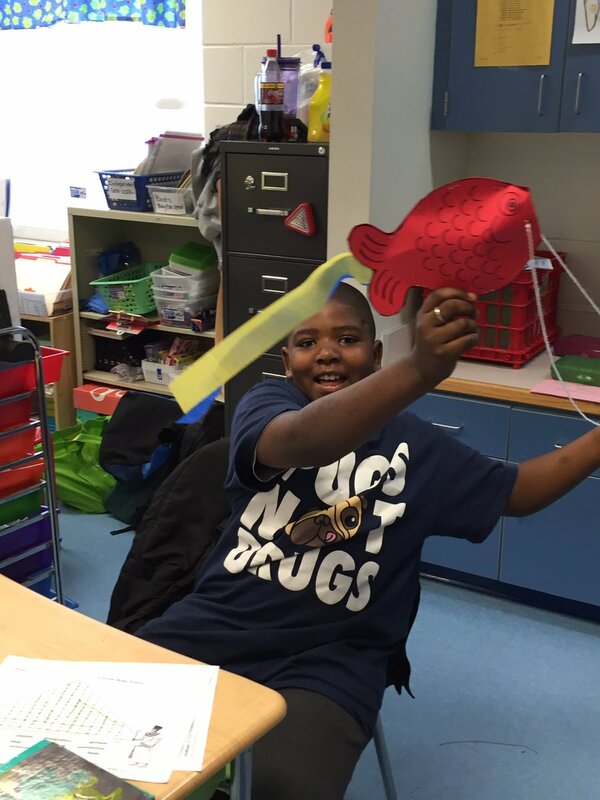 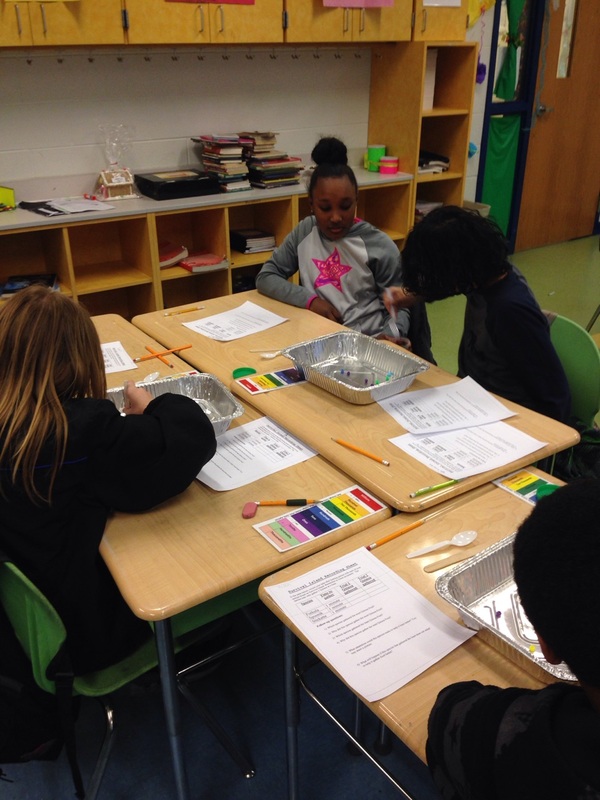 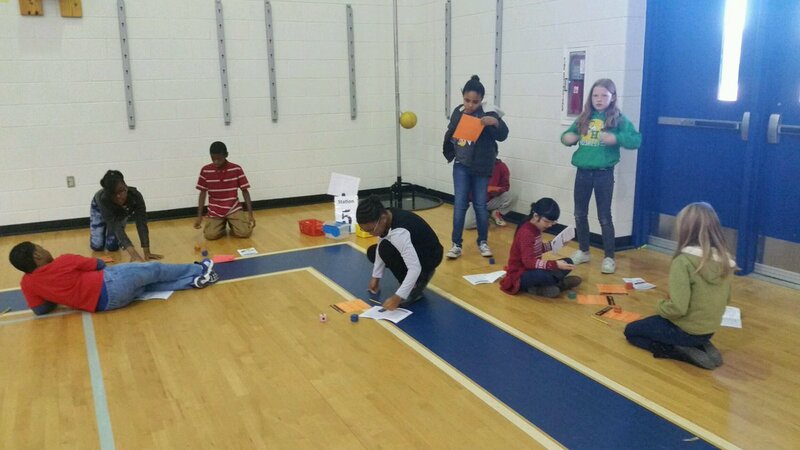 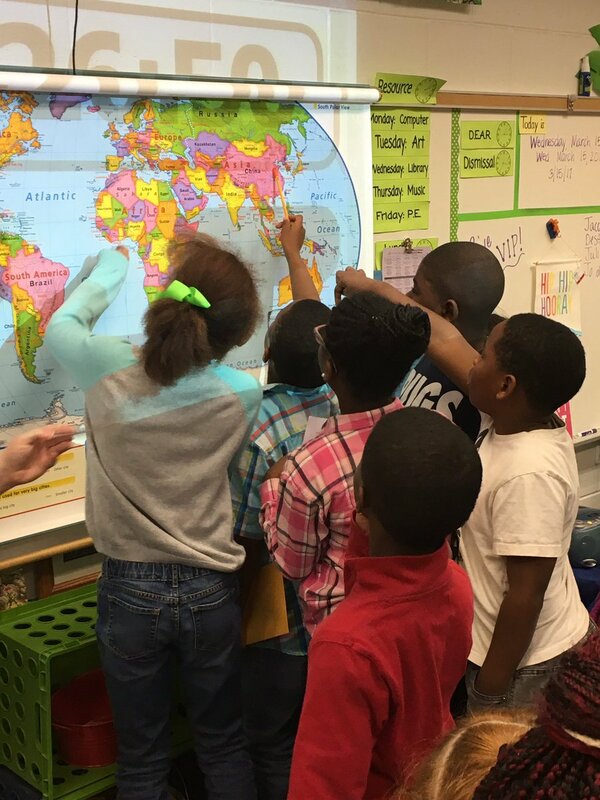 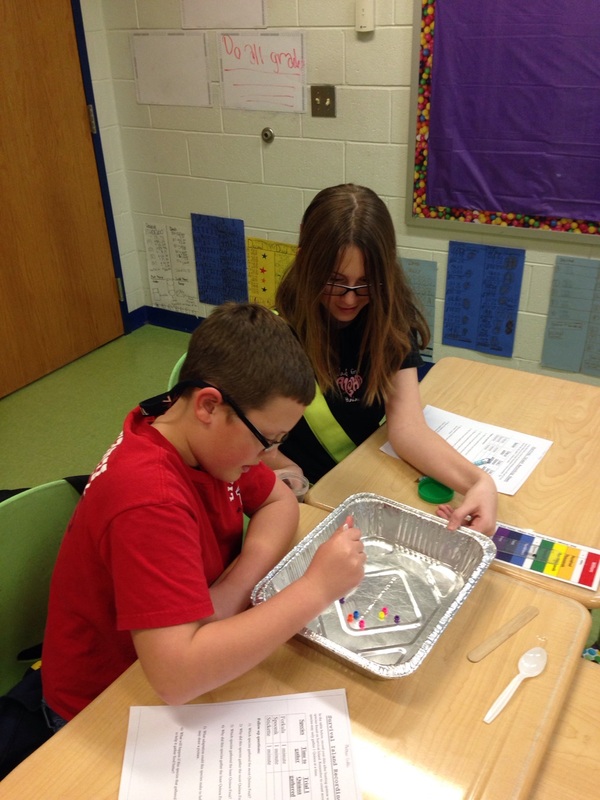 Students in the fourth grade at Hillpoint Elementary were given an assignment–create a model of the solar system. 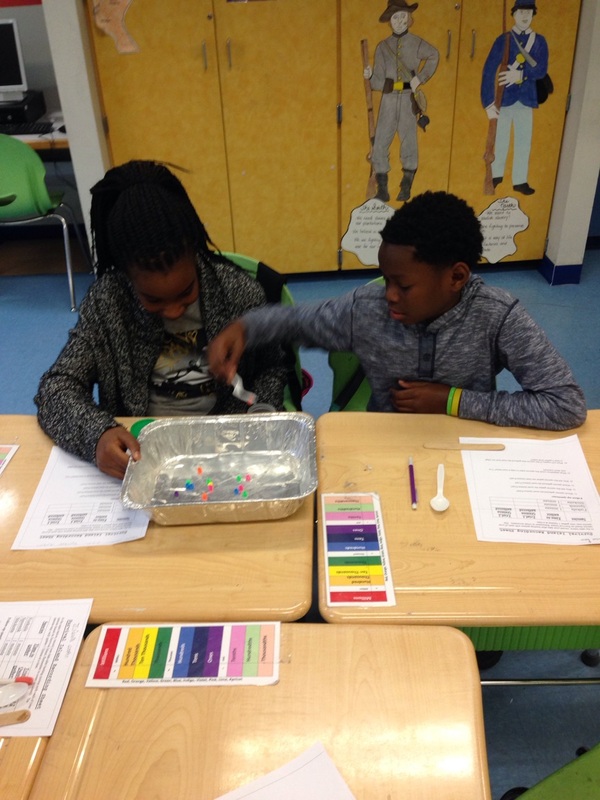 They modeled the sun, eight planets and Earth’s moon, as well as two other features to include in their project: the asteroid belt, a comet, a meteor or constellation. 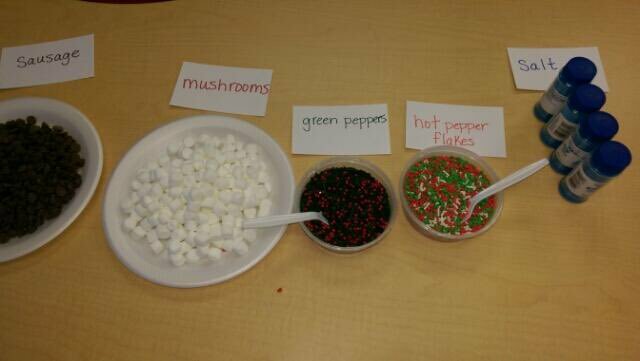 Does Halloween “matter”? 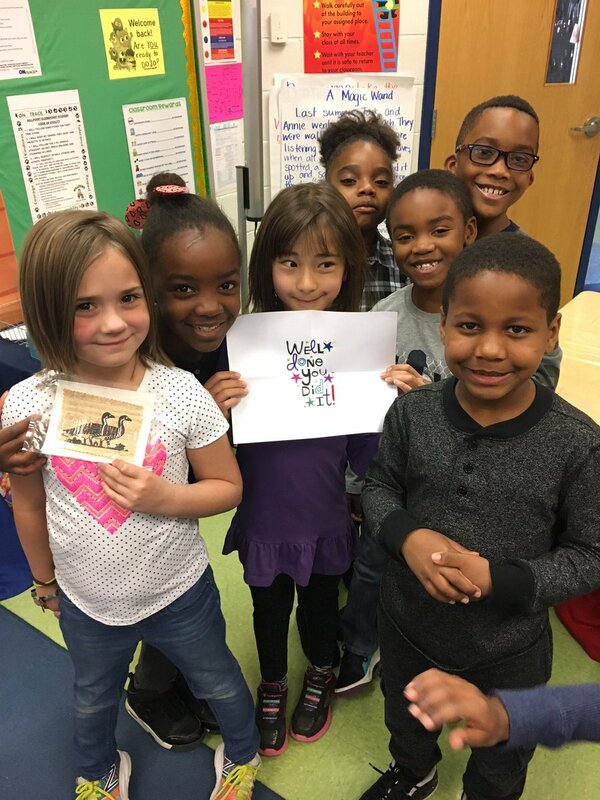 Third graders at Hillpoint say YES. 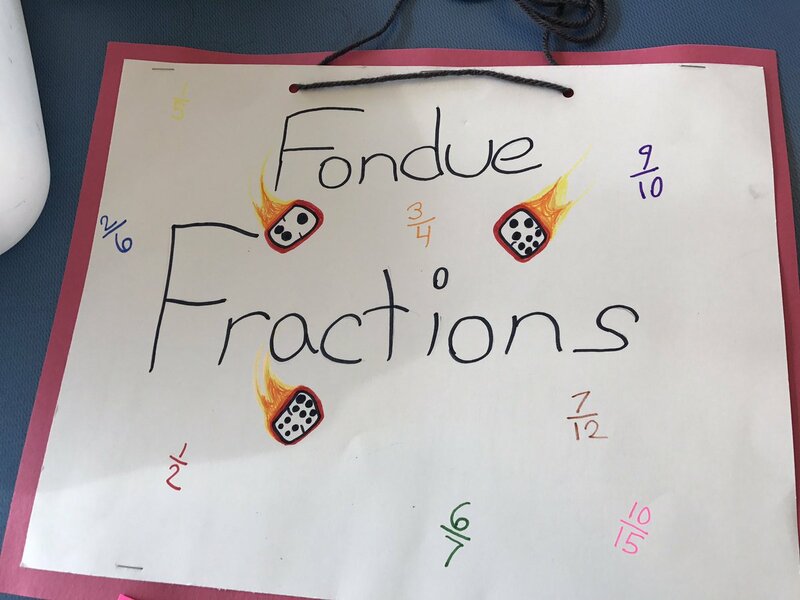 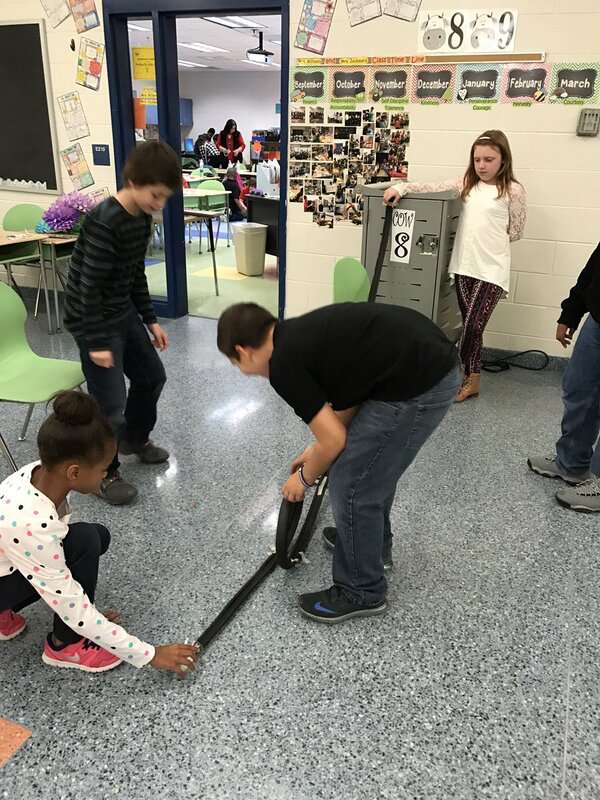 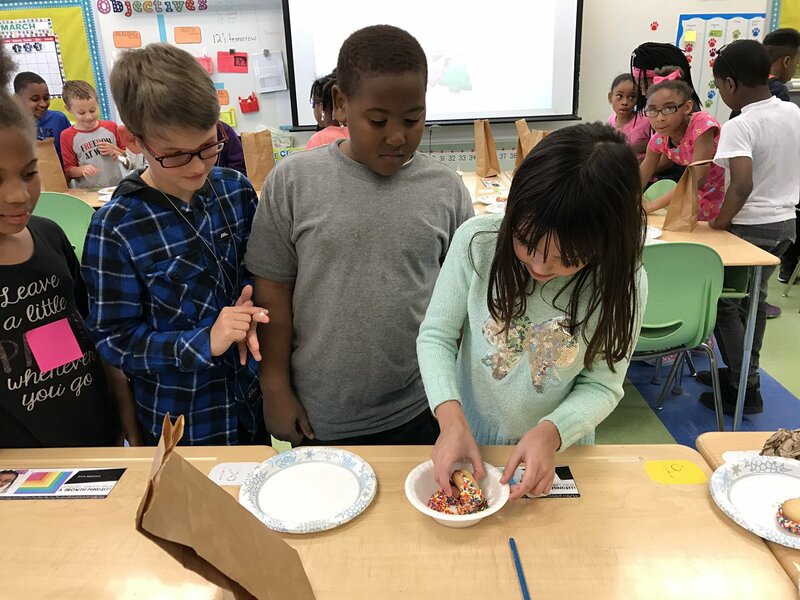 The students rotated through 8 stations—each one containing a Halloween-related item–and described the physical properties of each solid object. 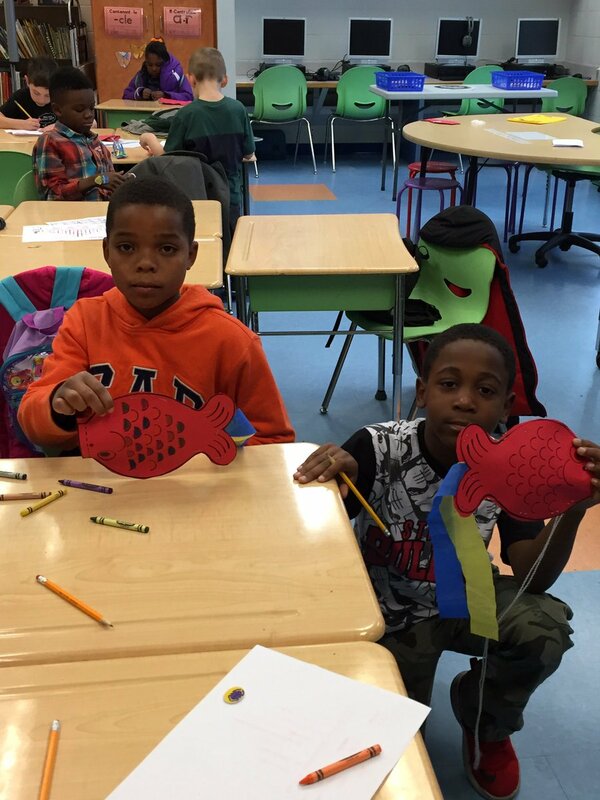 Hillpoint Elementary School third-graders transformed pumpkins into their favorite storybook characters as an extension of their written book report. 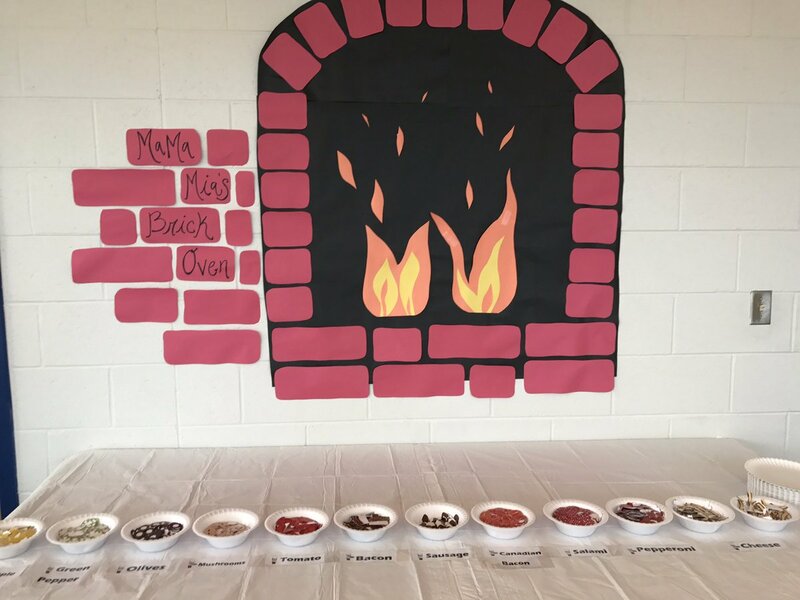 Come visit the display inside the school. 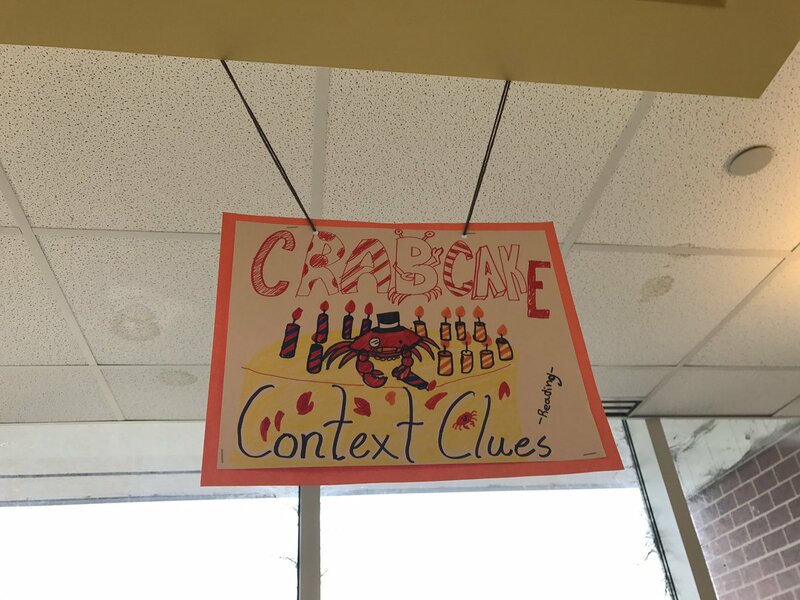 Ahoy mateys! 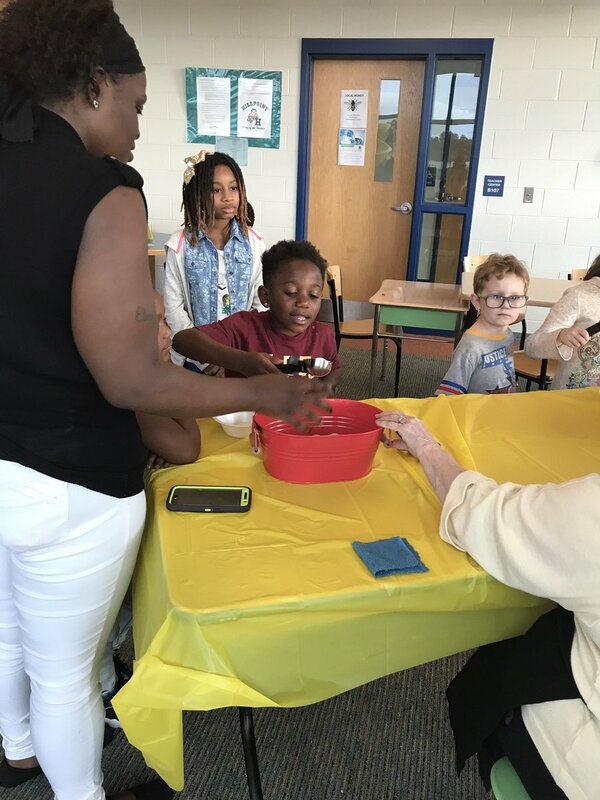 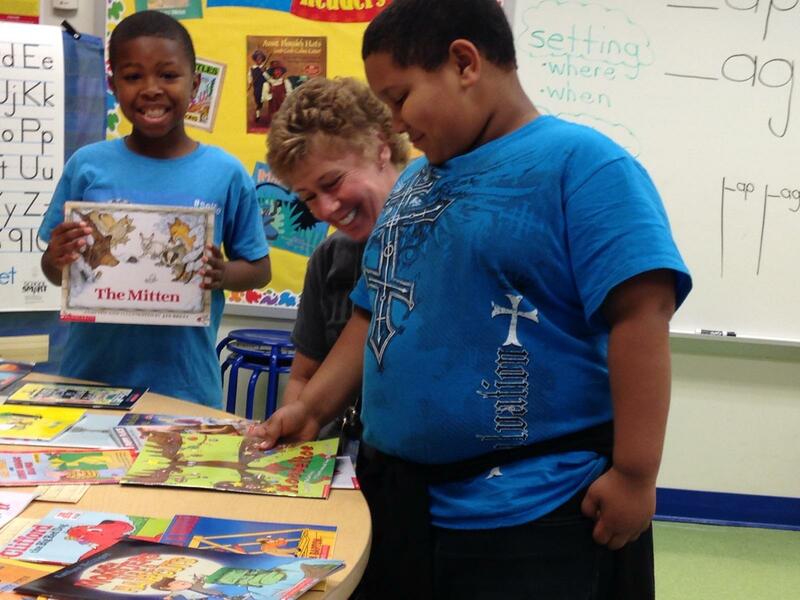 Ms. McCloud helps our huskies get ready for a treasure chest full of book booty! 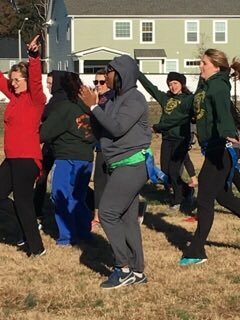 Hillpoint teachers turned out for a weekend of learning together! 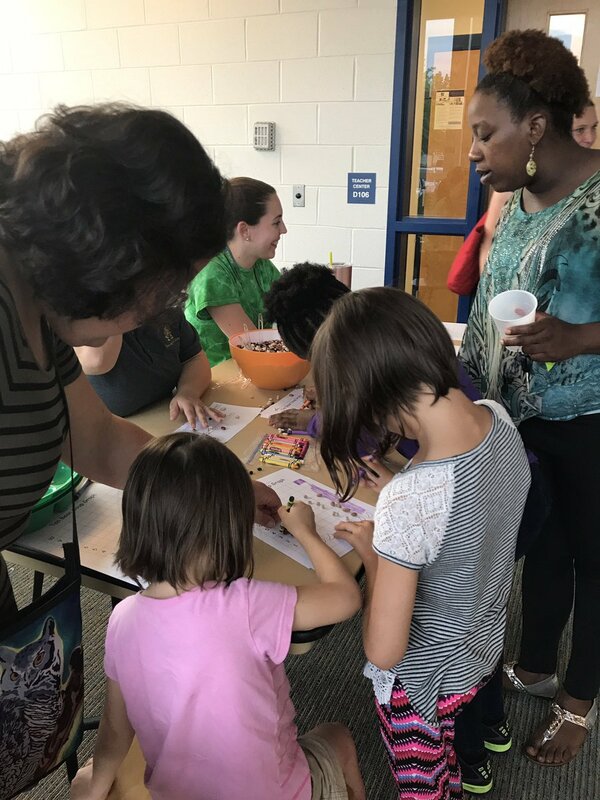 Thank you to all of our amazing grandparents and family members who came out to see our Huskies during Grandparents Week! 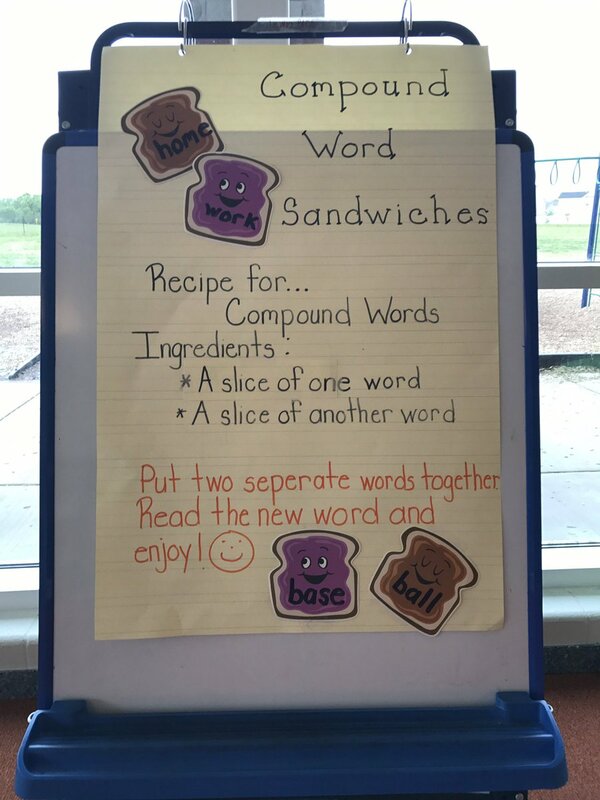 We had tea, ate lunch, learned together! 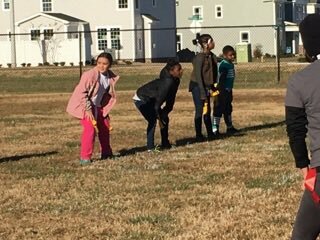 Thank you to our Navy friends for coming out to help and support our Huskies! 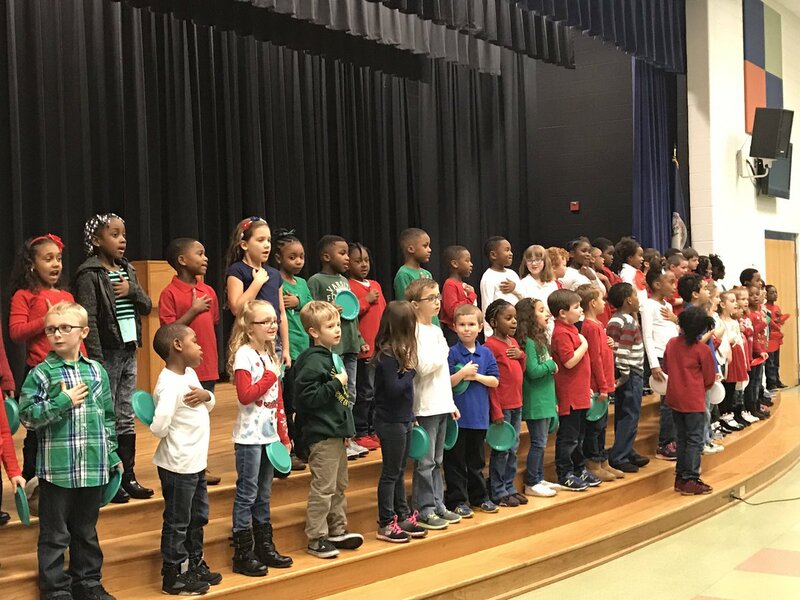 4th grade students sang the Star Spangled Banner and a Christopher Columbus song at PTA on October 11. 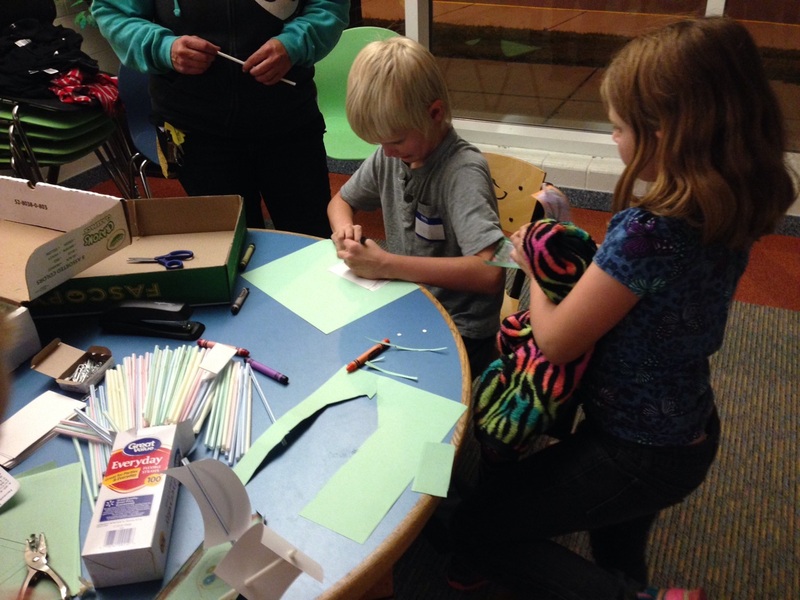 Thanks to our new business partners, Bronco Federal Credit Union for donating school supplies! 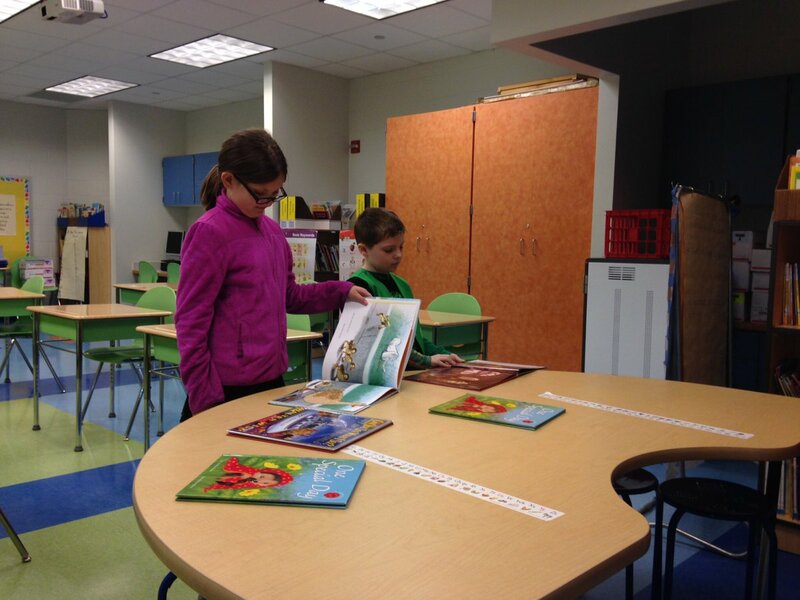 Students are engaged in read alouds, vocabulary building, and independent reading at the end of the day! 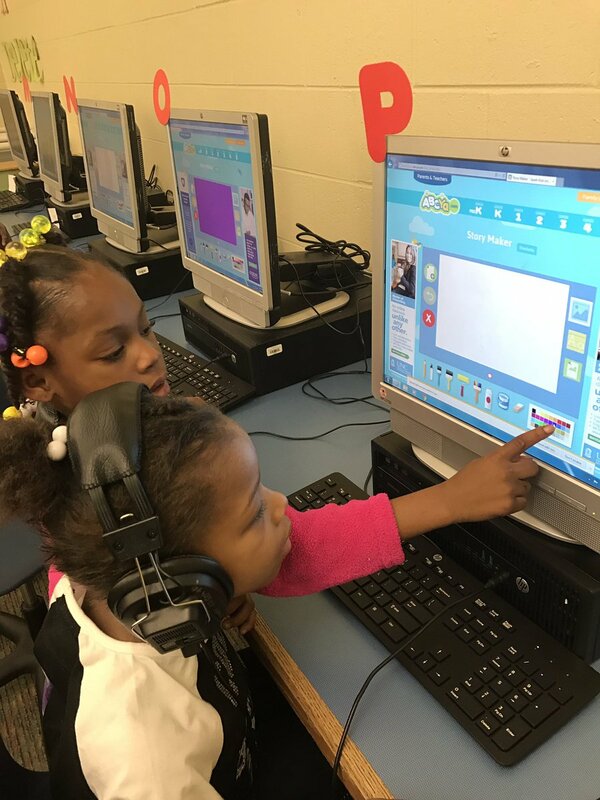 Kindergarten students are engaged in reading and learning about literacy stations! 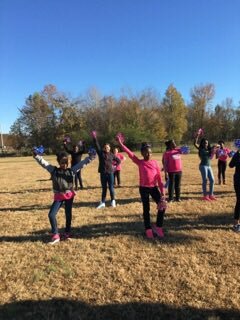 20 3rd-5th grade girls are participating in Girls on the Run for the first year at Hillpoint Elementary. 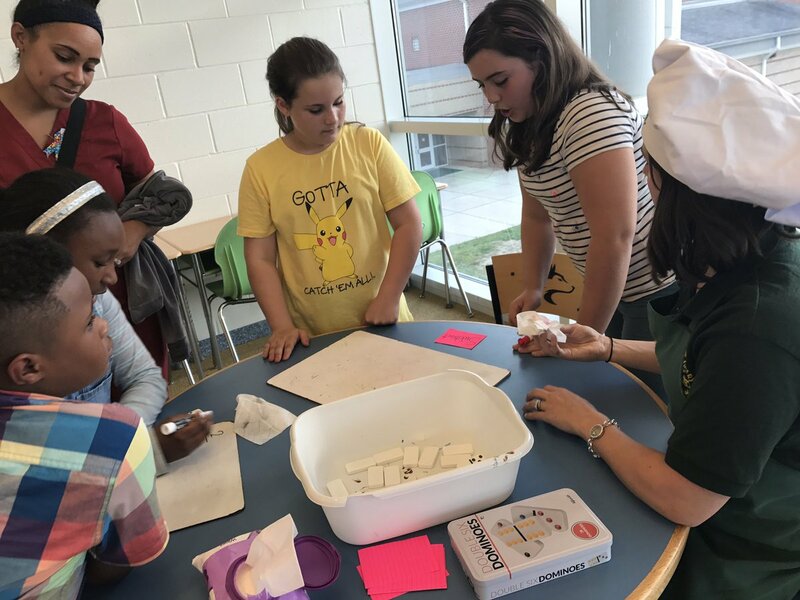 Girls are learning skills such as problem solving, positive self talk, managing emotions and getting the opportunity to build self esteem through running. 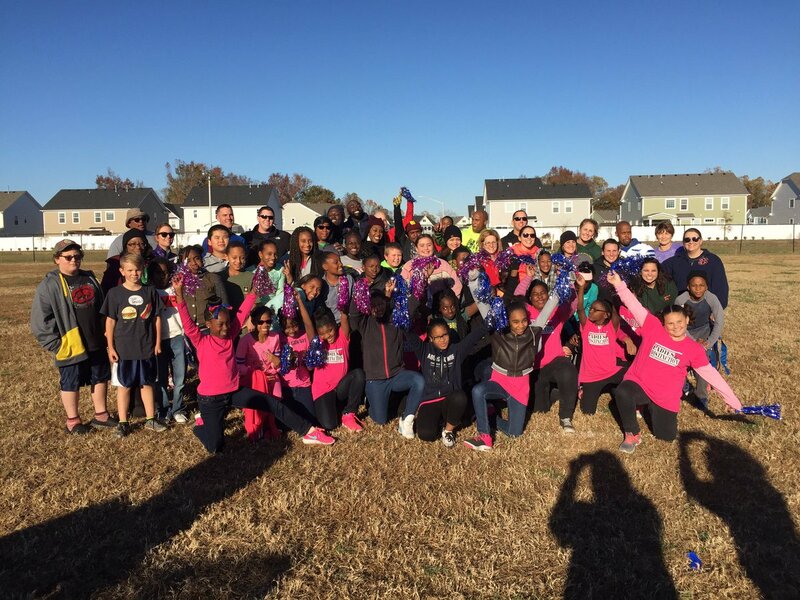 A culminating 5k will be run in December. 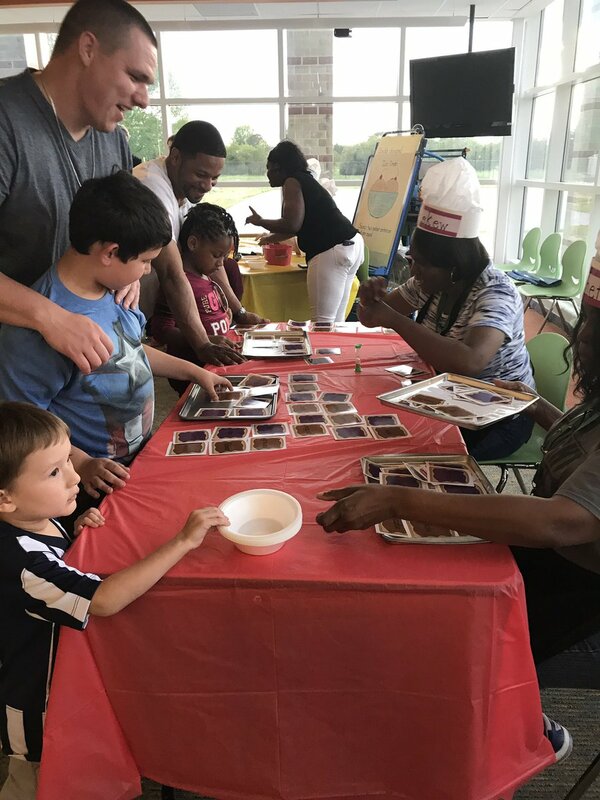 The HES staff got together for a back to school bonding experience full of food and fun! 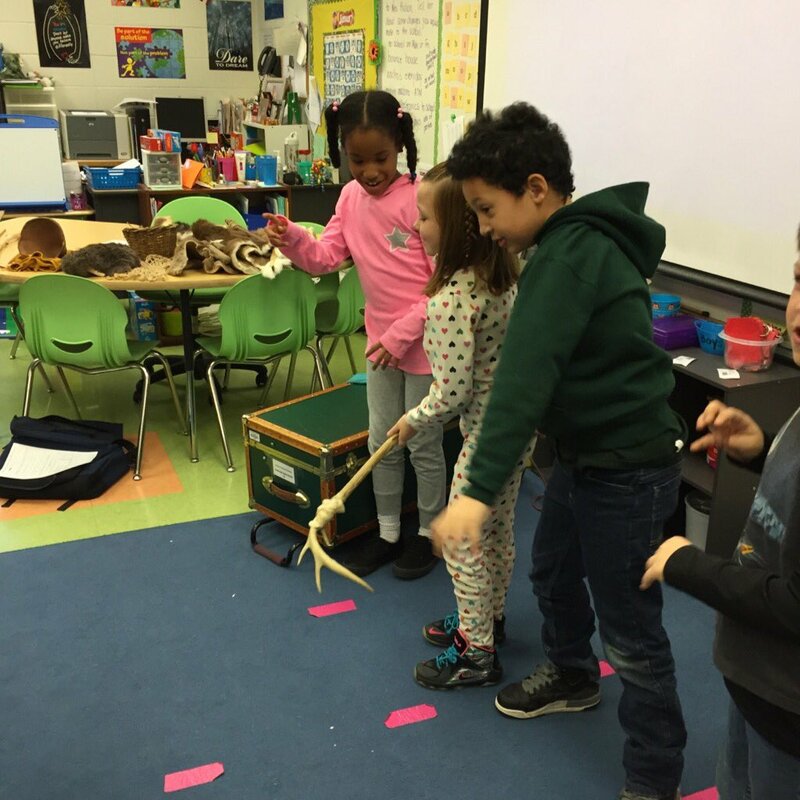 We played a fun game about music, partnership, and cooperation. 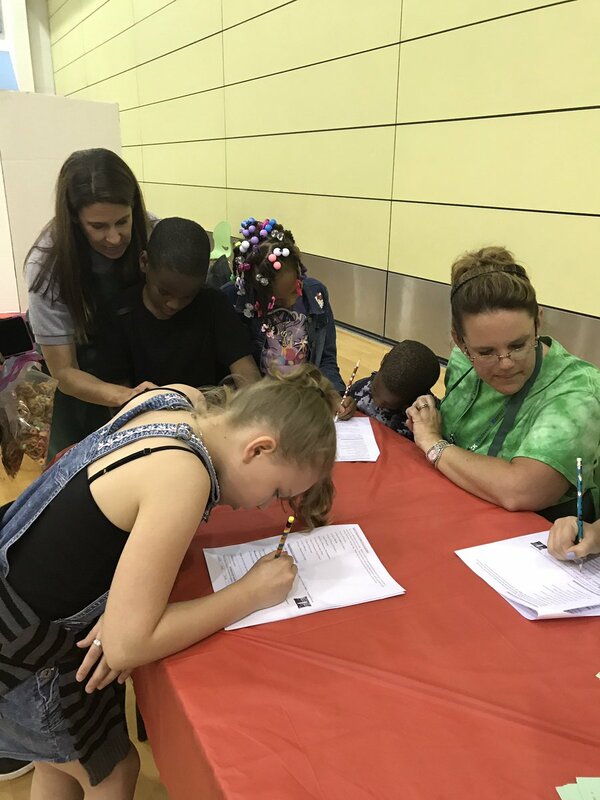 Hillpoint Elementary would like give a big shout out and thank you to our partner in education, Quality Distribution, for donating 138 backpacks filled with school supplies for all of our first grade Huskies! 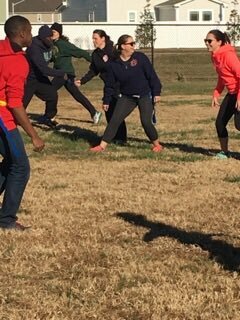 The HES staff got together for a game of amazing race. 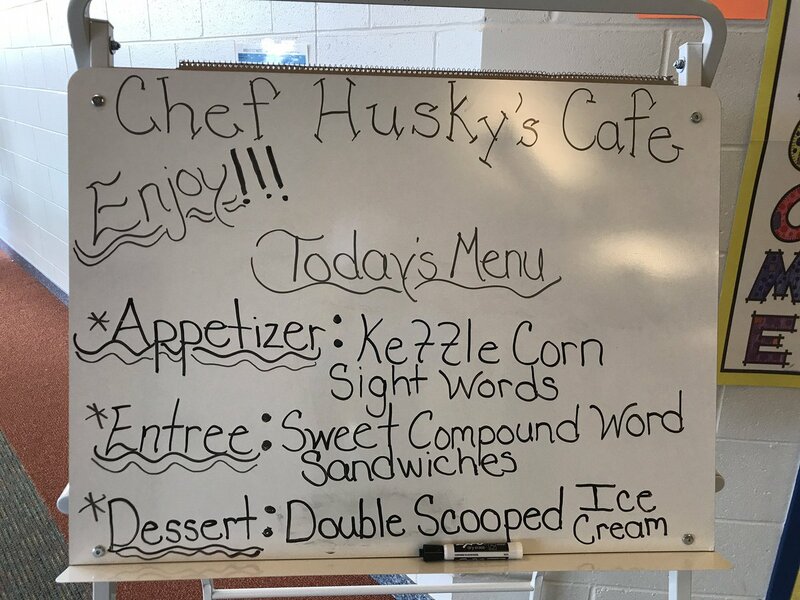 We got to learn about where all of our amazing Husky family lives, explore Suffolk, and learn about the power of teamwork!